After a week in Armenia and Calarca, it was time to get moving. I dropped down to Cali in the flat plains for two days. 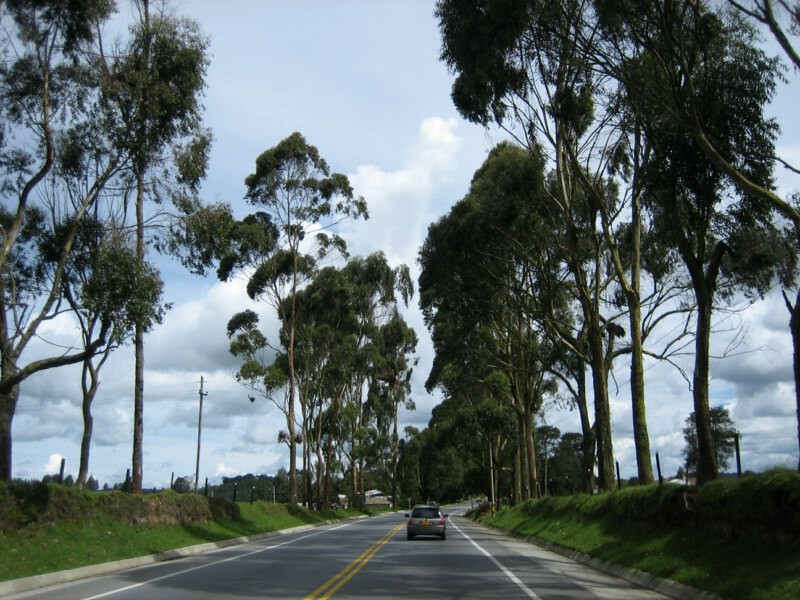 From there, I headed up to colonial Popayán and then to high-altitude Pasto and its stunning scenery. 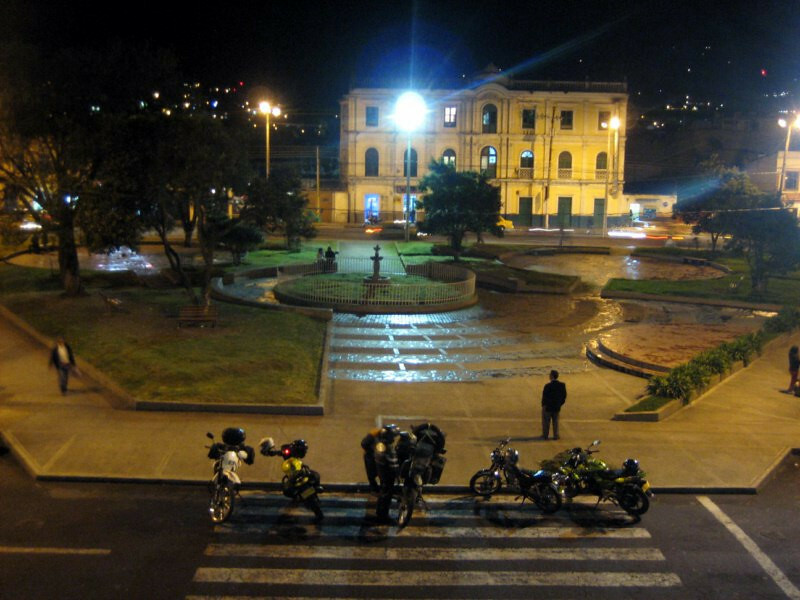 I was welcomed and hosted by local bikers in each city. 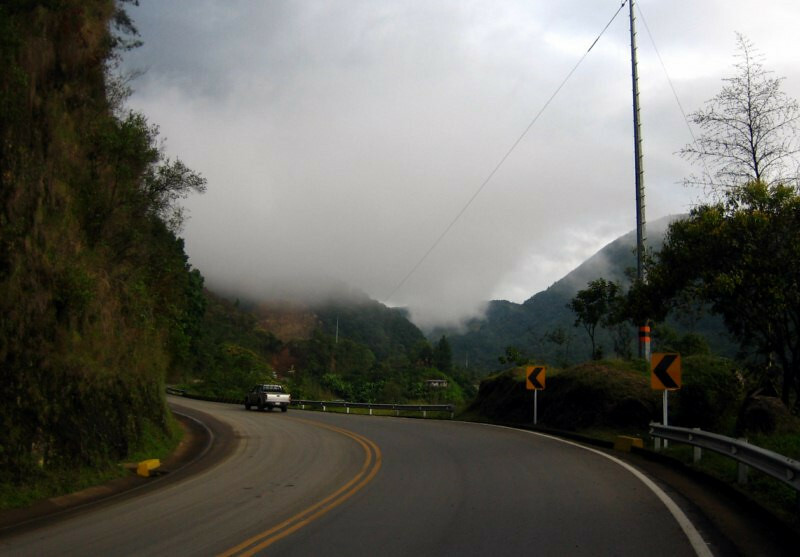 The road descends slowly down to about 1,000 m (3,330 ft) and then becomes a flat 4-lane highway heading to Cali, the third largest city in Colombia. Sugar cane fields with the Cordillera Central rising at the eastern edge of the plain. Massive four trailer trucks used for hauling the bulky sugar cane from the fields to the sugar mills. Stopping under a bridge with fellow bikers to suit up for the rain ahead in the city. 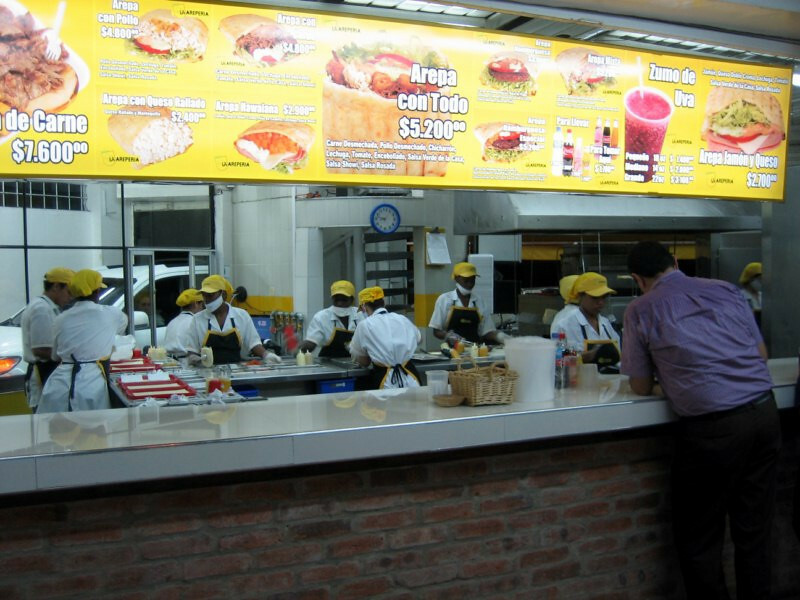 My host, Henry Morales from TouringColombia.com buying dinner at an arepa fast food joint. There’s even a drive through. Arepa stuffed with beef and veggies, served with a corn meal drink called Claro, which is funny since it’s the opposite of clear. It comes with some honey but wasn’t enough flavoring for me, tasted quite bland. 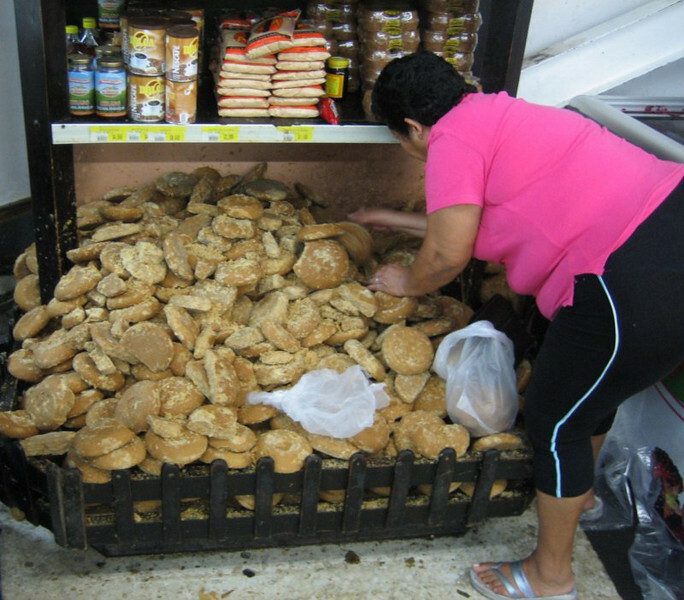 All that sugar cane is processed into Panela, which is an unrefined solid piece of sugar made from evaporation of sugar cane juice. 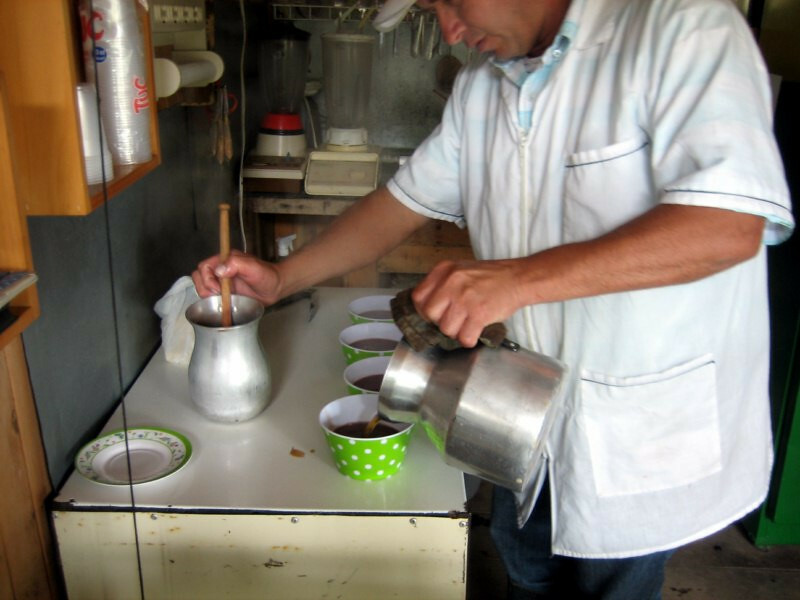 It’s big business in Colombia and is mainly used in aguapanela, a drink made by dissolving some panela in water and is widely consumed here. Besides sugar, it also contains good amounts of protein, calcium, iron and ascorbic acid. 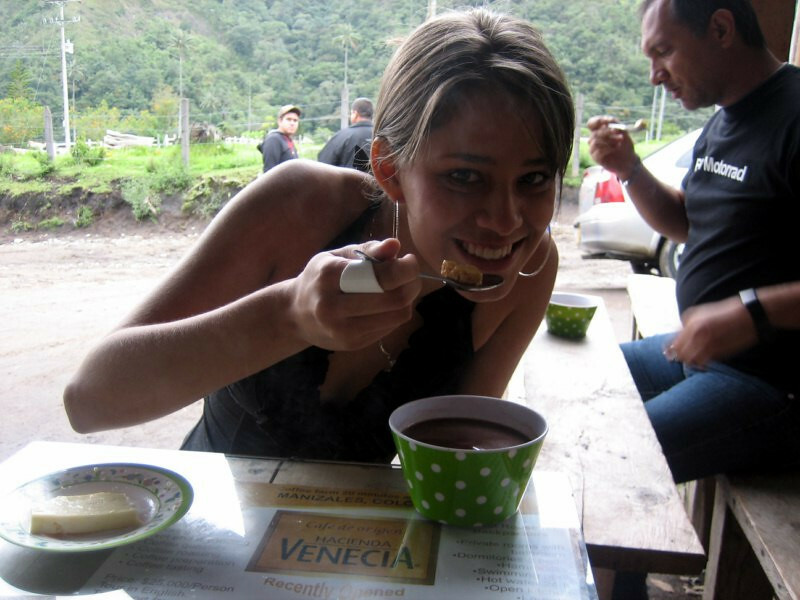 Cyclists in Colombia (a very popular sport here) usually chew on a small piece of panela for a dose of energy and aguapanela is said to have as many rehydrating minerals as Gatorade. It’s also popular in India, under the name of Jaggery. 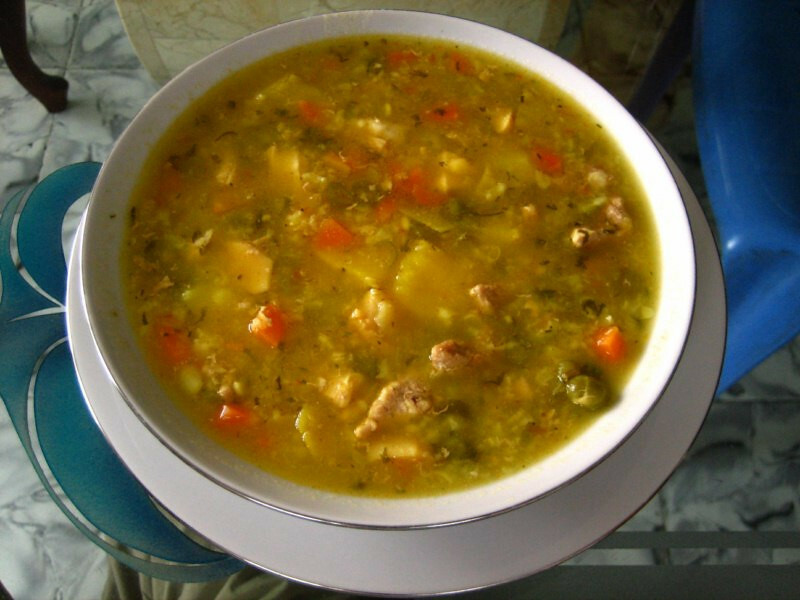 Having lunch the next day at Henry’s parent’s house of Sancocho de Mondongo, a hearty soup made with beef and pig intestines and yuca and veggies. 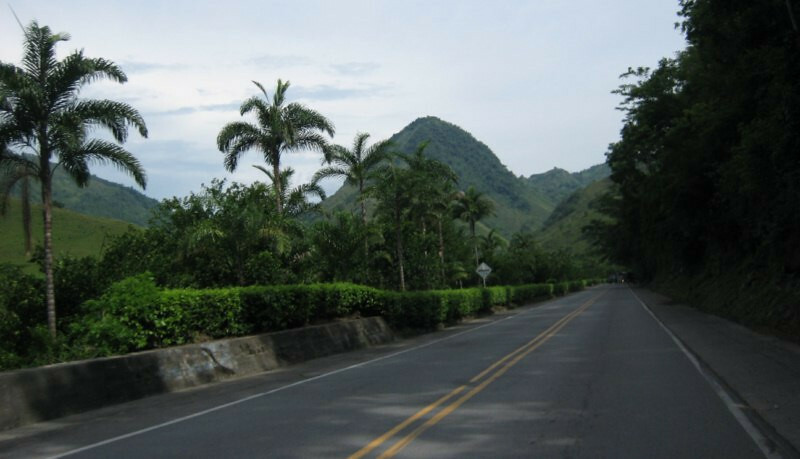 View of downtown Cali looking north at the flat plains where all the sugar cane is grown. 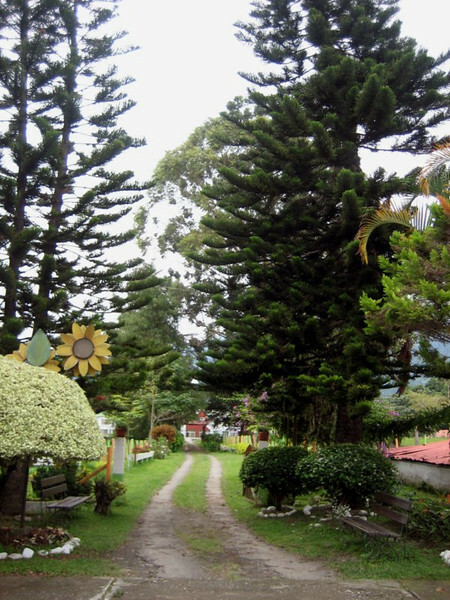 While Cali is generally flat, it is still quite hilly since it lies at the foothills of the Cordillera Occidental. 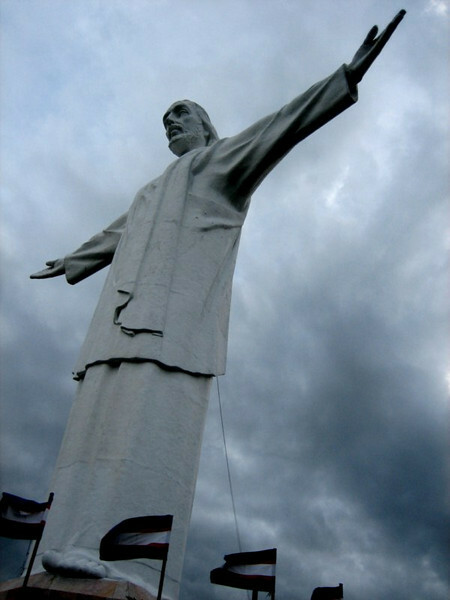 Getting the nice view of the city from the Cristo Rey site, a 31 m (100 ft) tall statue of Christ with open arms, similar to Cristo de Corcovado in Rio de Janeiro. Henry was a great host in Cali. 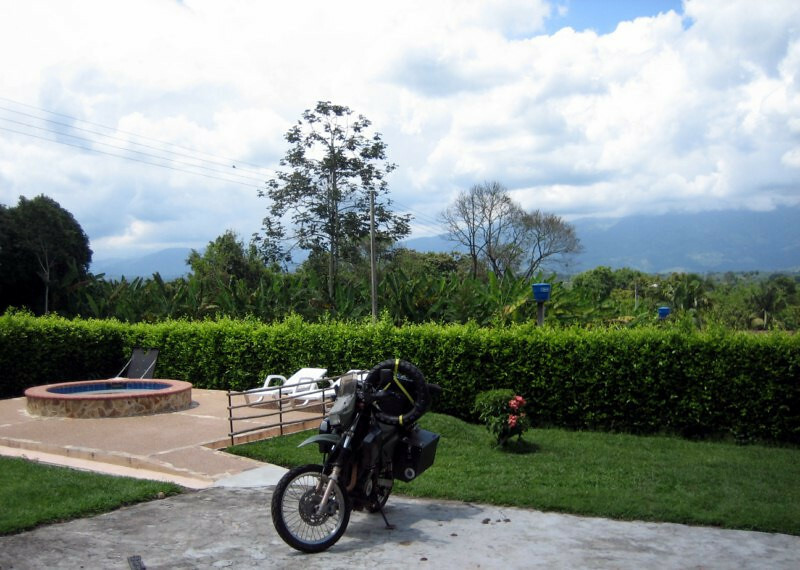 He rides a V-Strom and is getting ready to do a 3 month tour of South America starting in October. 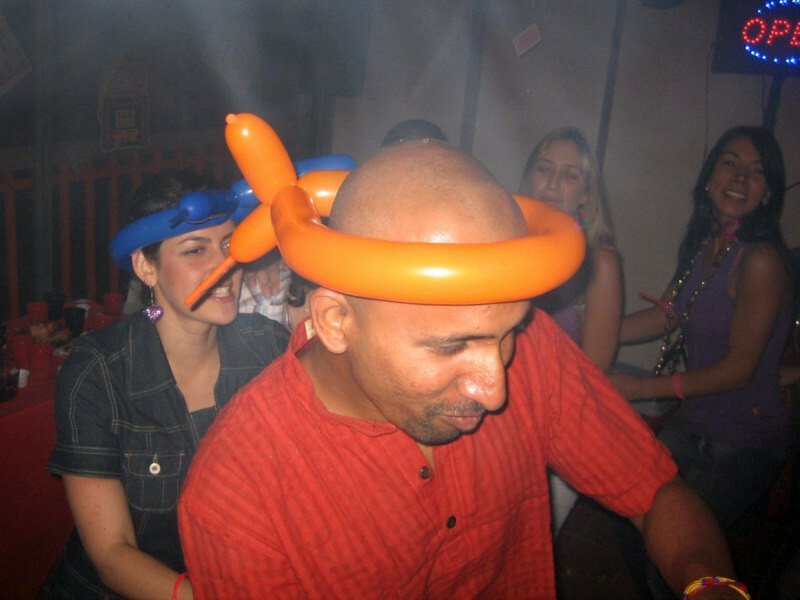 He works as an accountant and also manages a super market. 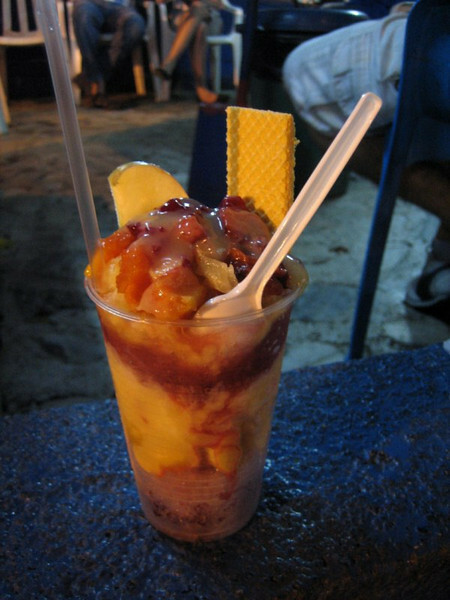 Getting a cholado, a Cali specialty drink of fruit with condensed milk on ice with a wafer; was quite refreshing. 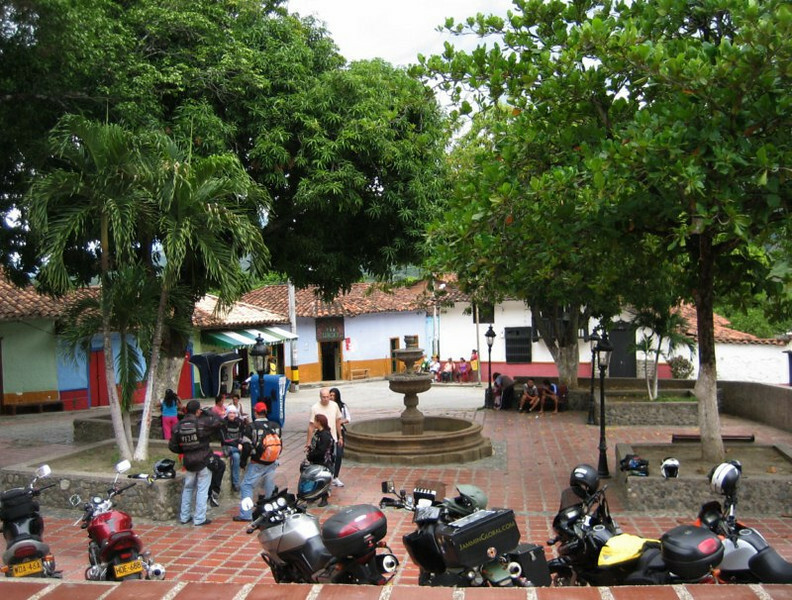 On a tour of the city, we stopped by the Parque del Perro (dog park), which is a popular hang out for motorcyclists and other young adults with restaurants and bars around. 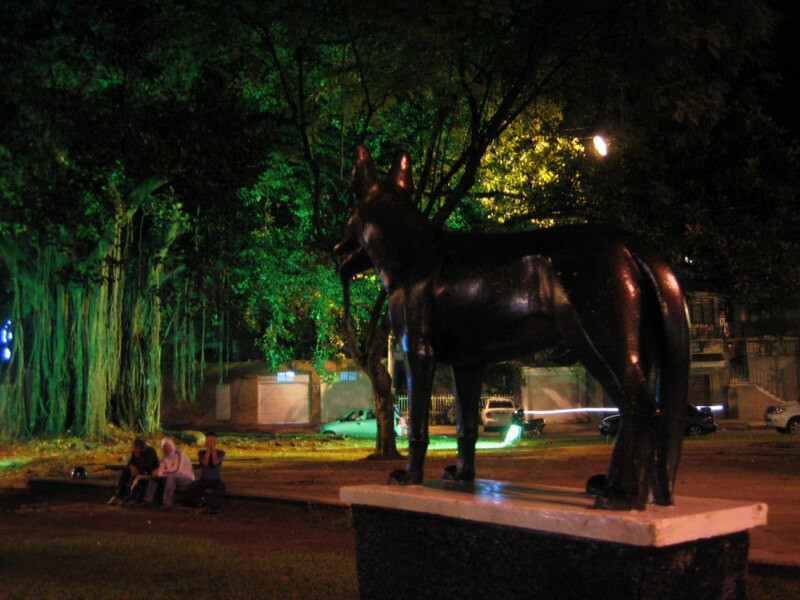 It gets its name from this statue of a dog but it’s not really a dog park as one might think of in the States where dogs are allowed to run free. 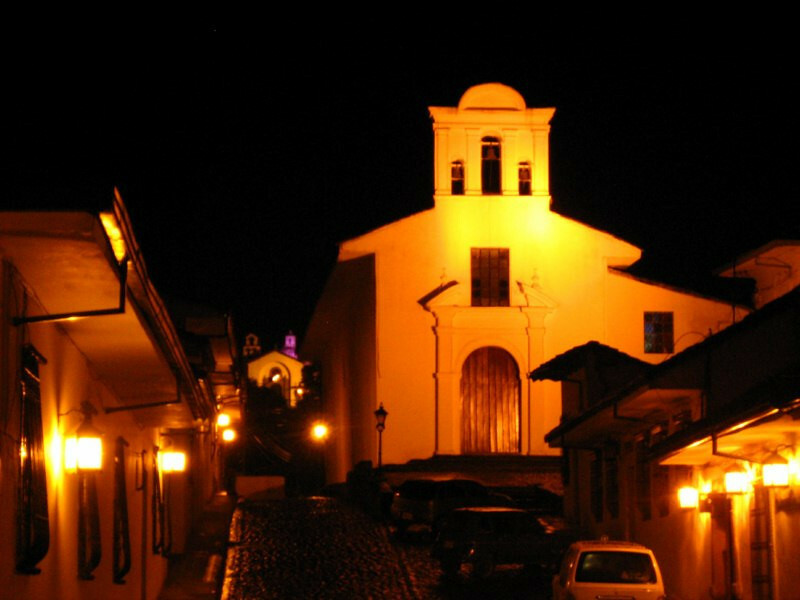 Iglesia de San Antonio in the oldest neighborhood in the city, located on a hill with a pleasing park leading up to the church. 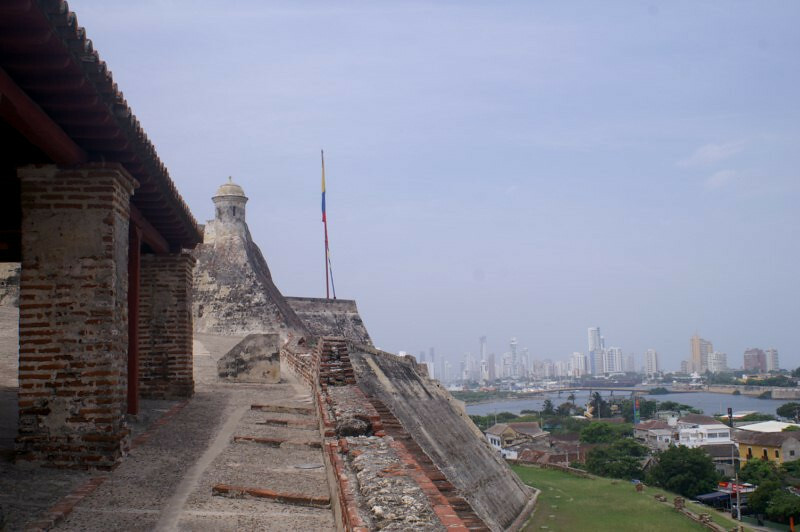 View of downtown Cali from the Iglesia de San Antonio. 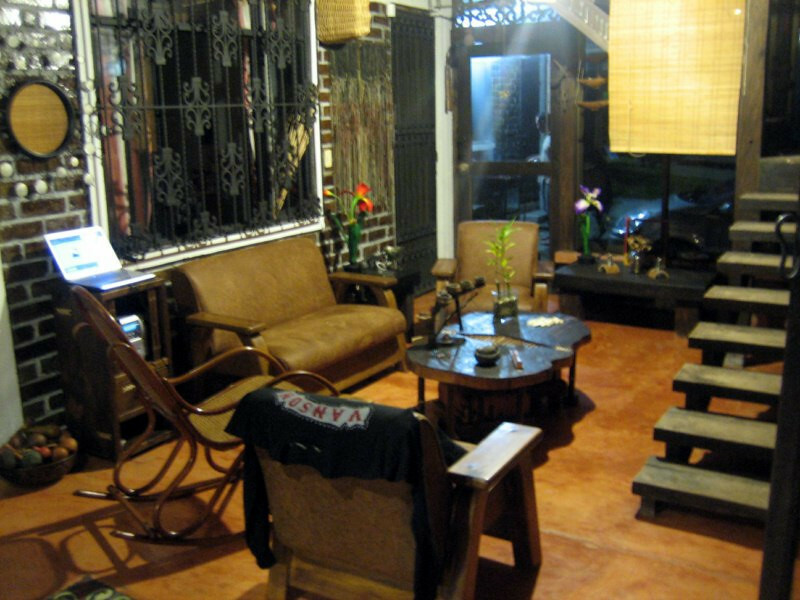 Some free spirits were hanging about, playing soft guitar music and creating a nice ambiance. 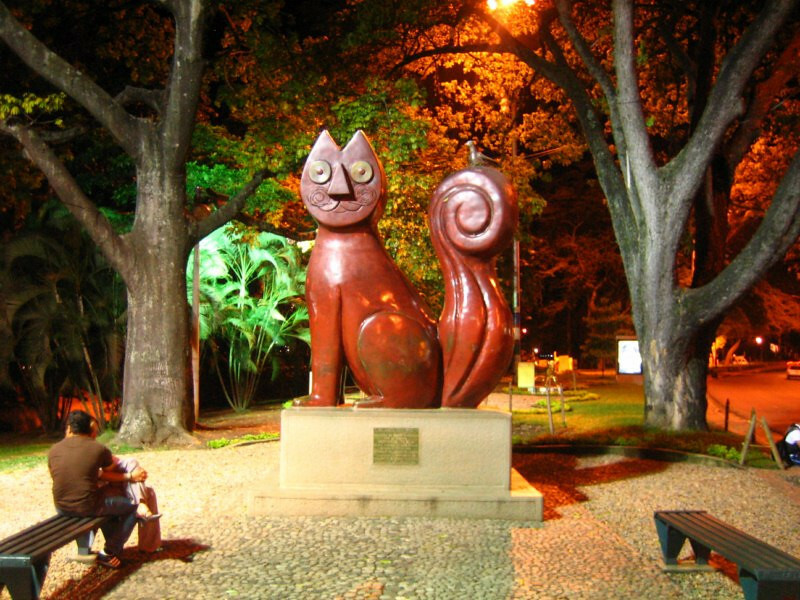 Along with the dog park, there’s a Parque del Gato (cat park) located on the Cali River, a peaceful part of the city. 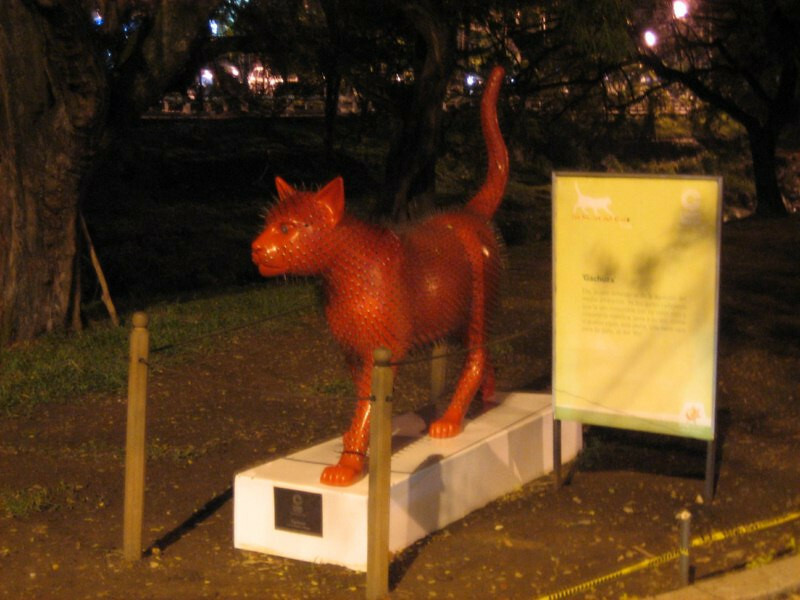 There were various sculptures of cats, each dressed up in a funky way. 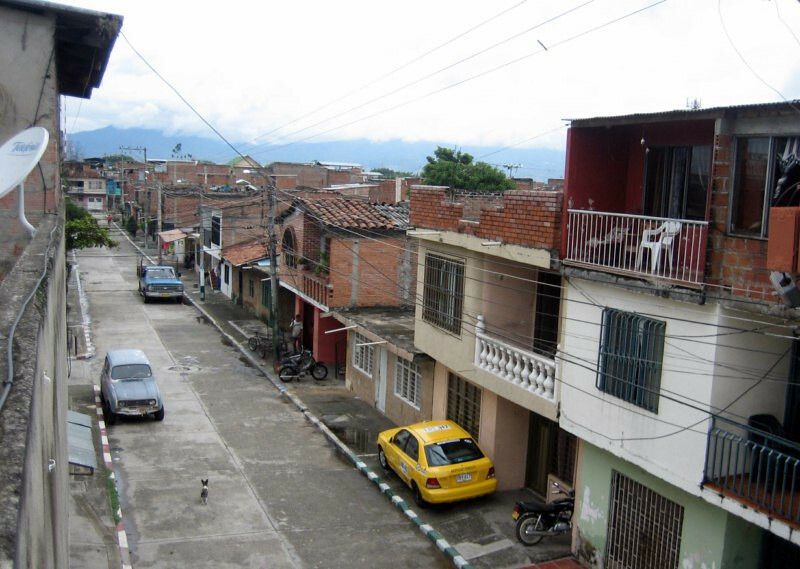 The working class neighborhood of Henry’s parent’s house, where I was having lunch before heading out for Popayán. 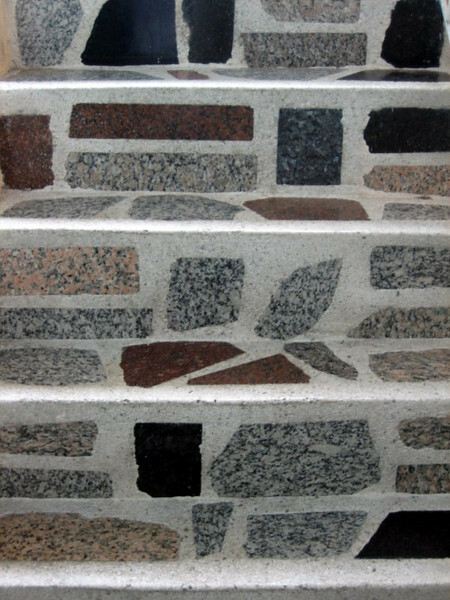 Mosaiced steps leading up to the terrace. 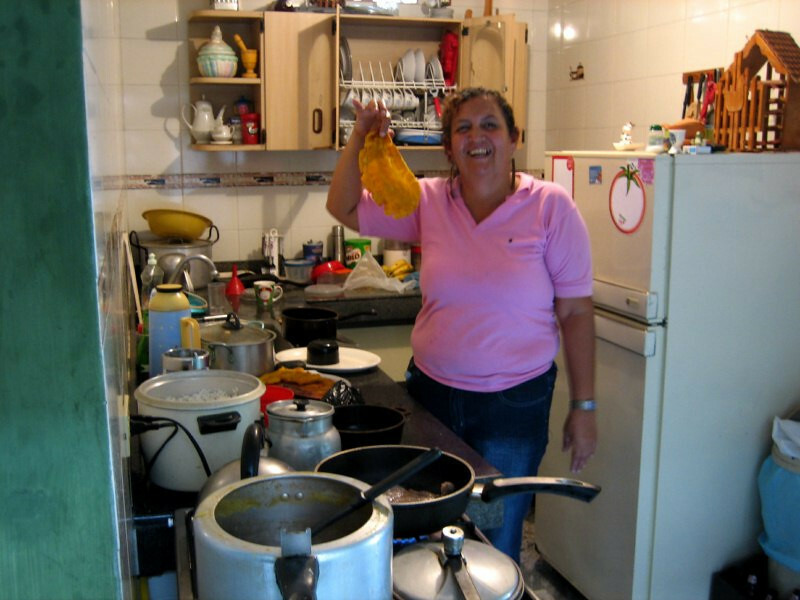 Henry’s wonderful mother making huge patacones for me after seeing that I liked them the previous day. They asked a lot of questions about India the previous day and people generally want to find out what food is eaten in other cultures and I told them we eat a lot of rice with lentils (dahl) and so Henry’s mother made lentil soup here. So gracious of her. 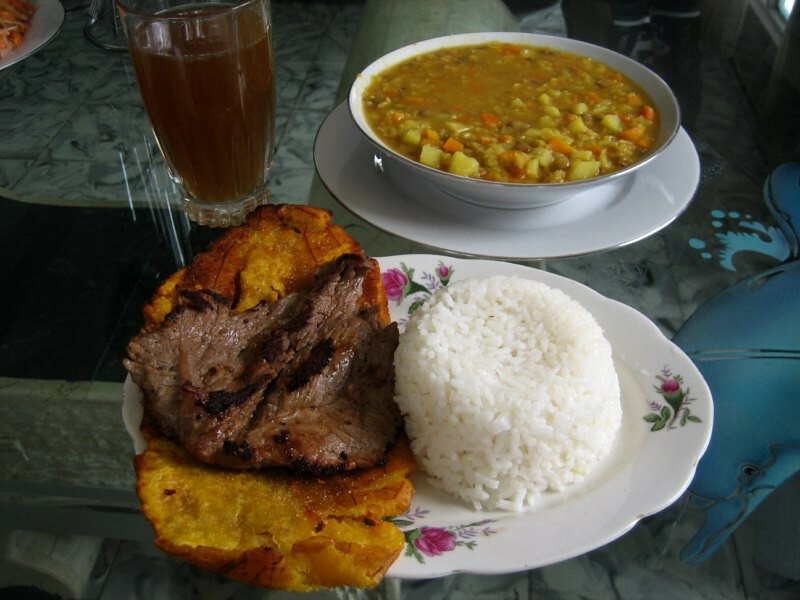 Along with that was rice with steak and huge patacones served with aguapanela. She even wrapped some extra patacones for me to snack on while on the road. 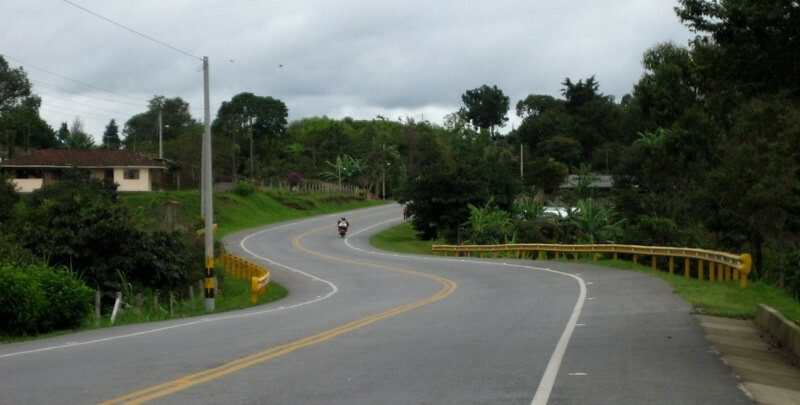 Heading up to Popayán, about 140 kms (85 miles) away. Nice twisty roads climbing back up the mountains. 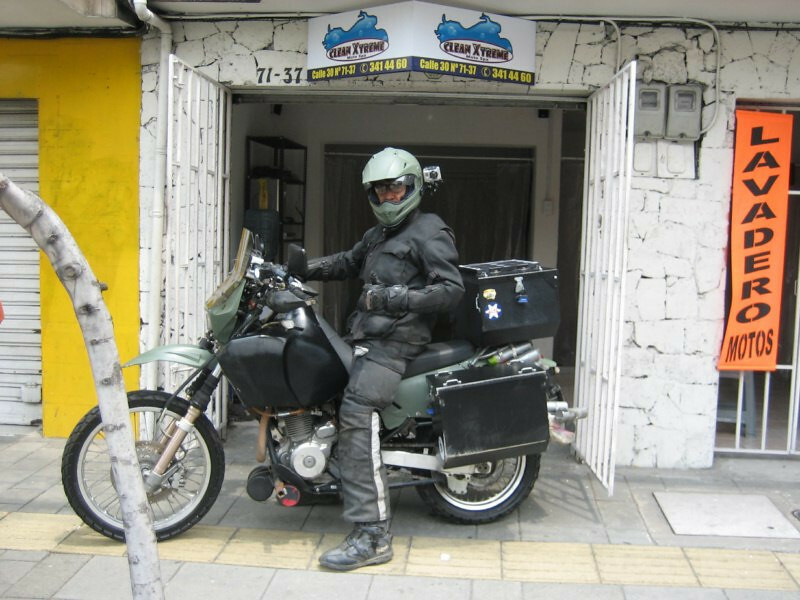 Meeting up with Fernando Alarcon in Popayán, a friend of Jorge Peto in Armenia, at his brother’s motorcycle accessory shop. 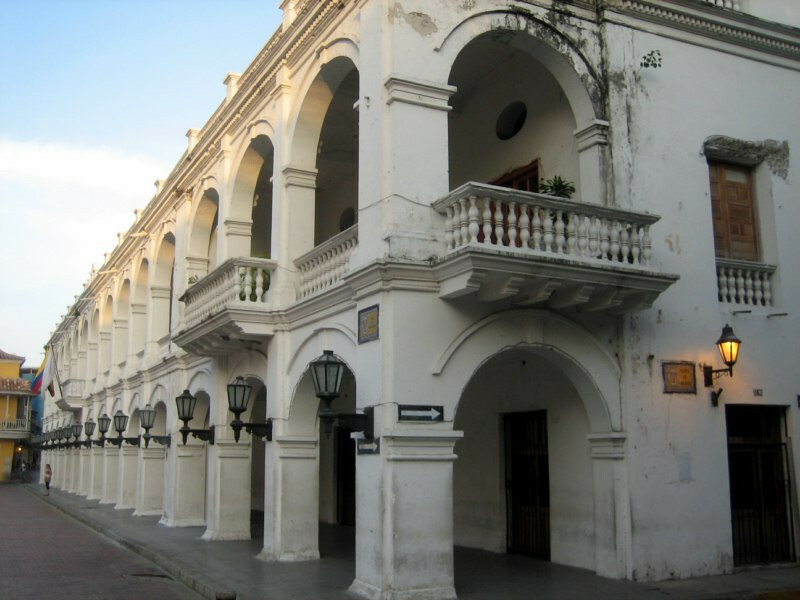 Getting a tour of the colonial architecture of Popayán. 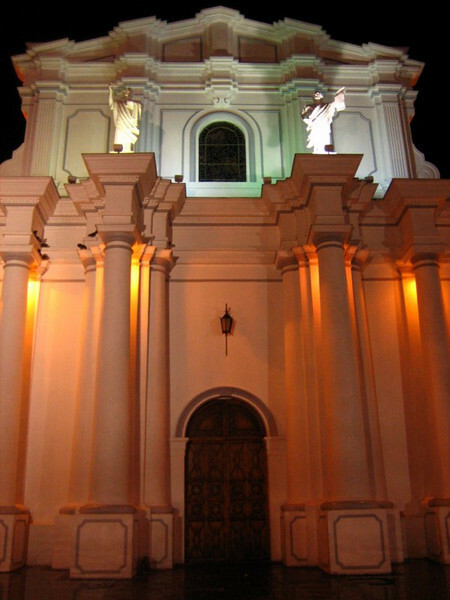 Iglesia de San Francisco, considered the best example of baroque style throughout Colombia along with a monument to local hero, Camilo Torres. 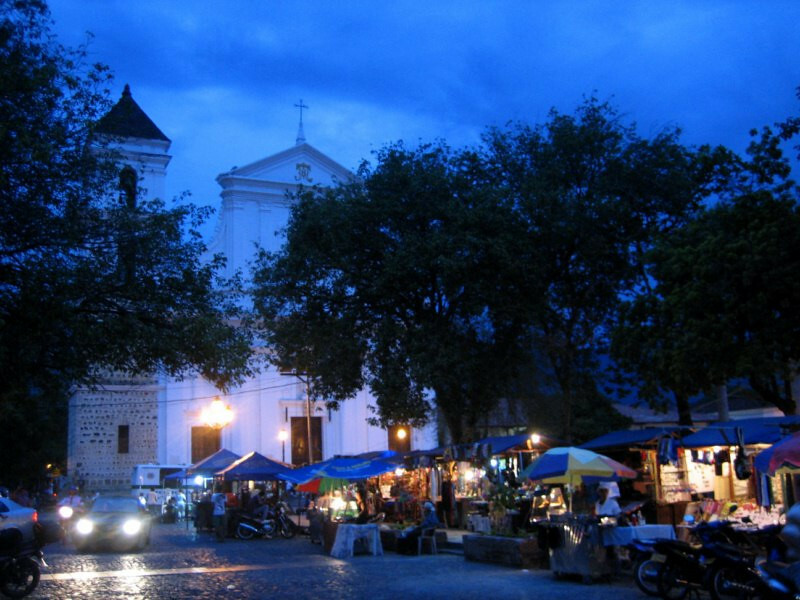 The handsome cathedral in the central Parque Caldas. 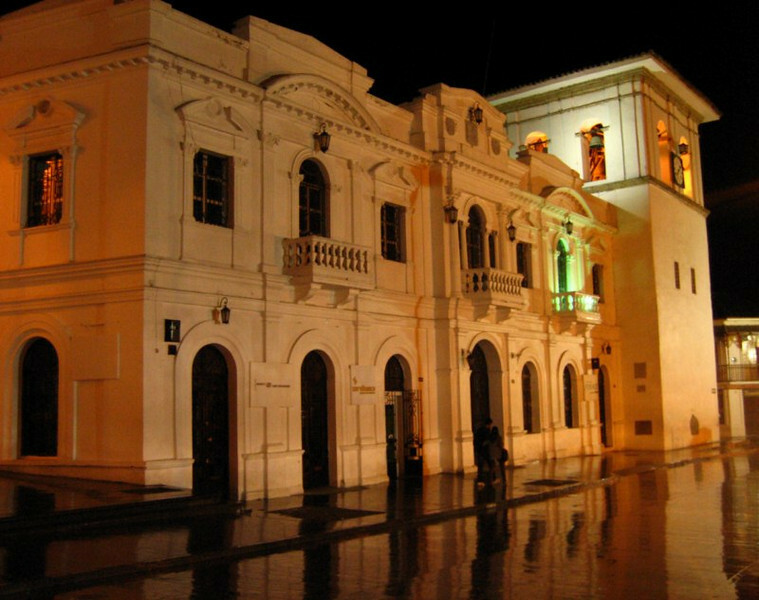 Popayán was founded in 1537 and was an important political and cultural center. All its fabulous architecture was destroyed in an earthquake in 1983 and since then all the major buildings have been restored. 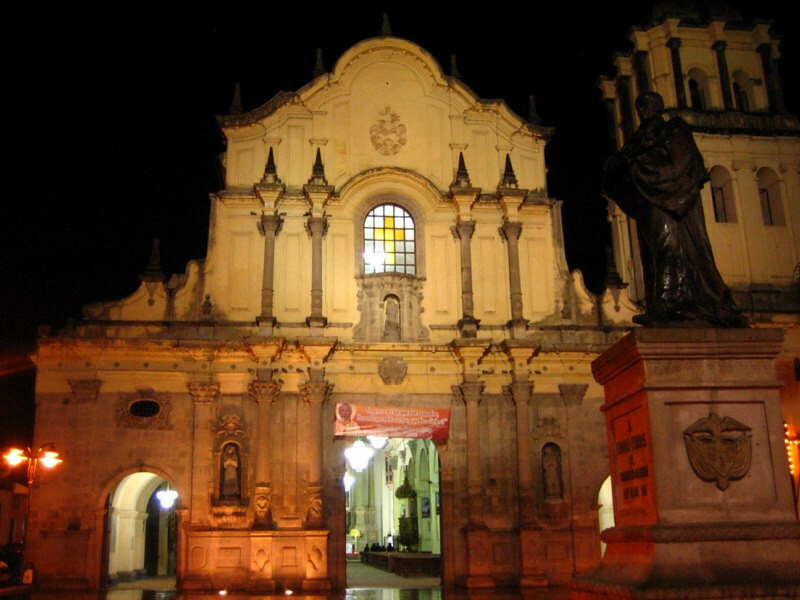 The facade of the Catedral Basílica Nuestra Señora de la Asunción. 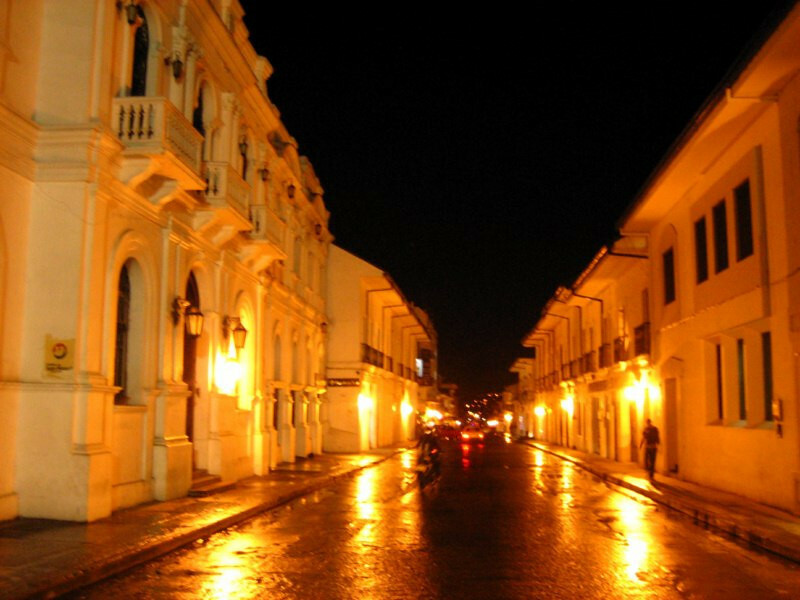 The white-washed buildings reflecting in the wet pavement. 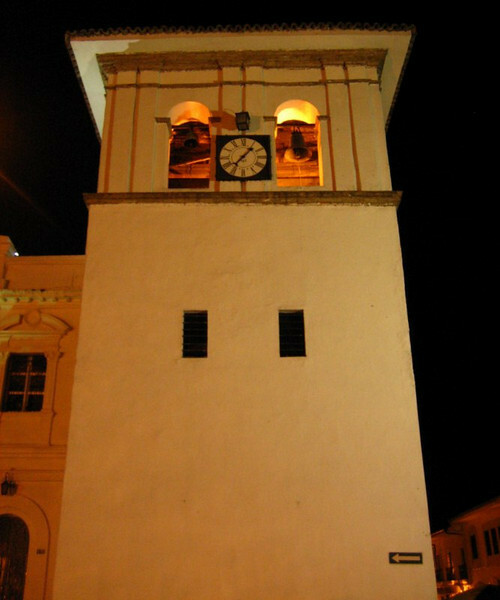 The main symbol of Popayán, the clock tower, dubbed the ‘nose of Popayán,’ built in 1682. 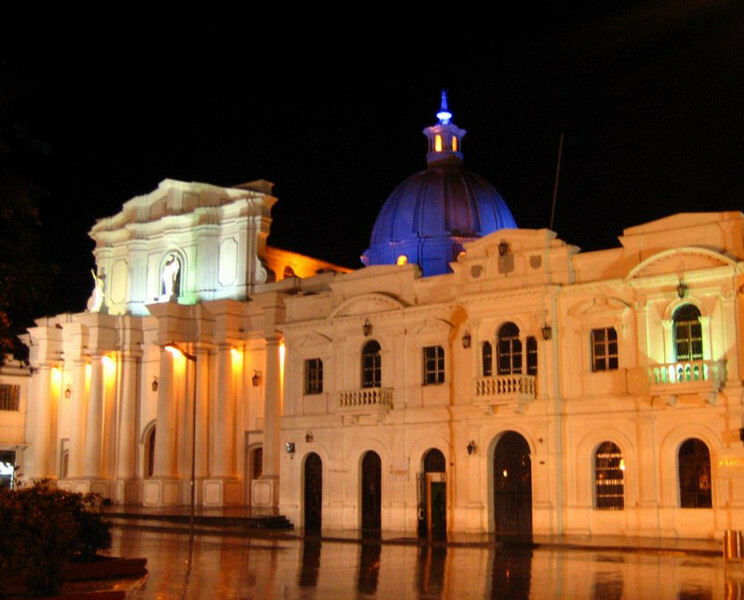 What’s special about Popayán is that all the buildings are painted white. 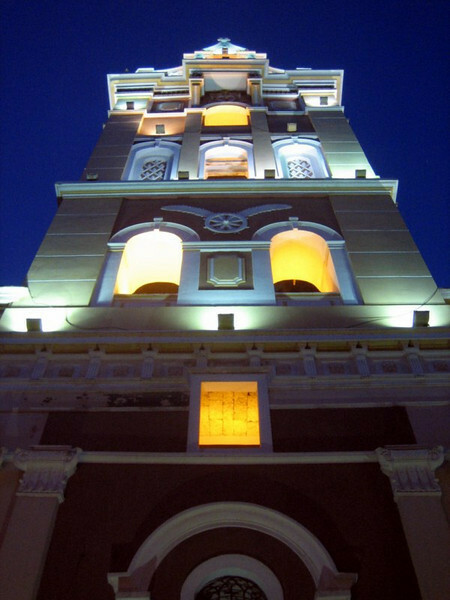 Iglesia de la Encarnacion and Iglesia La Ermita in the back with the purple lighting. 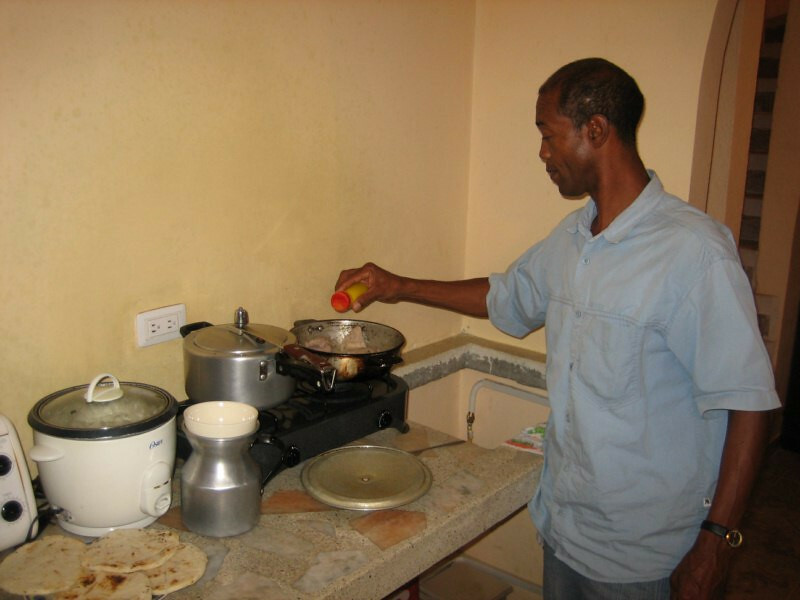 Fernando has a few pizzerias around town and also runs a few hotels. 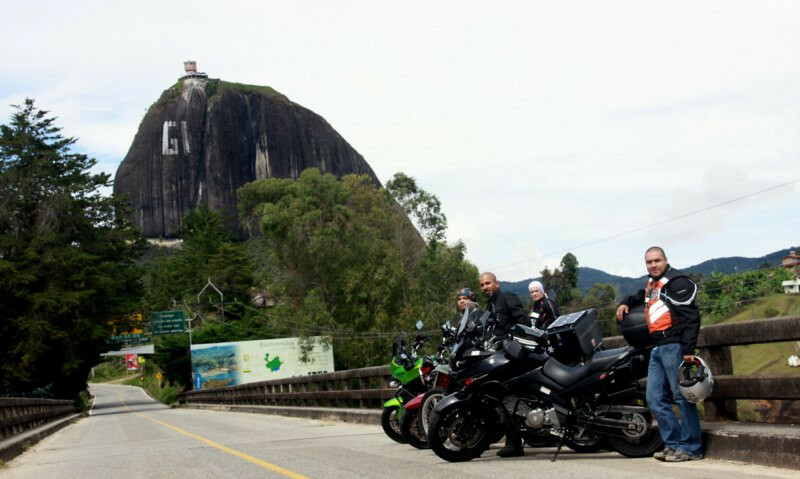 He, too, rides a V-Strom and went on a month long tour of the Mediterranean coast of Europe. 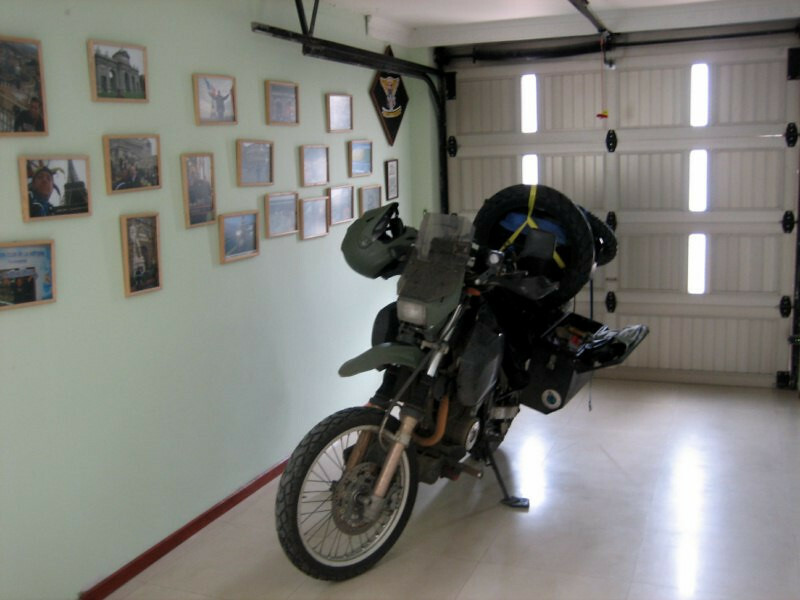 sanDRina in Fernando’s garage that opens up into his living room, nicely setup. 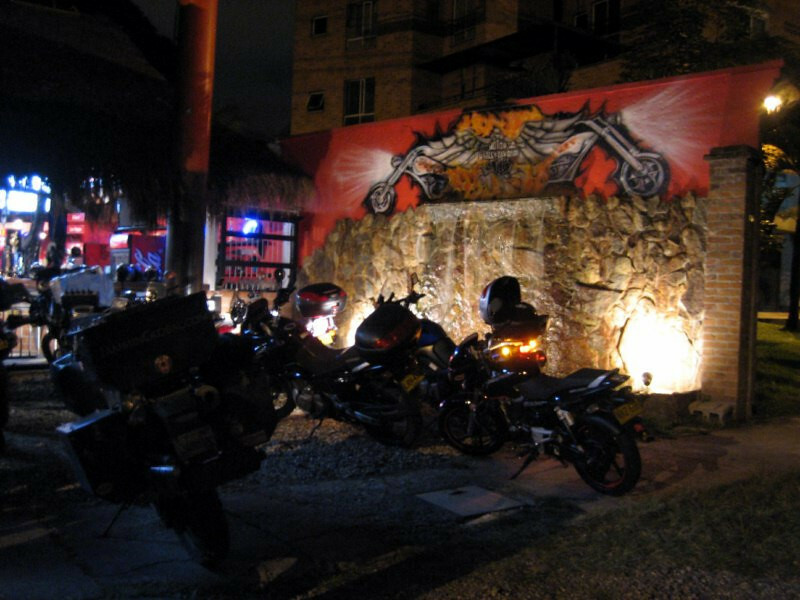 All the pictures on the wall are of his tour in Europe and other biker events around Colombia. After seeing all the electrical work on my bike, he showed me his crazy car stereo that he’s hooked up to his V-Strom with 6-inch loud speakers inside the front fairings and tweeters mounted on the windshield. It’s even setup with an infra-red remote control. He says it’s nice to have music when they gather for bike events. Crazy, but very cool. 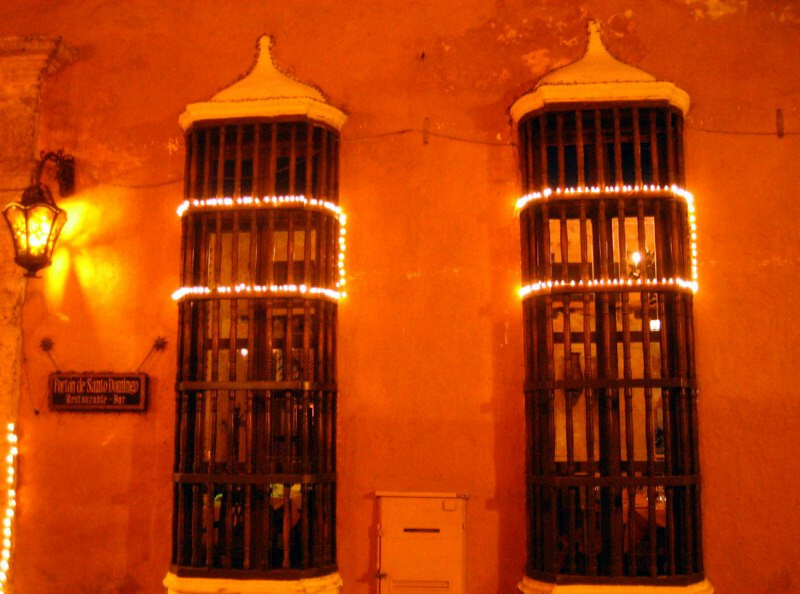 Fernando’s lovely house. 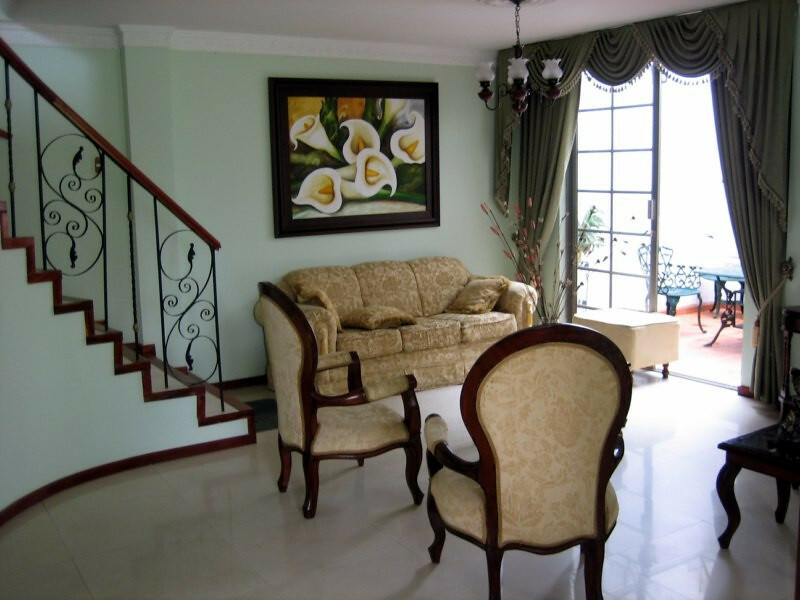 His wife painted that painting above the sofa. Leaving Fernando’s house the next morning. 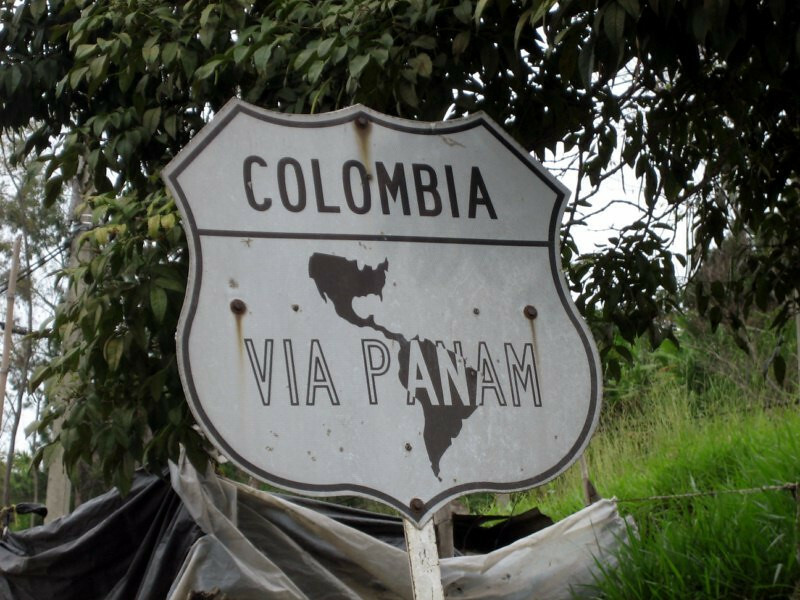 I’ve been mostly on the Pan American Highway through Colombia. 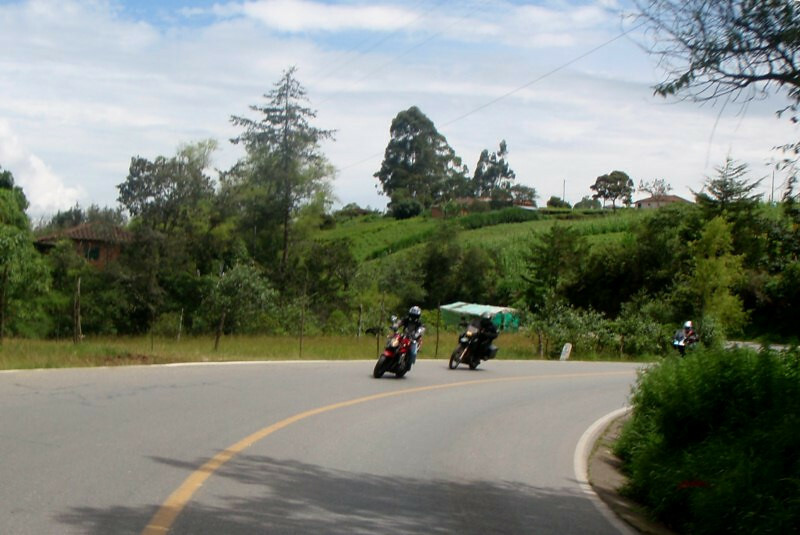 Twisty roads heading up to Pasto, about 265 kms (165 miles) south. 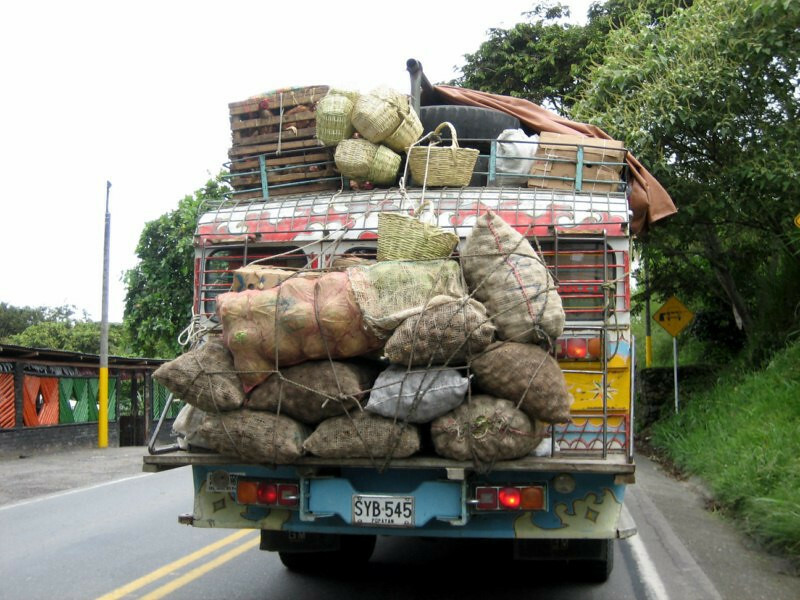 Local bus with loads of potatoes and chickens strapped on the roof. 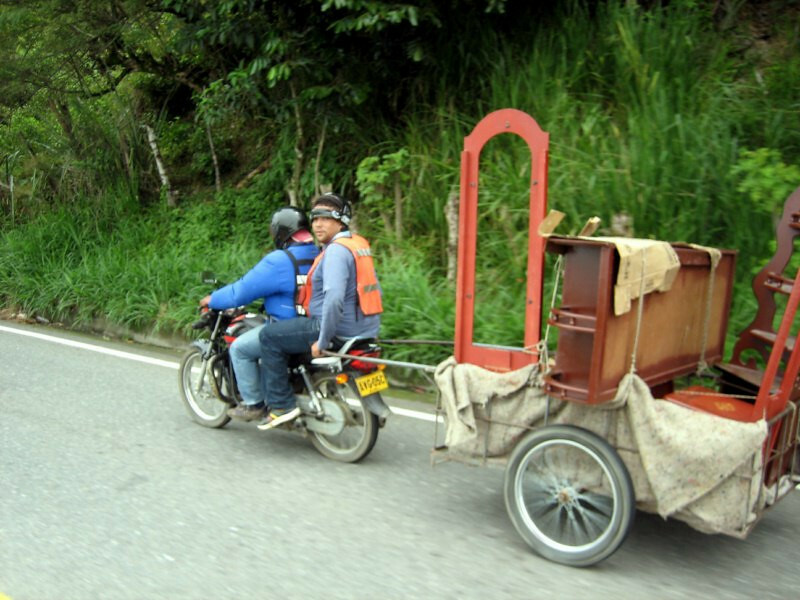 Ad hoc motorcycle trailer. The passenger is just holding onto the cart and check out his helmet-wearing style. 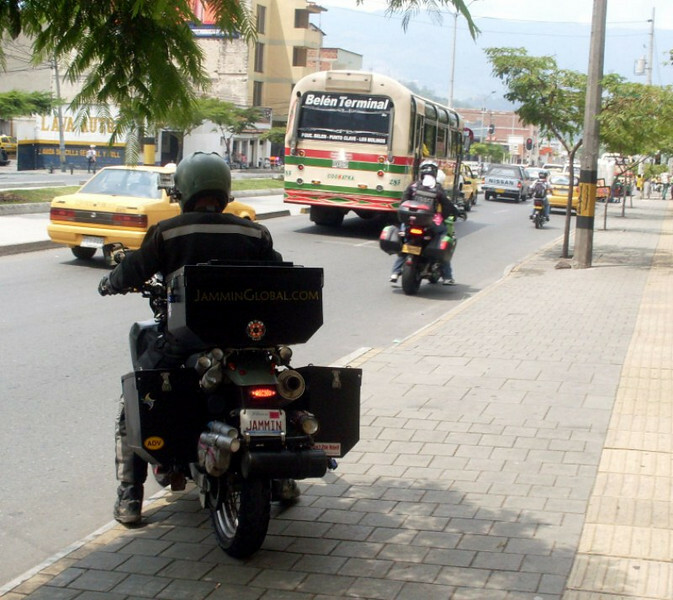 Helmets are required by law in Colombia, but how you wear it is another matter. 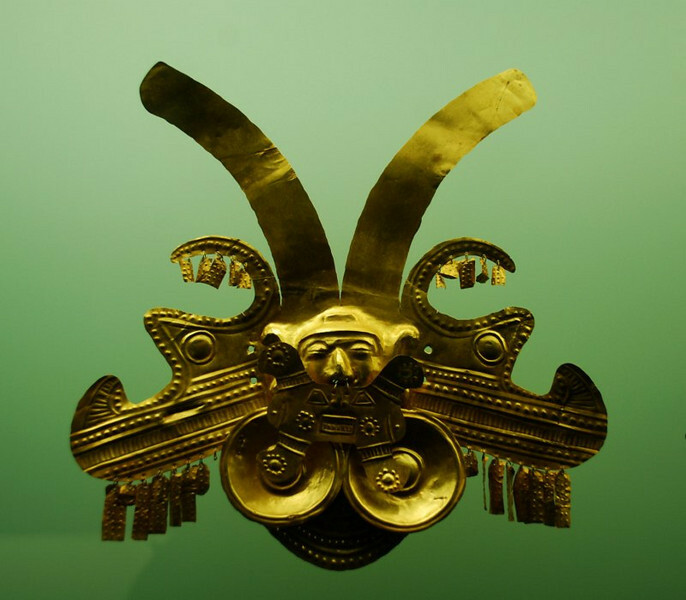 Looks like some people don’t like to wear helmets, so they just place them on their head, out of the way. 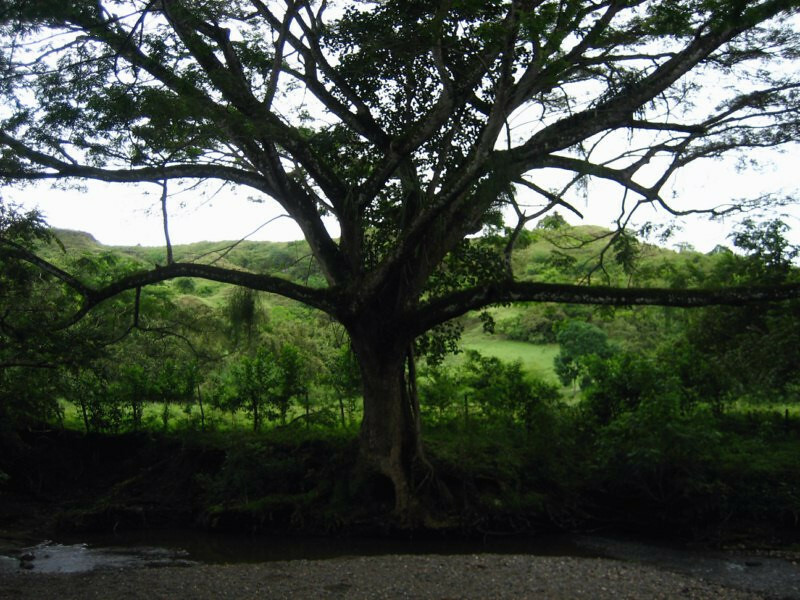 A multi-branched tree at a small break by the road side. The scenery becoming more impressive as I neared Pasto. Vivid skies with Pasto in the mountains ahead. 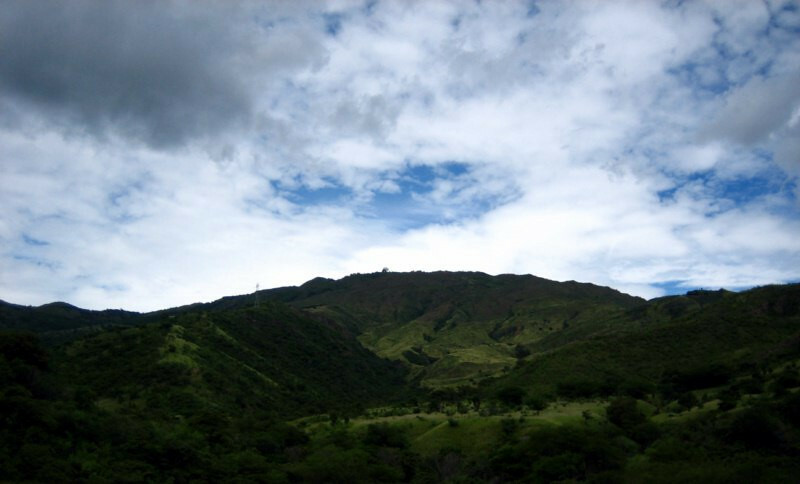 This image is level with the horizon, but note how the clouds follow the top of the ridge as it descends. 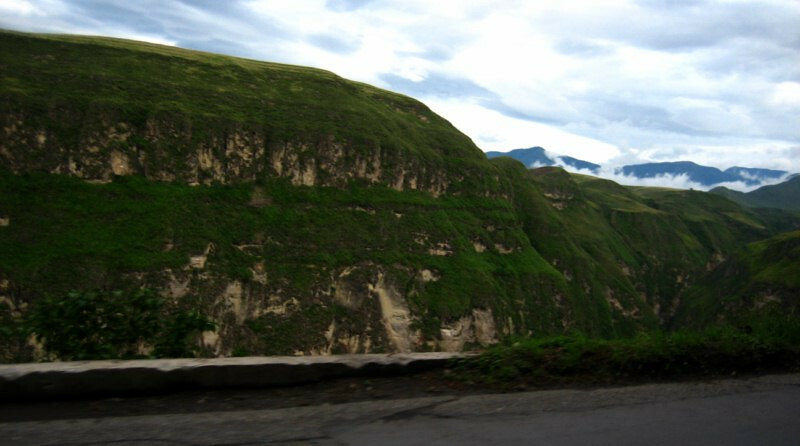 Pleasing scenery on the way to Pasto. 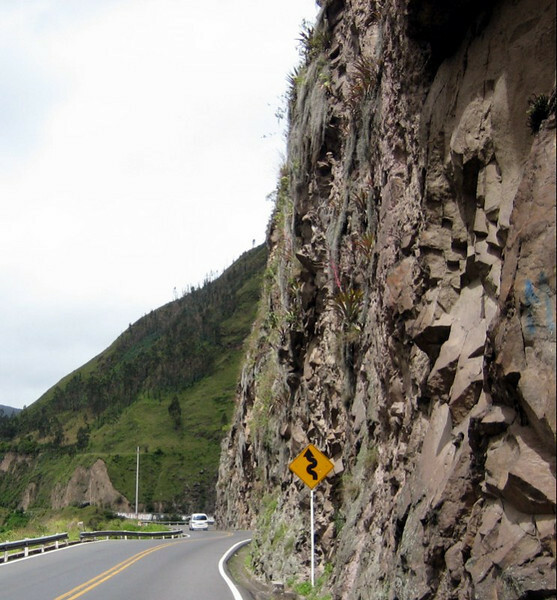 Deep, rugged canyons on the climb up to Pasto. 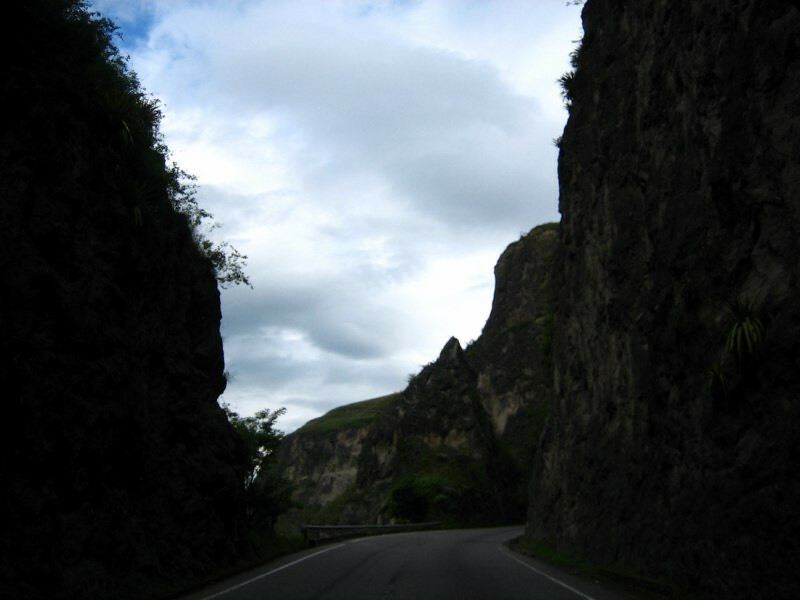 The road was very impressive, hugging steep cliffs and cutting through rock passes. 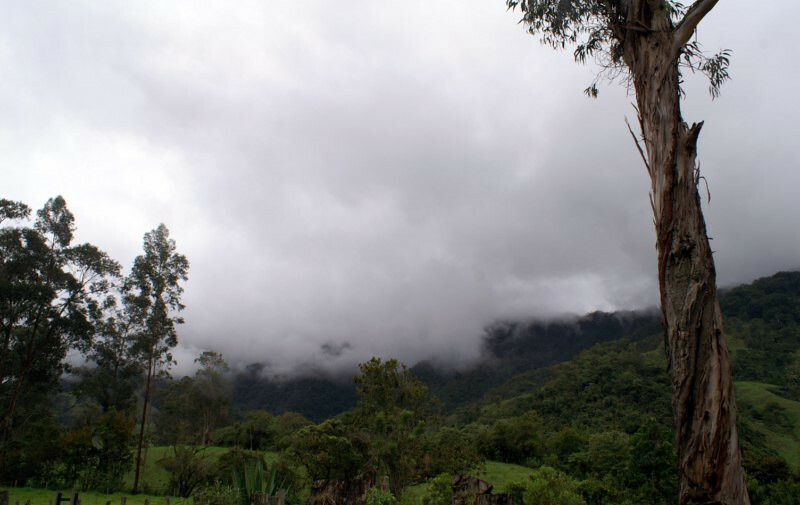 The weather changed into cold rain as the altitude neared 3,000 m (10,000 ft). 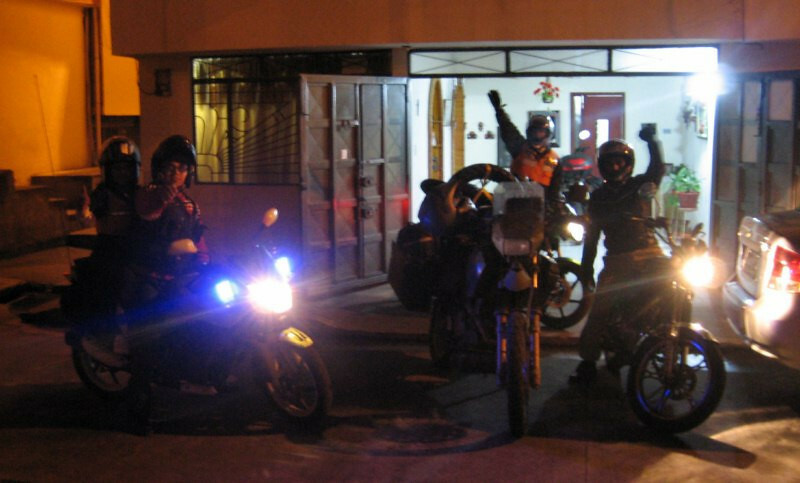 Being welcomed by the local motorcycle crew of Pasto. 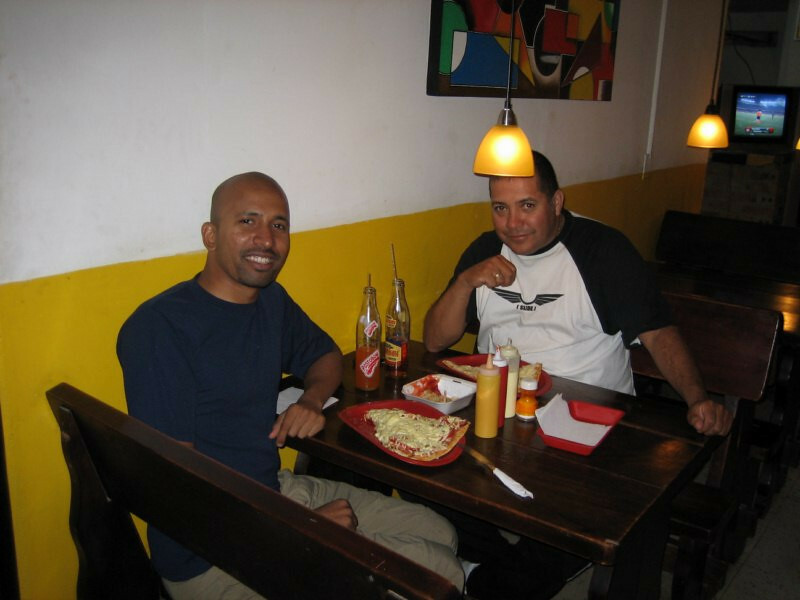 Dario Fernando, whom I stayed with in Medellin, is from Pasto so he informed all his friends that I was passing through. 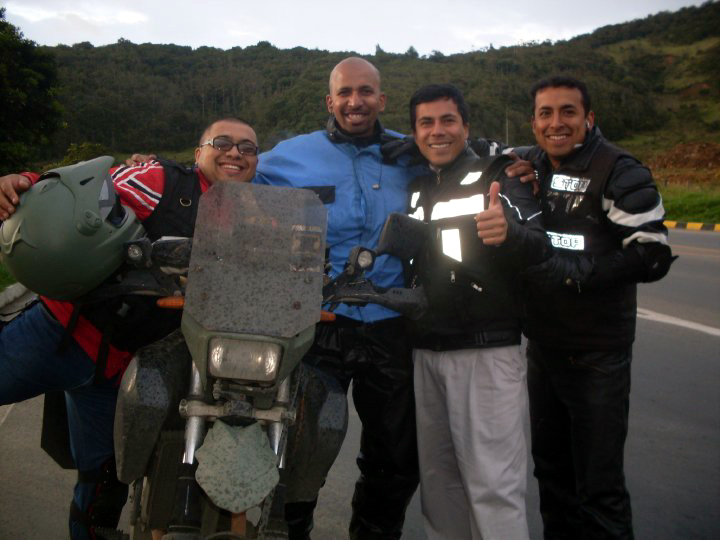 L-R: Andres, me, Raul and Edwin. The guys were very welcoming and wanted to show off their sights. Here, we’re taking a quick picture of the volcano that looms over the city. They’re all on small bikes, 200cc and less and were worried they would be too slow for me, but it was just right as I’m riding slow anyways (around 90 kmph, 56 mph). 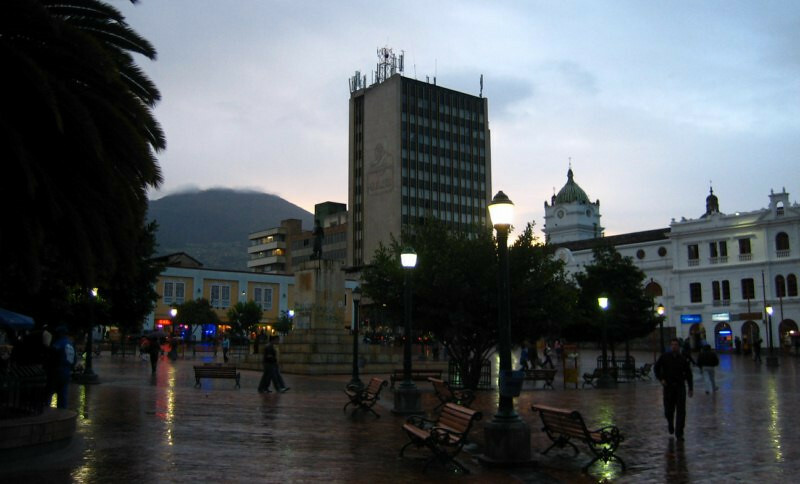 The main square in Pasto with the volcano looming in the back. It erupted earlier this year but didn’t cause any damage. 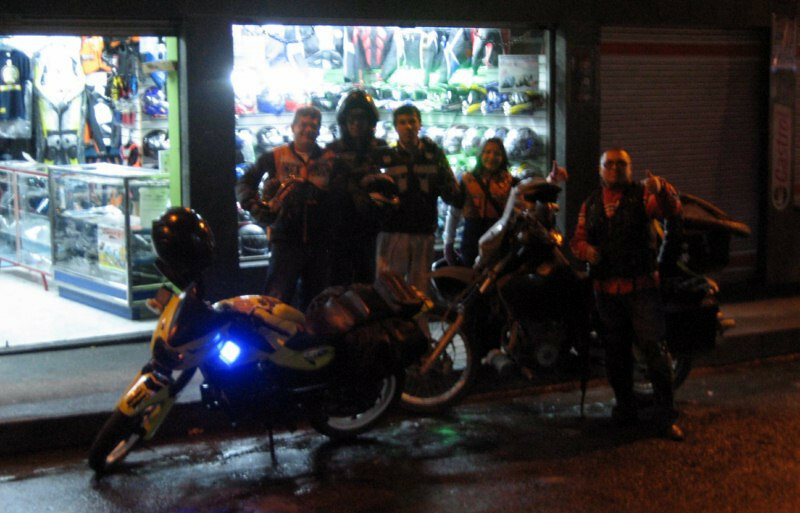 Andres, in the black vest, was riding the lead Baja Pulsar and since he works part time with the police in community-related events, he had flashing police lights along with the police horn on his bike. It made easy work of cutting through traffic. Here, he’s helping me buy some local chain lube for $2 as I know it’s going to be more expensive and harder to find further south. 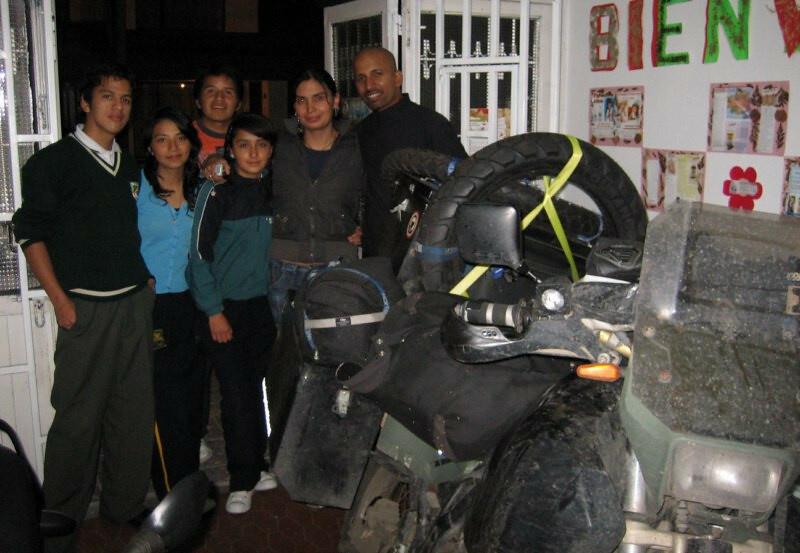 L-R: Ivan on a green Pulsar, Edwin on a dirt bike, Raul on a Suzuki GN125, Angela (Andres’ girlfriend who spoke some English) and Andres. Stopping by a church that overlooked this park. 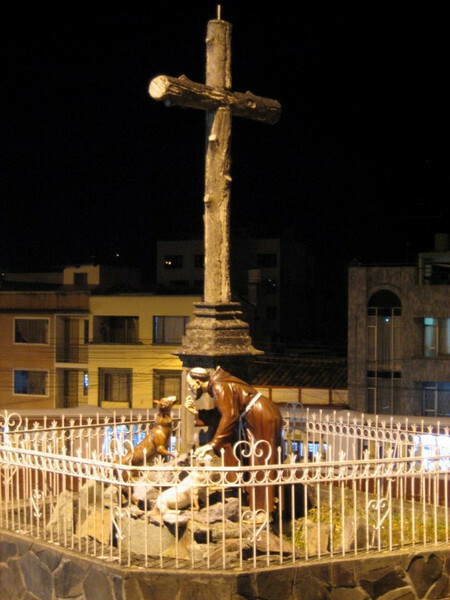 Where there was a sculpture of St. Francis of Assis, the patron saint of animals and the environment. 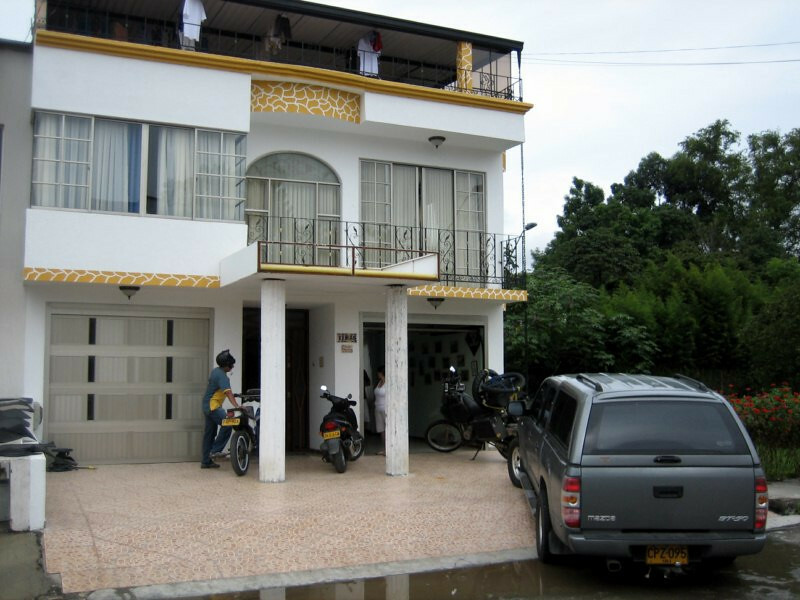 Dario’s family’s home. 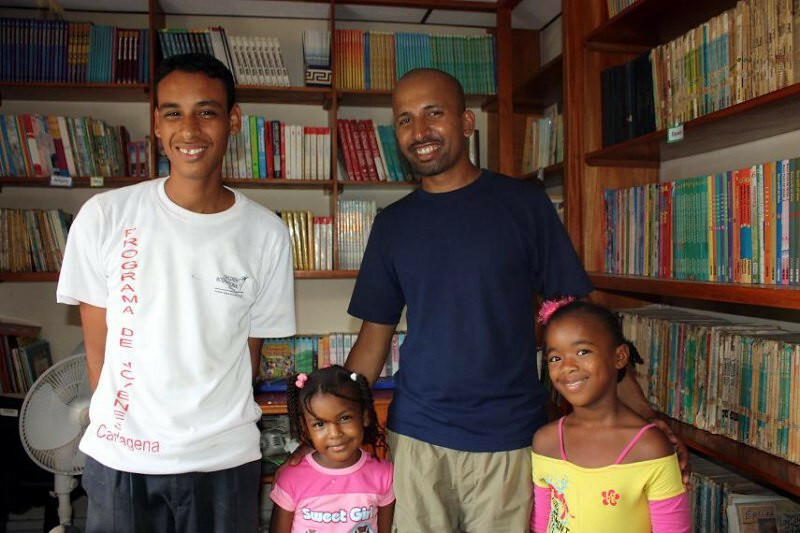 Dario’s two younger brothers, Andres and Alvaro with Luz Dary, Dario’s girl friend and her two younger sisters. At night, it was cold here at 2,530 m (8,290 ft) and I got a bit of a headache with all the change in altitude. 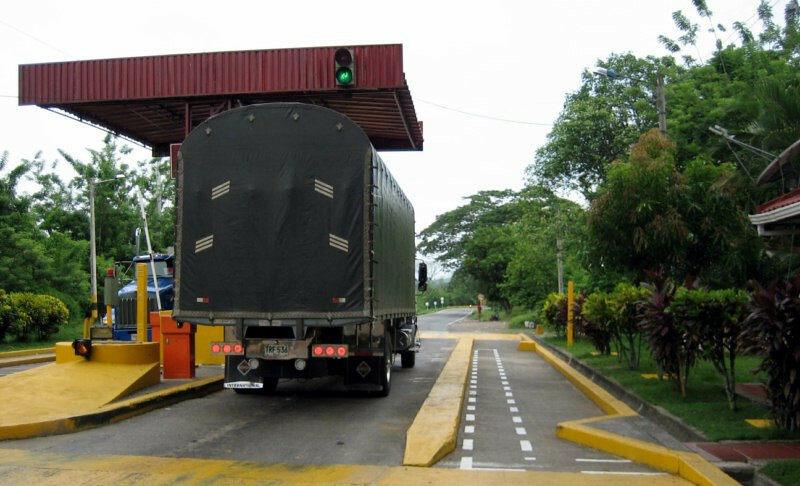 The next morning, on the last day of my Colombia visa, Andres offered to accompany me to the Ecuadorean border. 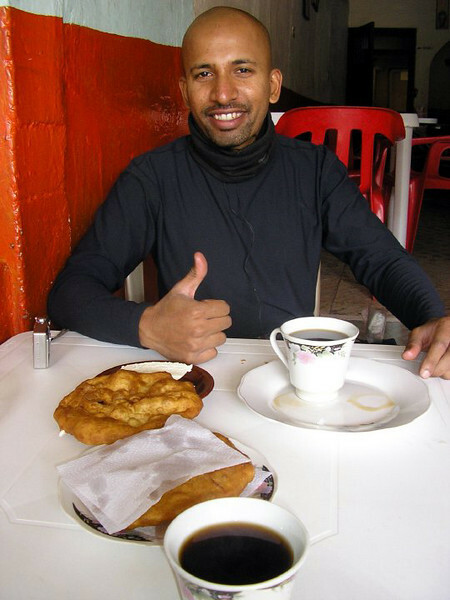 Having some breakfast along the way of a fluffy, fried bread with cheese and coffee. 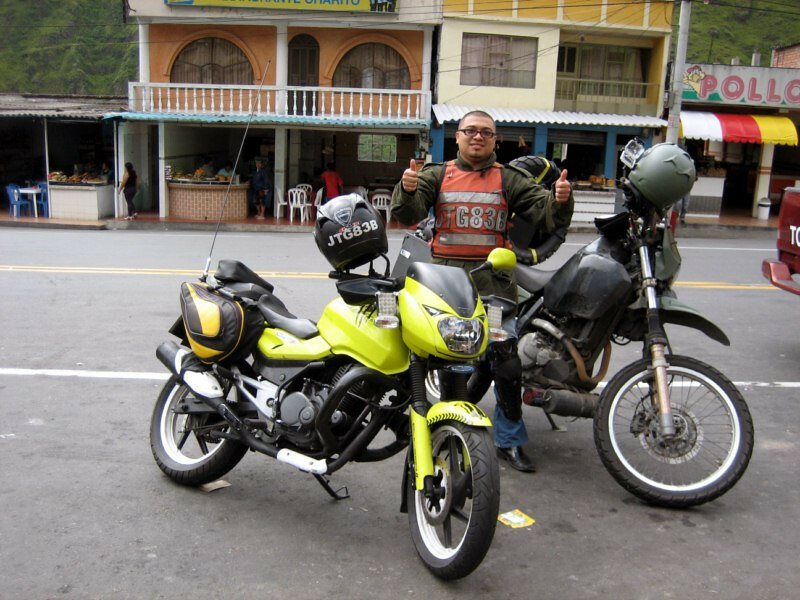 Andres and his good looking Bajaj Pulsar. 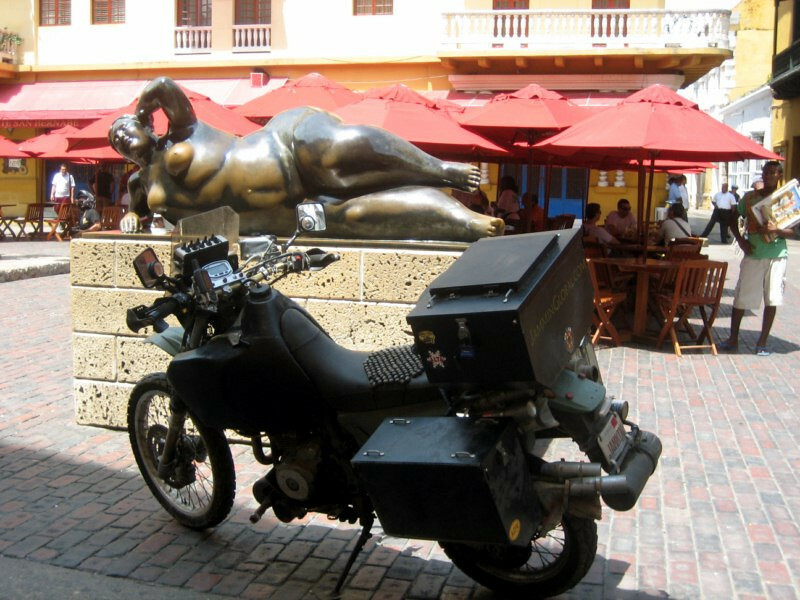 The Pulsar became well respected after a rider rode one from here through South America, Africa and into India to the main Bajaj factory. Quite a feat on a 200cc bike. 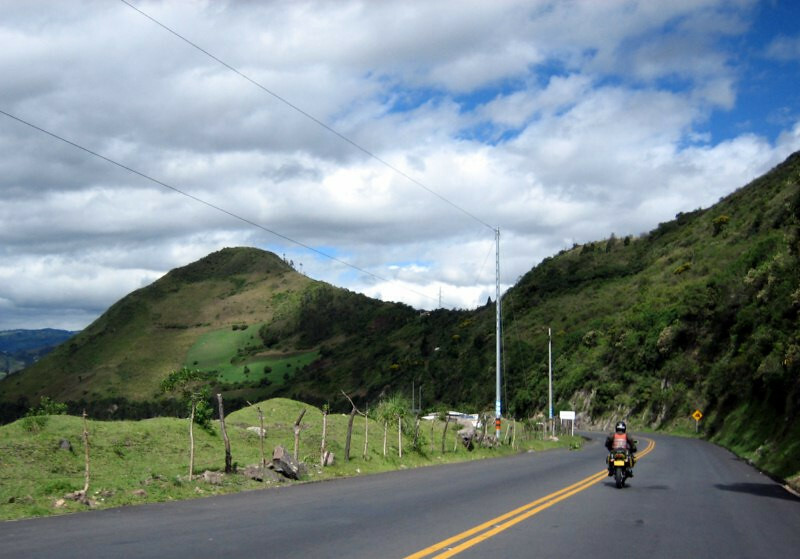 The road from Pasto to Ipiales at the border was fantastic and had great views. 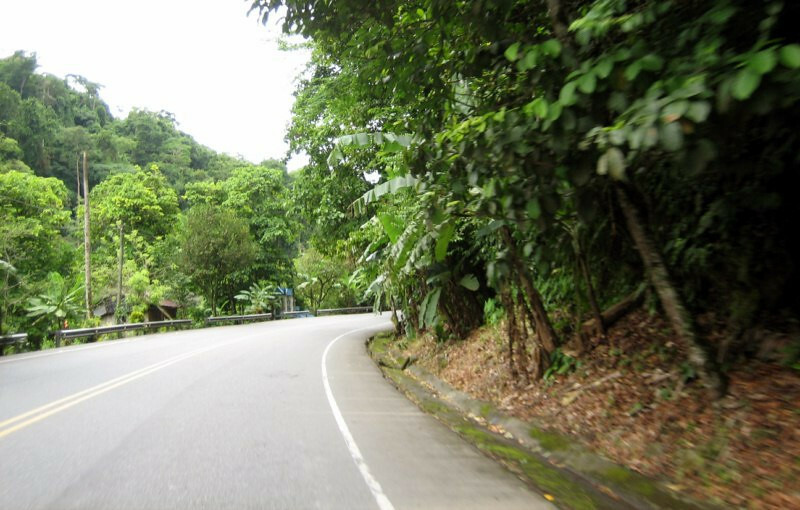 It was more of the steep, cliff-hugging variety of twisties. 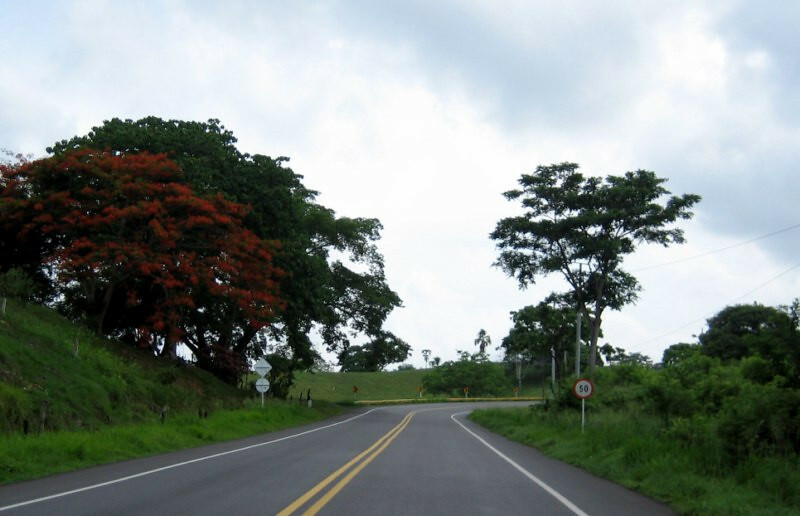 Enjoying the ride to Ipiales. 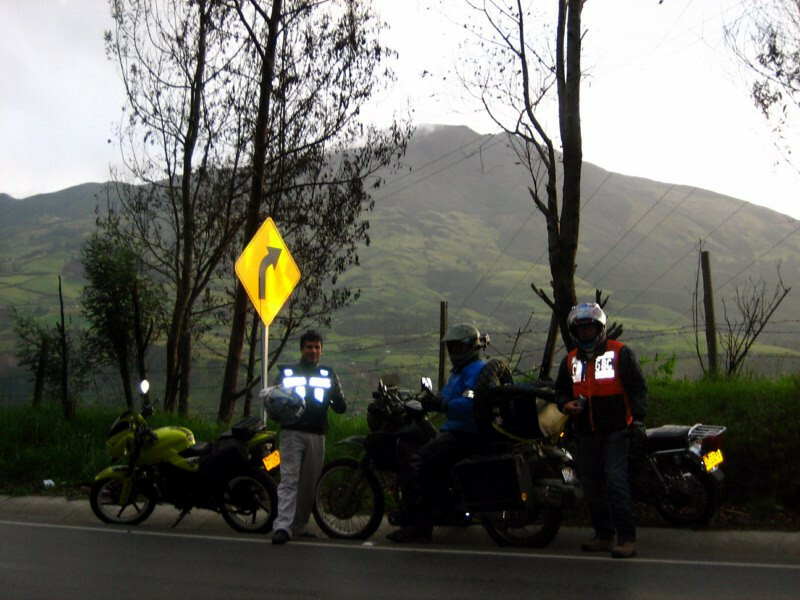 From Pasto the road descends to about 1,700 m (5,660 ft) before climbing back up to 2,950 m (9,820 ft) at Ipiales. 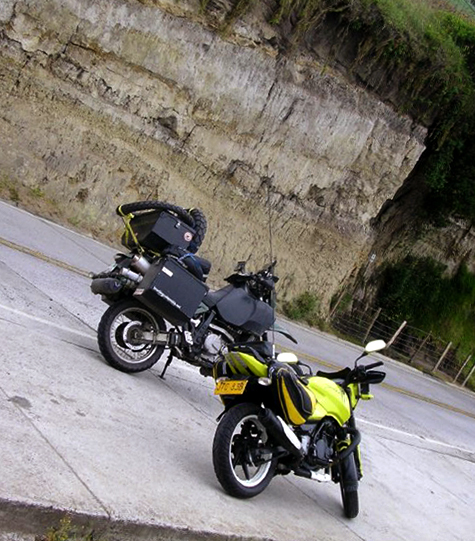 The two bikes on the way to Las Lajas. 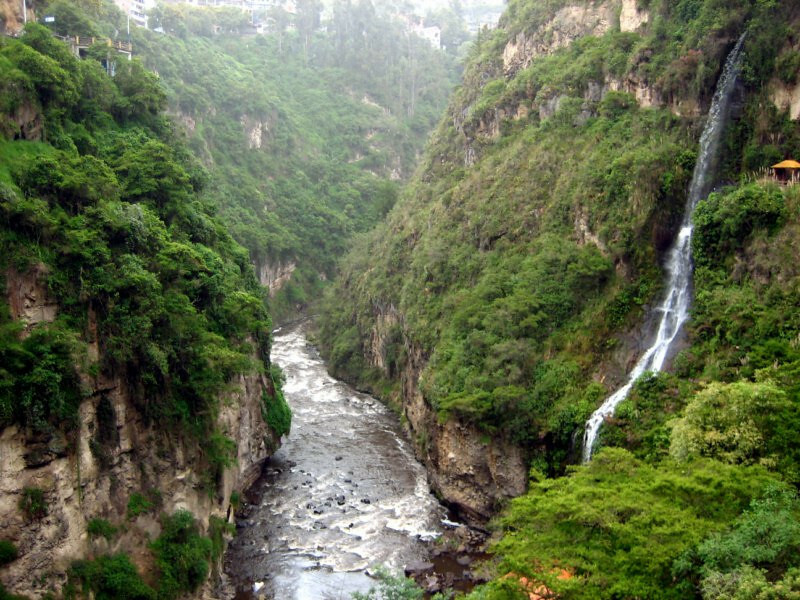 The impressive Las Lajas Sanctuary set in a canyon of the Guaitara River, about 10 kms (6 miles) from Ipiales. 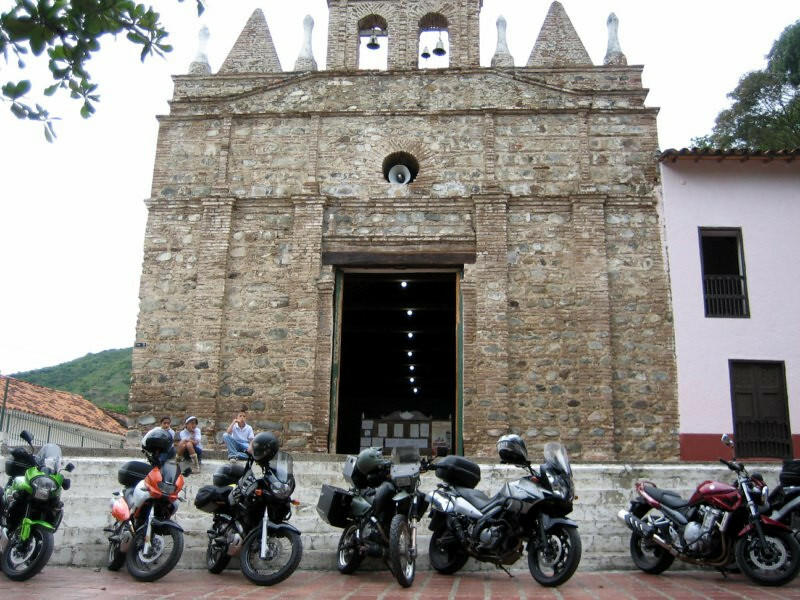 The current church was built from 1916 to 1946 on the exact site that a vision of the Virgin Mary was seen and since then many miracles are purported to have happened to devotees who come and worship at the church. 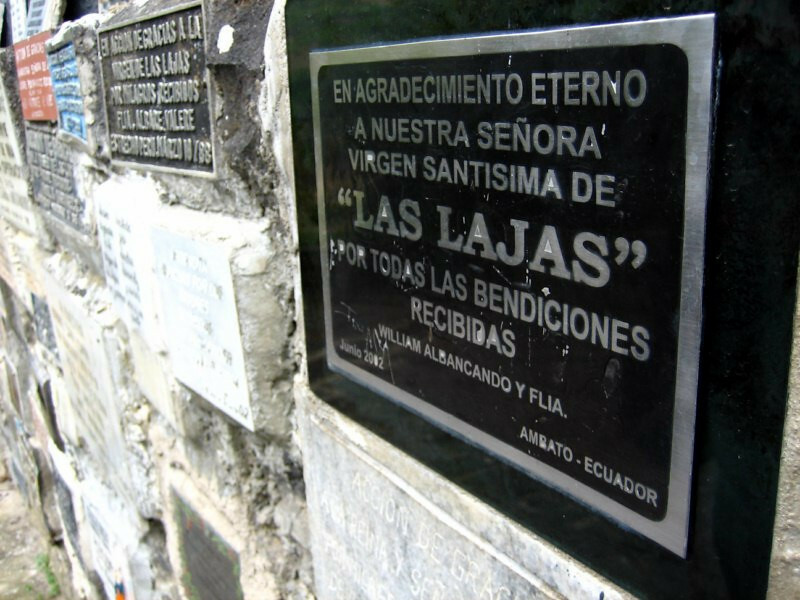 These plaques stuck into the wall leading to the church are thank yous and testimonies of the successful miracles. The faithful traveling from far and near to have their prayers answered. 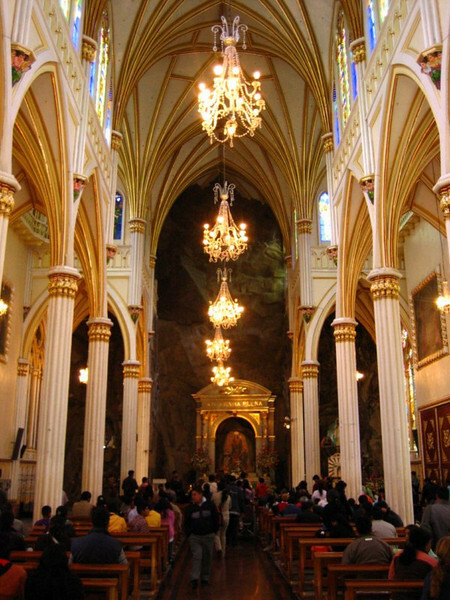 Inside the beautiful chapel, which is built right up against the rock face with the shrine where the image of the Virgin Mary was seen in 1754. 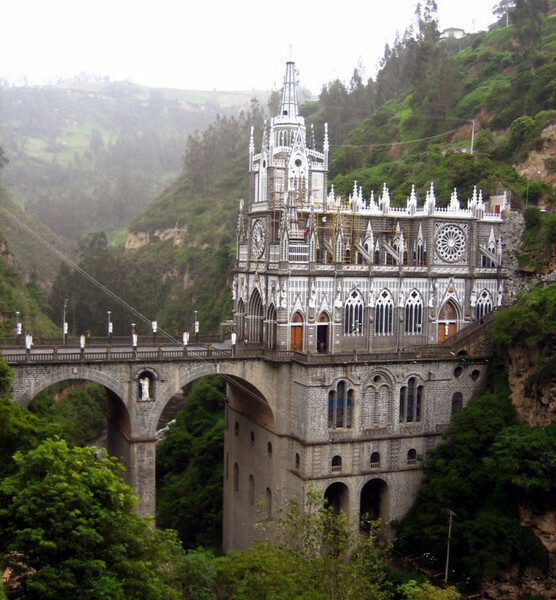 The engineering feat of building a church in a steep canyon is quite impressive. 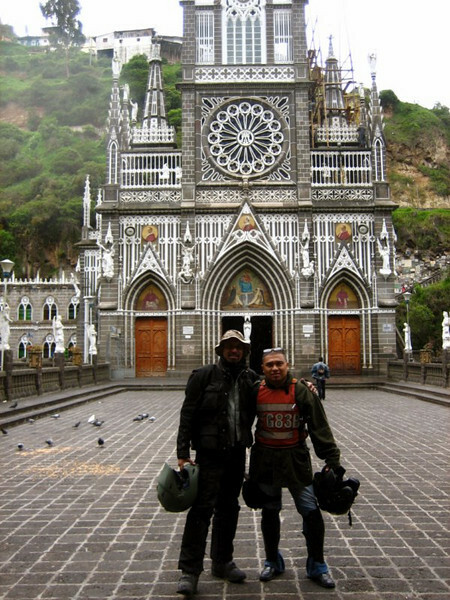 With my guide for the day, Andres at Las Lajas Sanctuary. 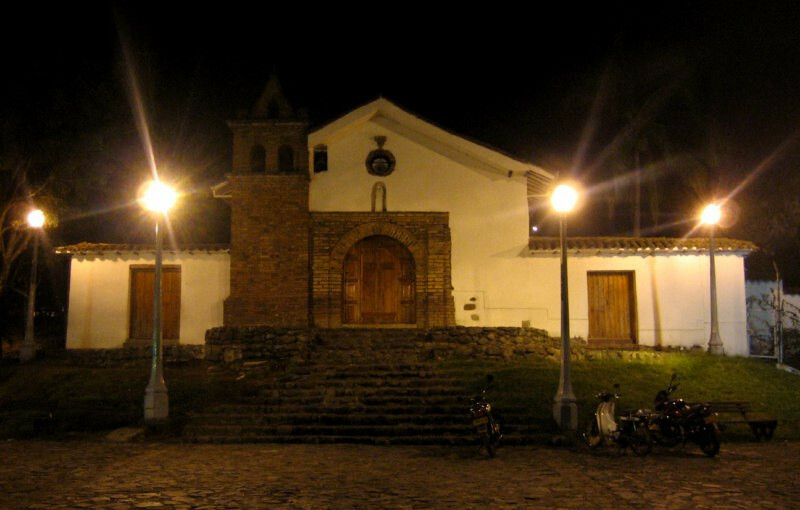 Besides the church, the surrounding scenery is worth the visit. 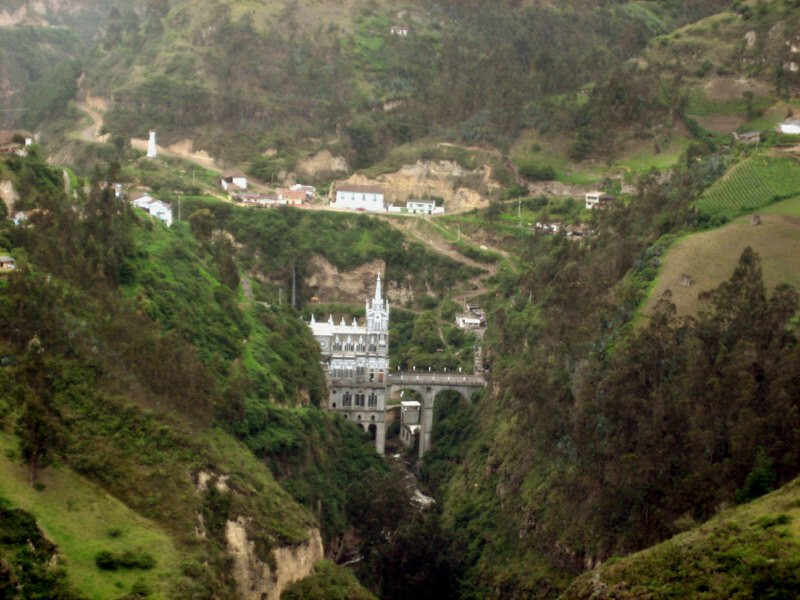 Las Lajas Sanctuary with its foundations heading down to the canyon floor. 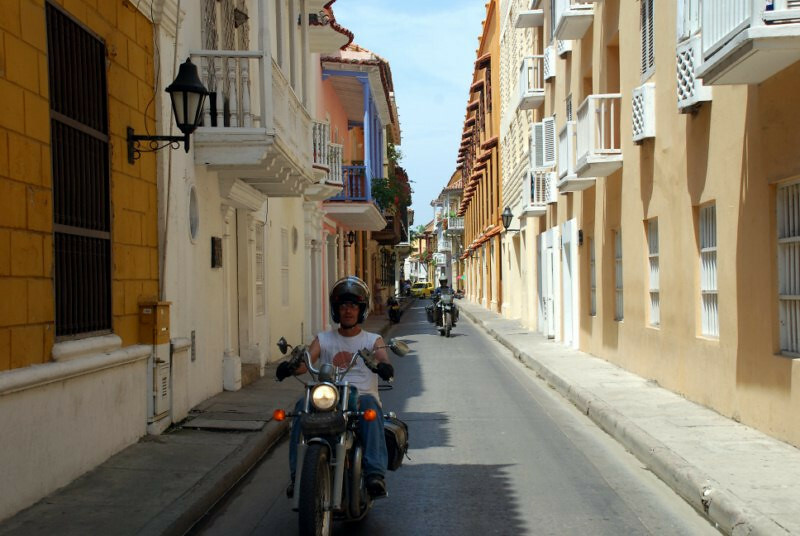 Three weeks was too short for Columbia, but I enjoyed my time there thoroughly, especially meeting up with all the local bikers. 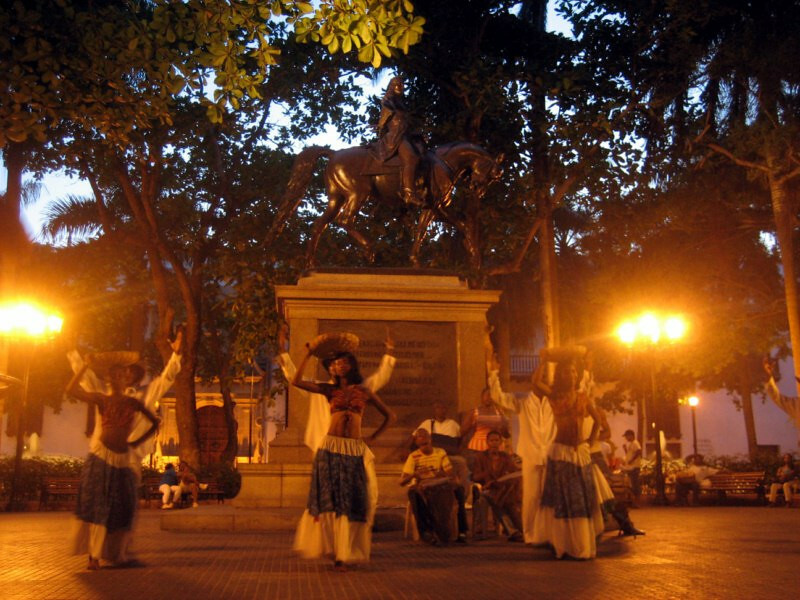 The people are very warm and welcoming and are proud to show off their country. I will return someday to spend more time exploring this wonderful country. 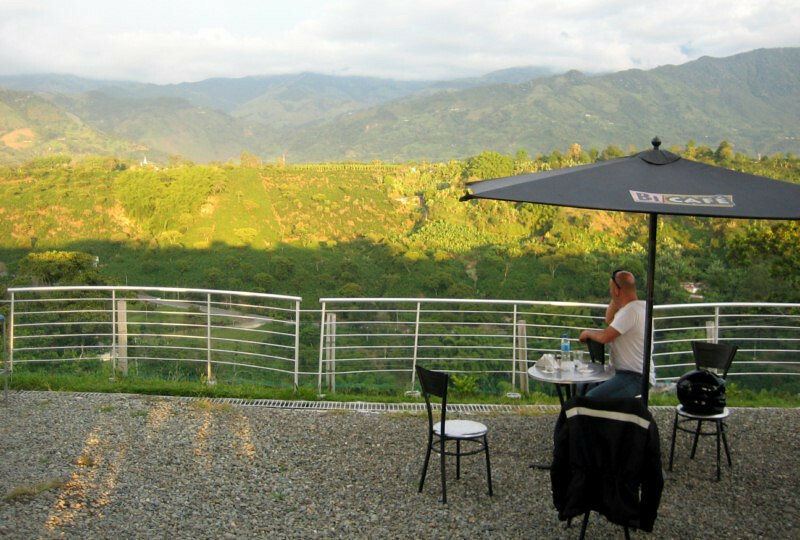 After a nice weekend in Medellin, I headed to the coffee producing region, called the Zona Cafetera. 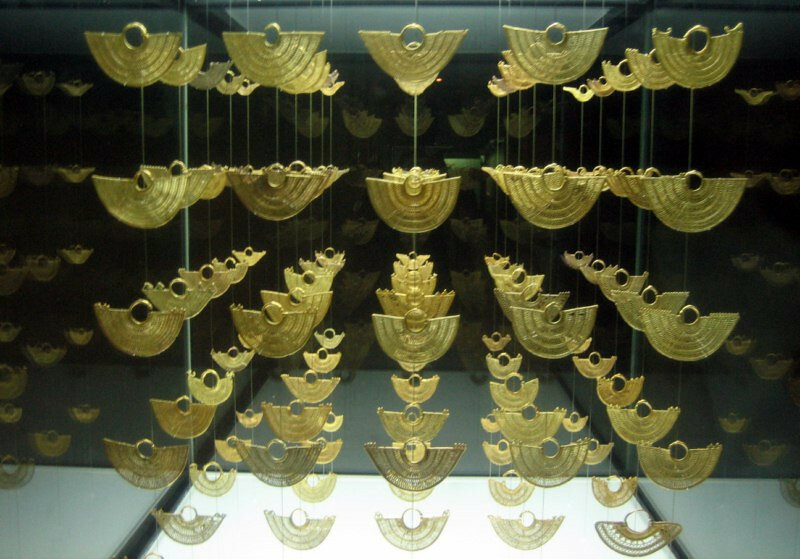 Colombia is world famous for its coffee and its citizens are very proud of their product. I’m not really a coffee drinker but it sure did taste good. 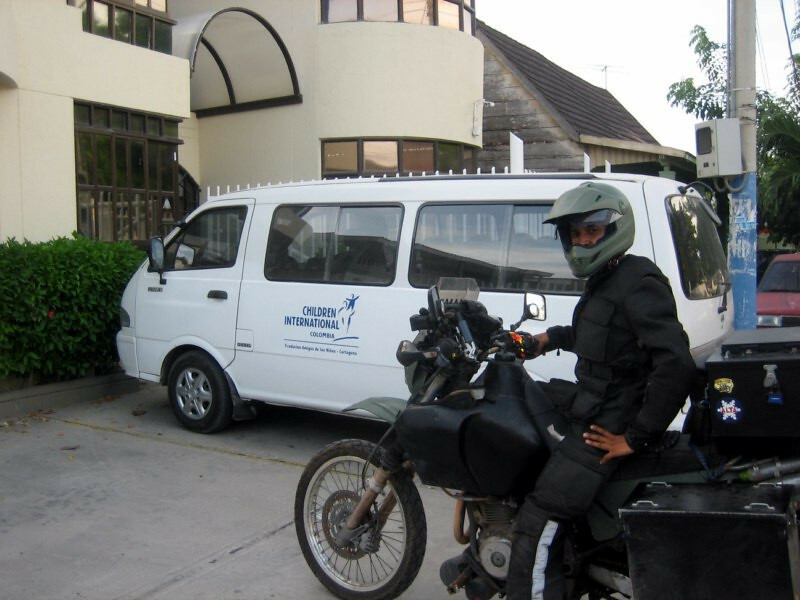 My contact was Jorge Peto, whom Sargento stayed with but due to lack of space, I stayed with one of his friends, Barba and he took me around for a few days. 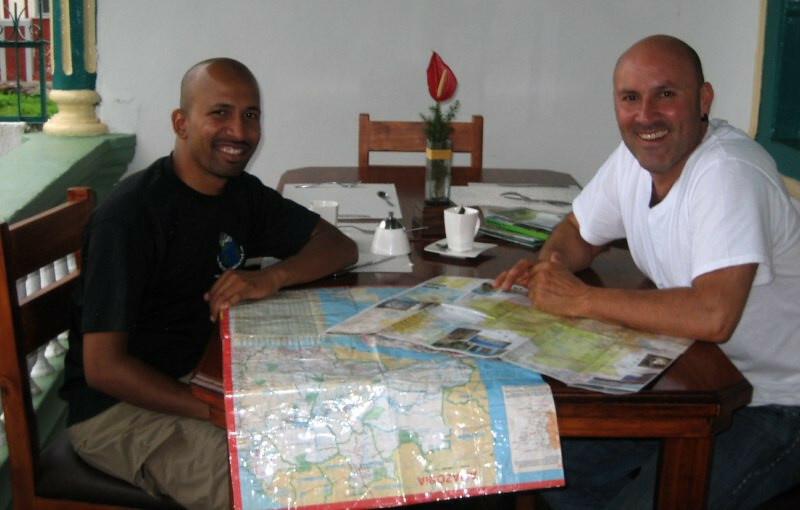 I then met Andreas, El Paton, a global motorcycle traveler who’s planning to do the Transamazônica in Brazil this August, same time as me, so we’ve decided to ride together there. 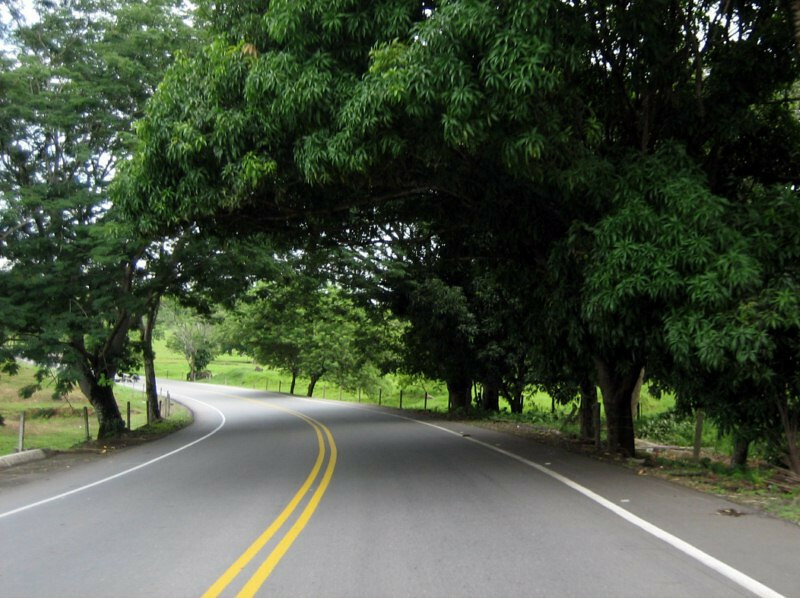 Nice roads heading from Medellin to Armenia, about 260 kms (160 miles) away. Yellow bridges and blue skies. Well manicured roadside flora. 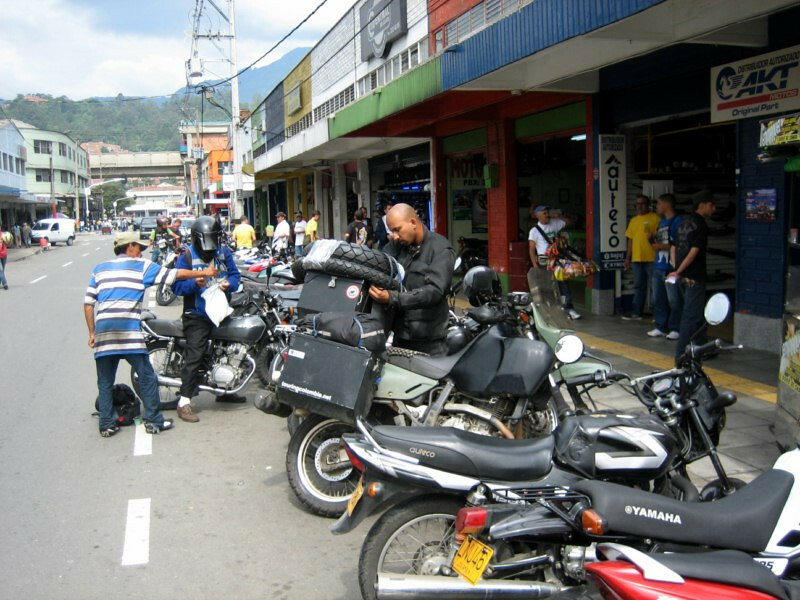 I was stopped by police at a check point and they demand to see motorcycle insurance in Colombia. 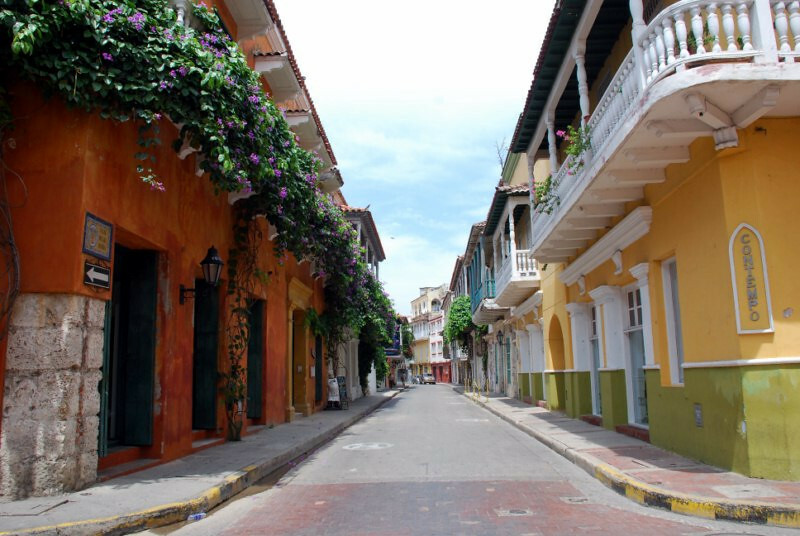 I was stopped earlier outside Cartagena without having insurance and it was a big racket, but they finally let me go saying I had to buy insurance in the next city, which I did for $15 and no problems after that. 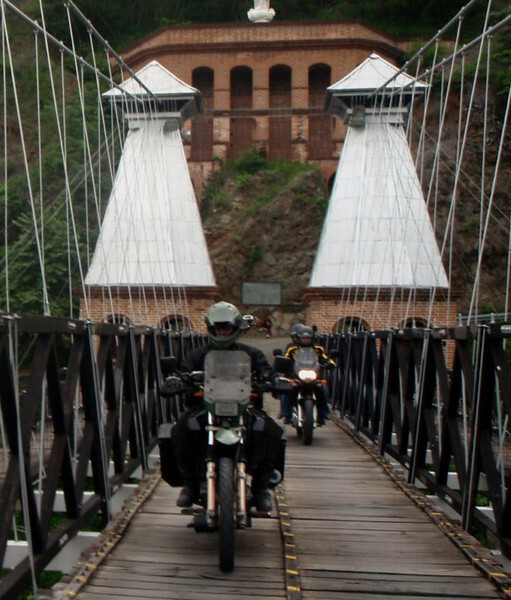 Crossing a big single tower suspension bridge near Pereira. My host in Armenia, Barba taking me around to visit a plantation. 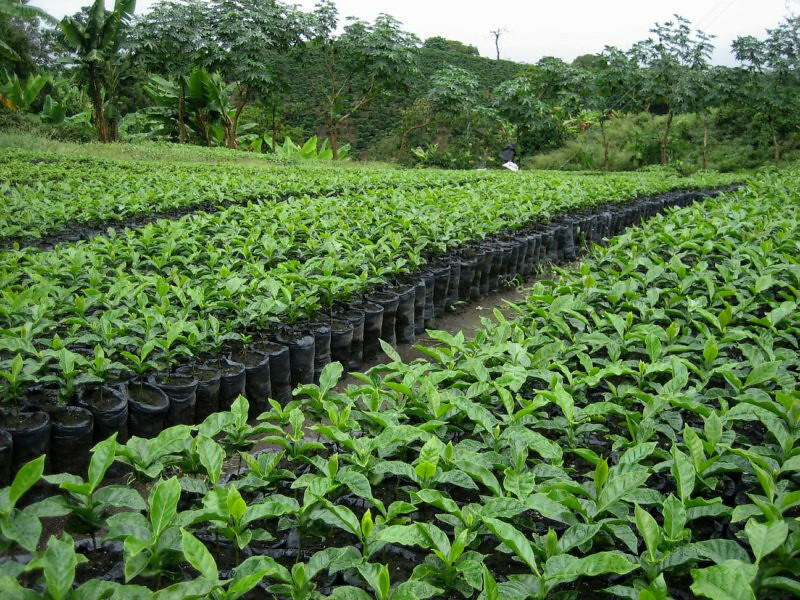 On the way, we stopped at a friend’s coffee plant nursery. Plantains freshly cut from the groves. 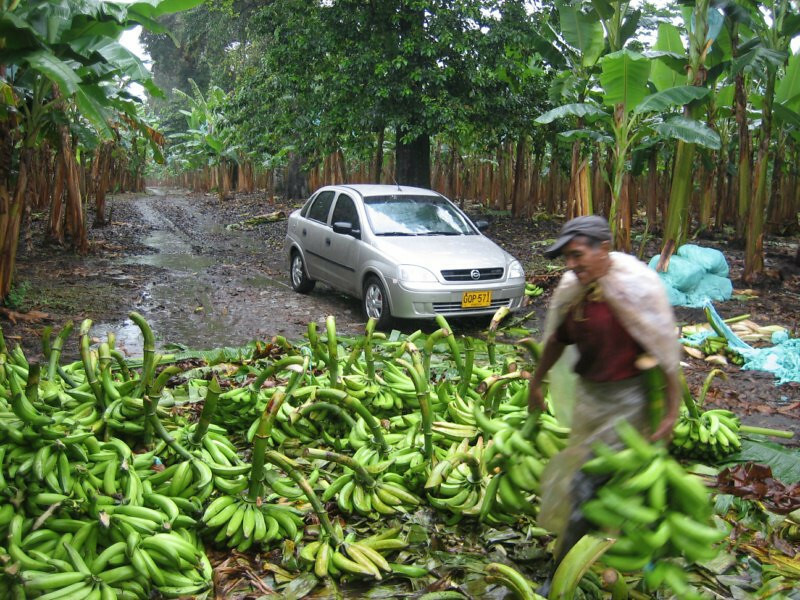 It was raining heavily and we had to wait until all the plantains were cleared from the road. 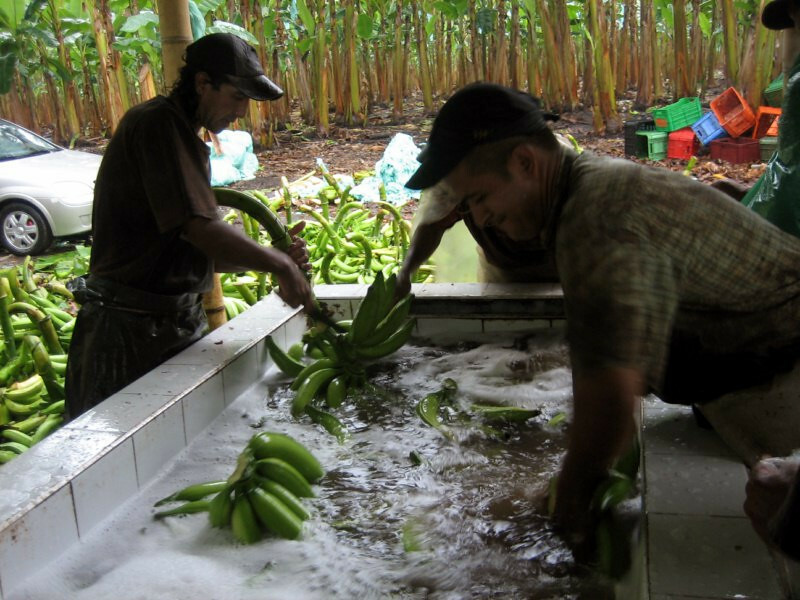 Cutting the plantains from their stem, washing and preparing them for the market. 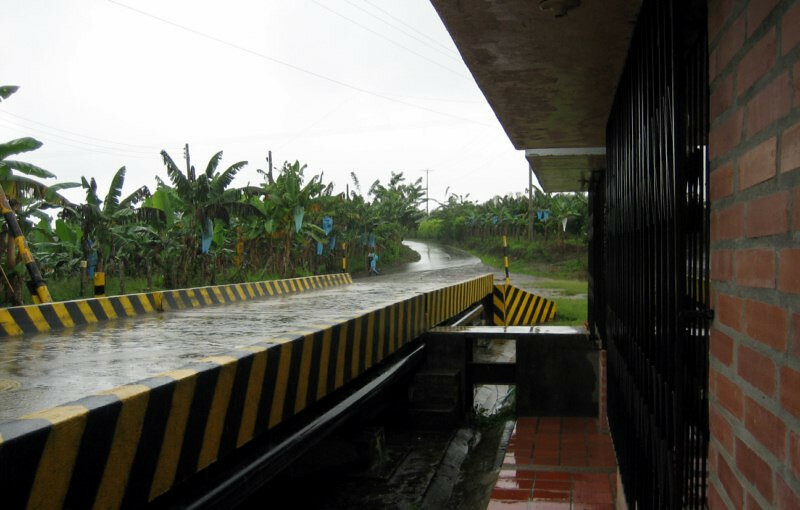 Weigh bridge at the entrance to the plantation to measure how much produce is being taken out. 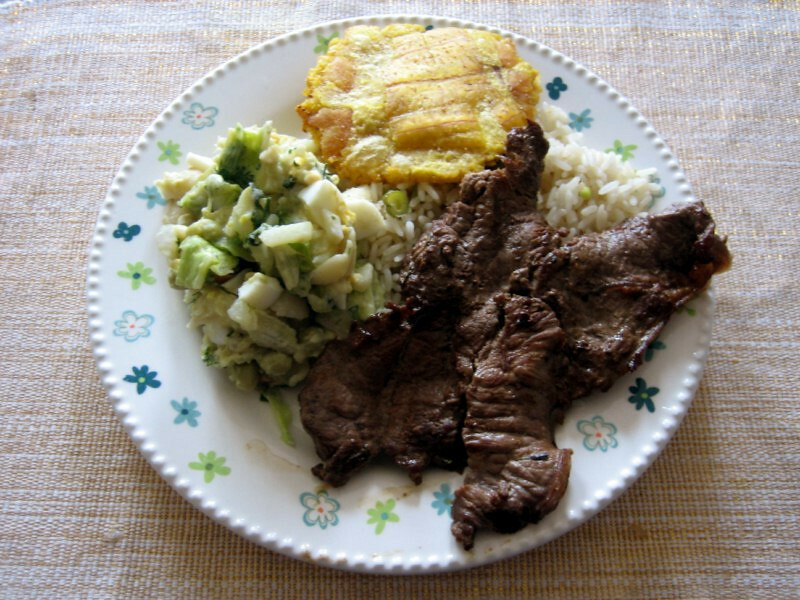 Lunch at Barba’s house of rice with steak, potato salad and patacones (twice-fried plantain, so tasty). That afternoon we played a bit of pool at one of the numerous ‘billiares’ pool houses around. The break. 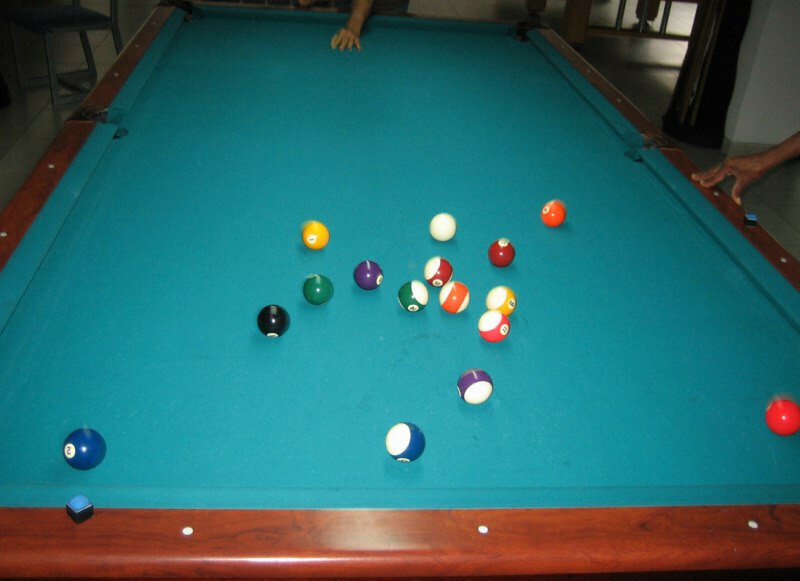 The aim of the game we played was to put in the balls chronologically, with a small bet placed on who would sink the black 8 ball, which I accomplished thrice. You can see the smaller numbers are placed on the outside with the larger numbers in the middle. 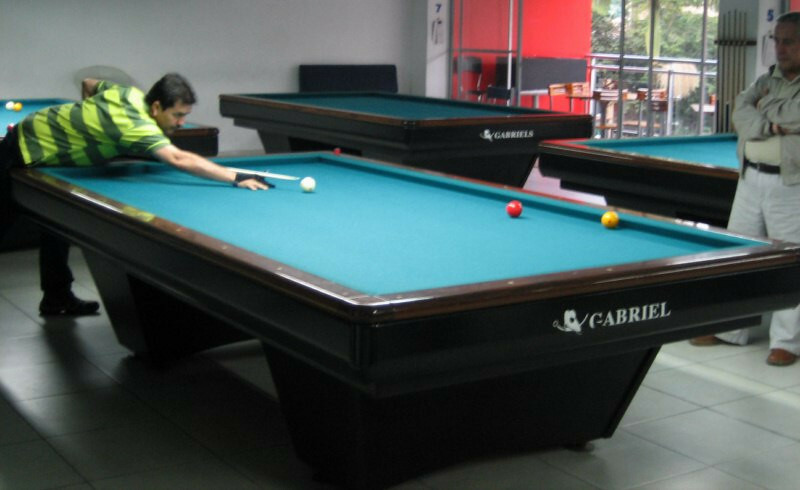 The more popular game at this pool house was played on a table with no holes and only 3 balls. 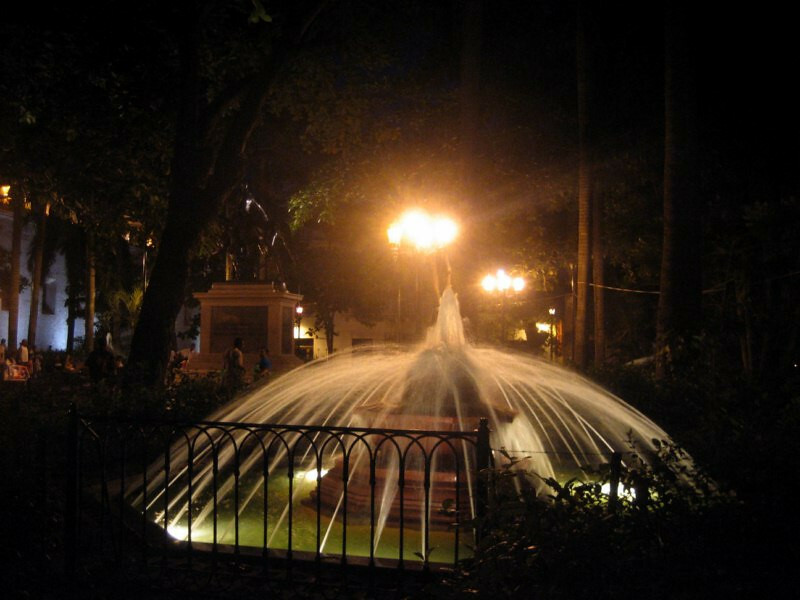 Downtown Armenia. 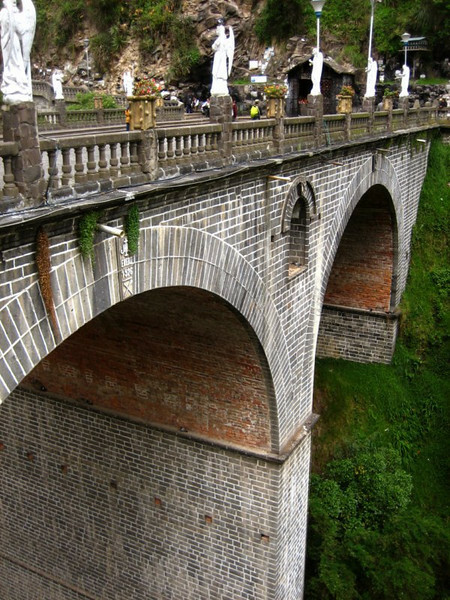 It’s a modern city as the original town was destroyed by earthquakes. Elevation is about 1,500 m (5,000 ft) and it was pleasantly cool. 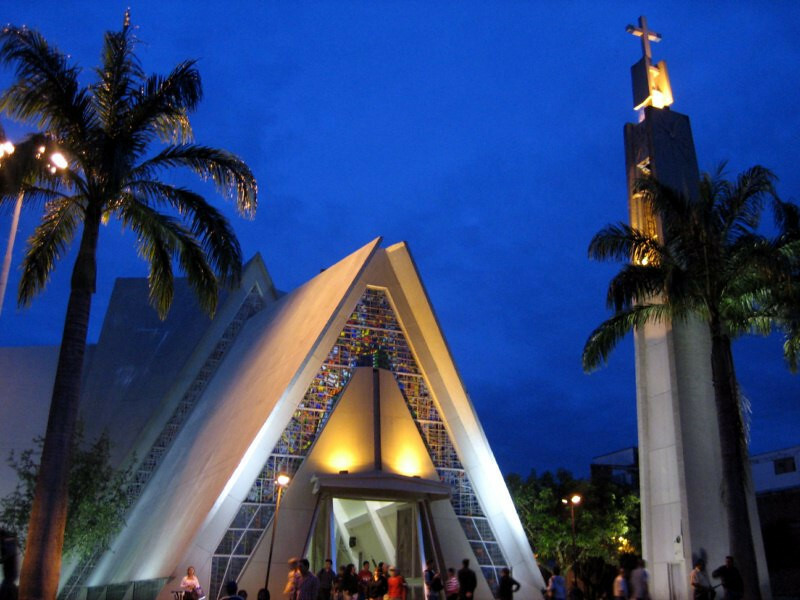 A modern-looking church in the central plaza at dusk. An interesting thing about Colombia is these cell phones for hire by the minute. 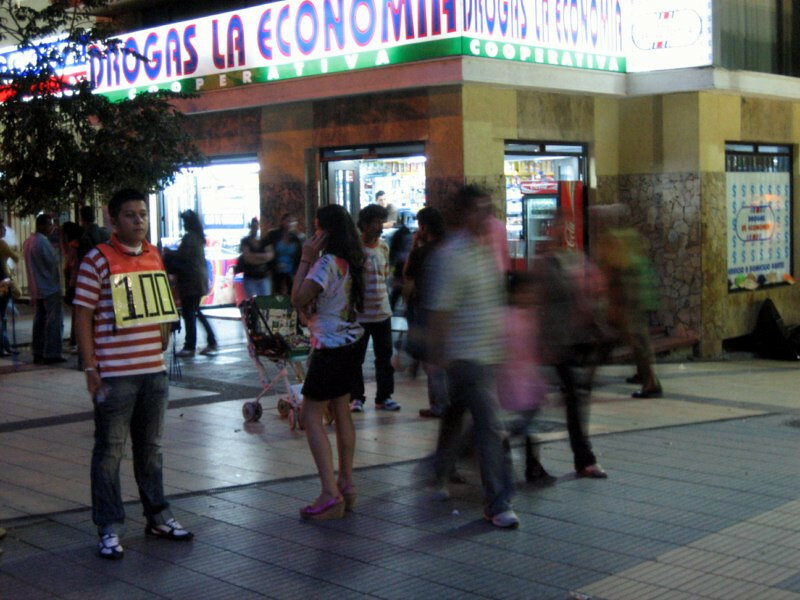 People wearing numbers indicate how many pesos a minute (100 pesos = $0.05) it costs to borrow their cell phone to make a call. Very handy and more available than phone booths. 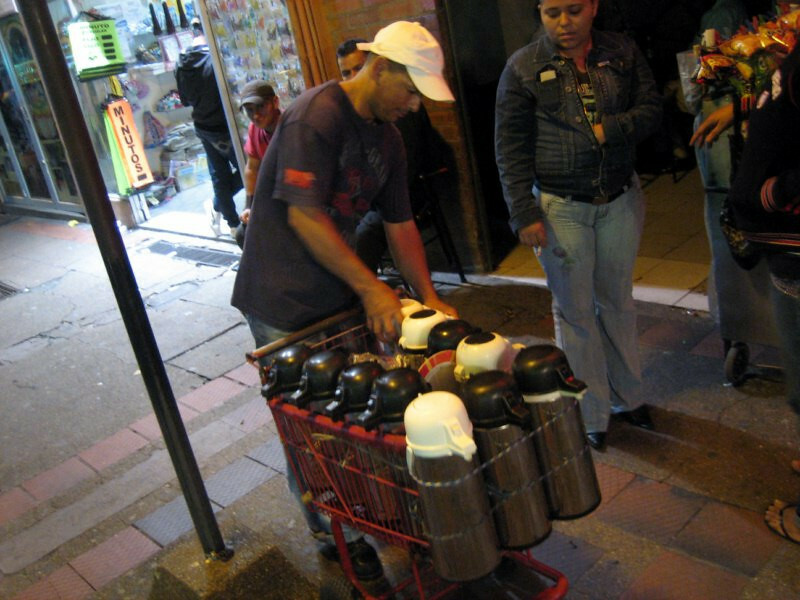 Another cool thing about Colombia is these guys walking around with thermoses filled with hot coffee. 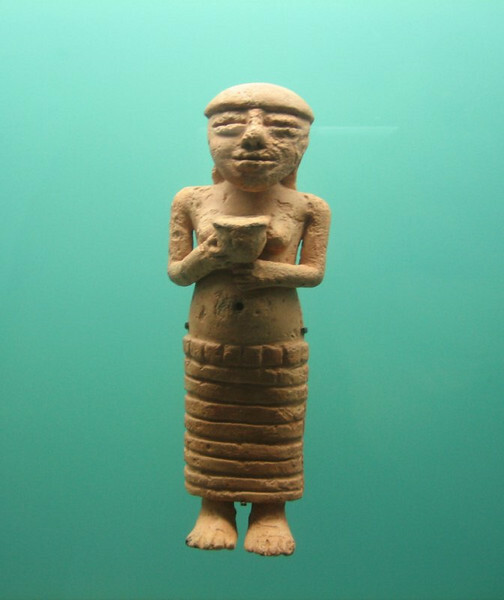 It was usually served in a small espresso-sized cup. 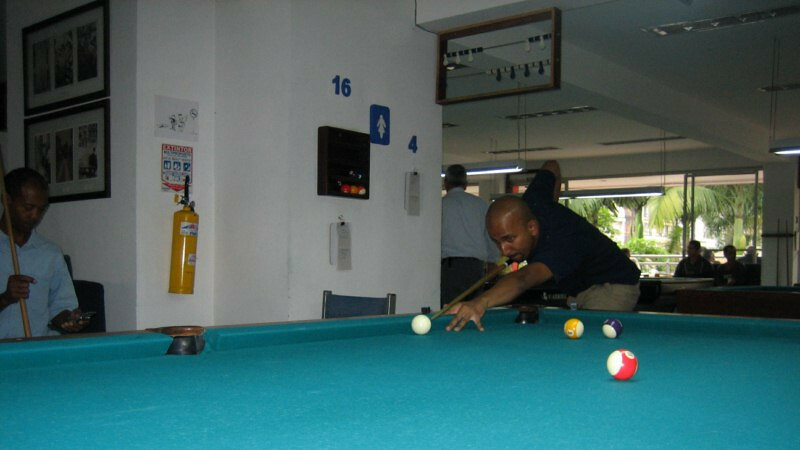 That evening, Barba’s friend here, Cordoba, who’s a retired policeman, invited us to dinner after playing pool. 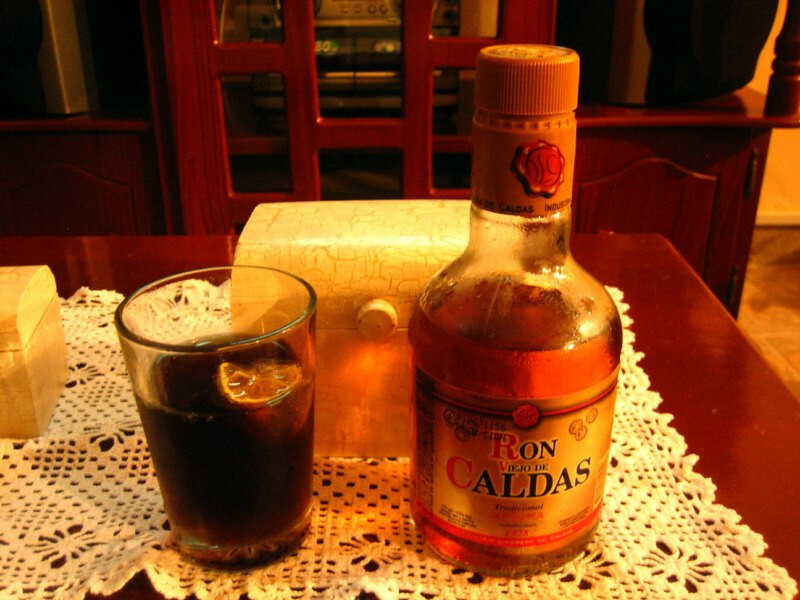 Having some fine Ron Viejo de Caldas Colombian rum, aged 3 years. Was very smooth. 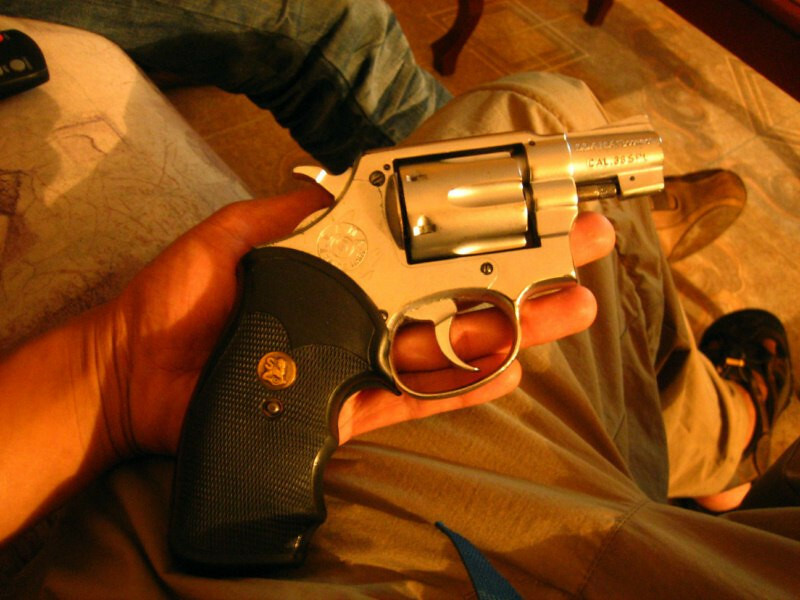 Cordoba let me inspect his revolver, a Llama Scorpio. 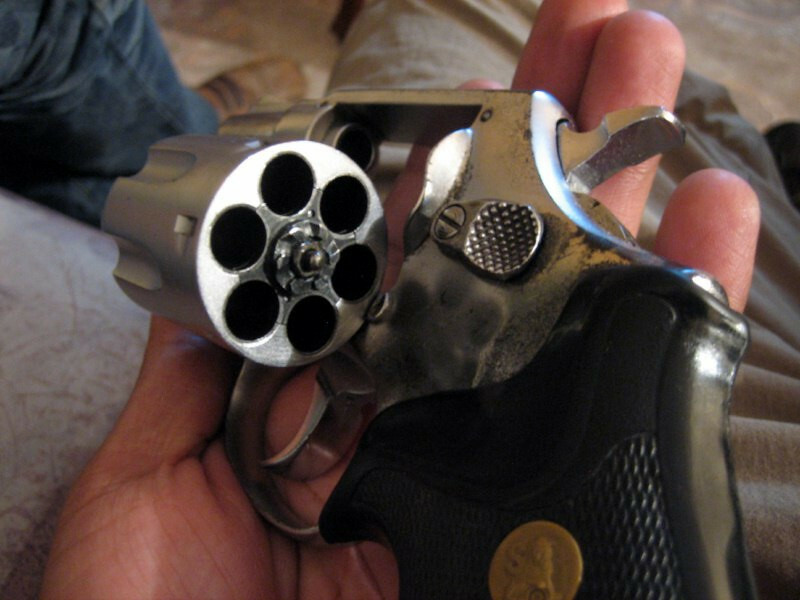 It’s a Spanish double-action police revolver and is chambered for the 0.38 Special cartridge with a 2-inch long barrel and fixed sights. 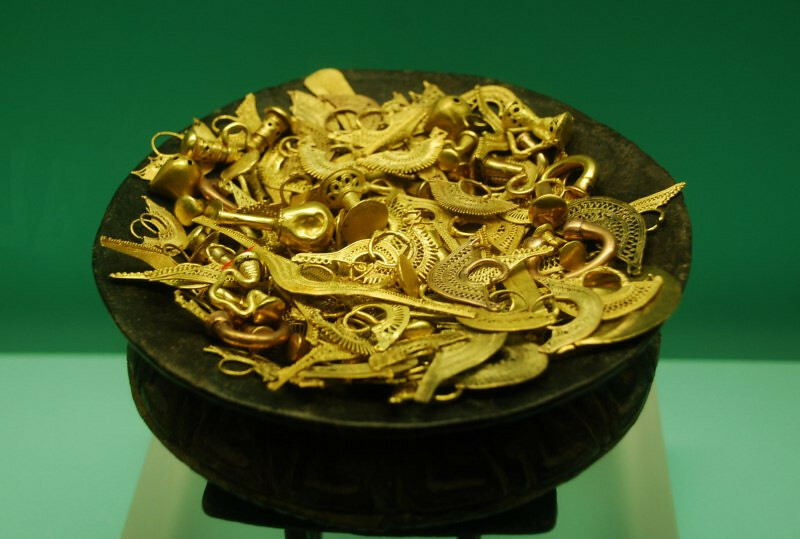 Six chamber cylinder. I’ve never fired a gun and thought I should at least try it before leaving the US, but never got around to it. Make love. 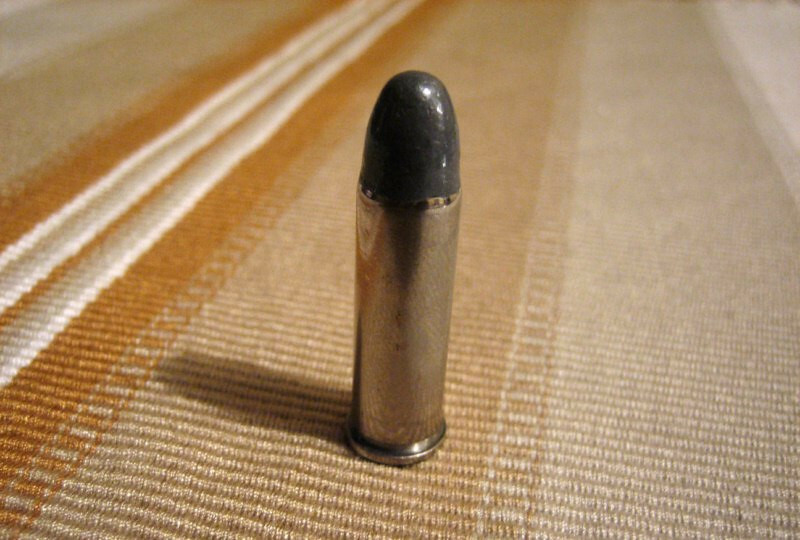 The 0.38 Special cartridge bullet. 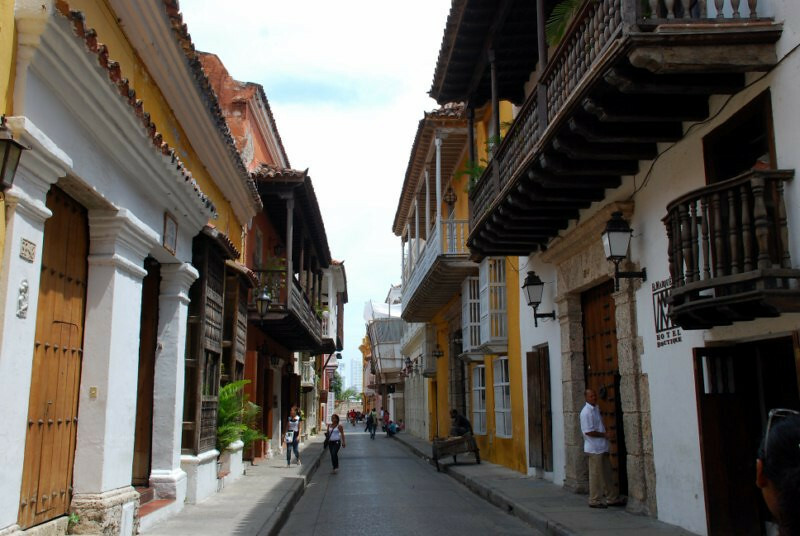 Cordoba’s house was in this tightly packed row of houses. 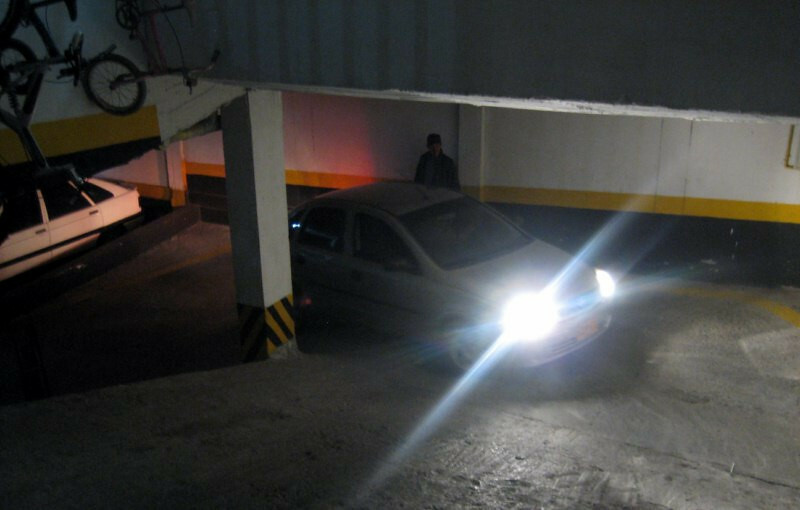 Having to reverse down the ramp into the underground parking at Barba’s place. It’s so tight that even compact cars have to make a 3-point turn to get down. 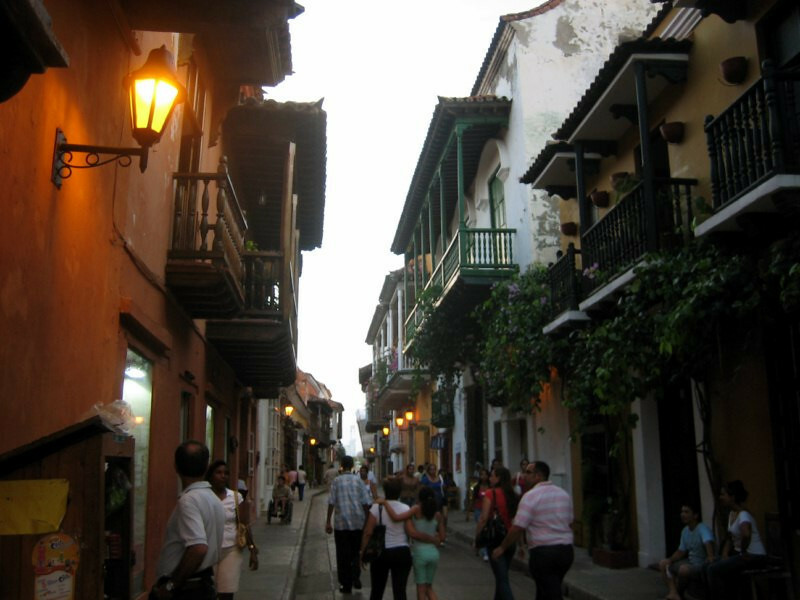 Taking a day trip the next day to nearby Salento, a small colonial town with Barba and some of his friends. 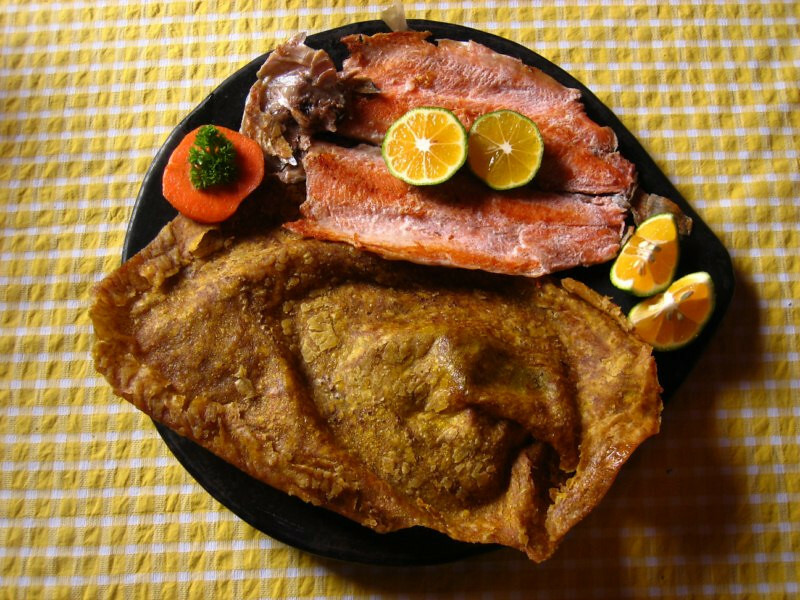 Lunch at Cocora’s Restaurante in Salento of Cayana de Trucha Dorado, which was a smoked fish similar to Salmon with a huge crispy tortilla. 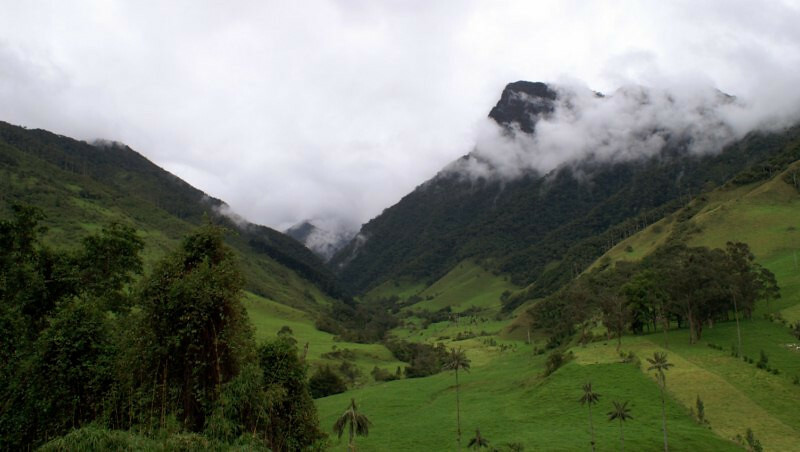 From Salento, we headed down to Valle de Cocora. It’s a lush valley surrounded by mountain peaks. It was raining slightly and the clouds were hanging low. Dairy cow enjoying the pasture all to herself. 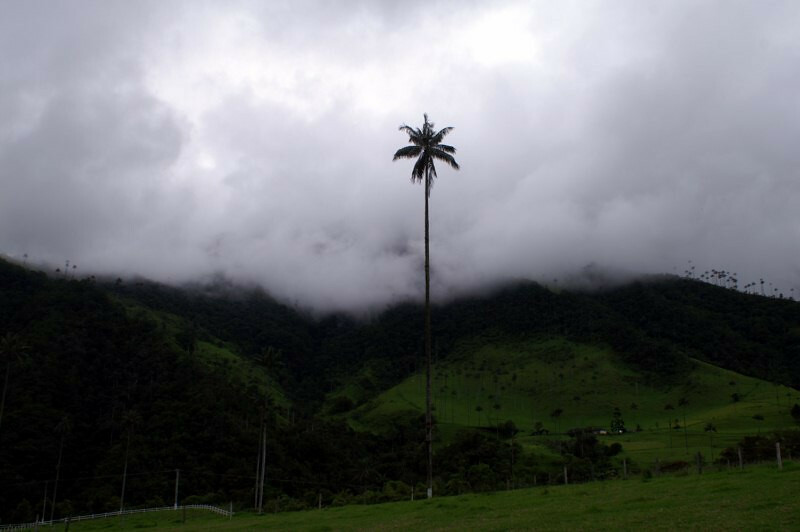 The strange thing about Valle de Cocora is the super tall palma de cera (wax palm) tree that thrives in the cloud forest. 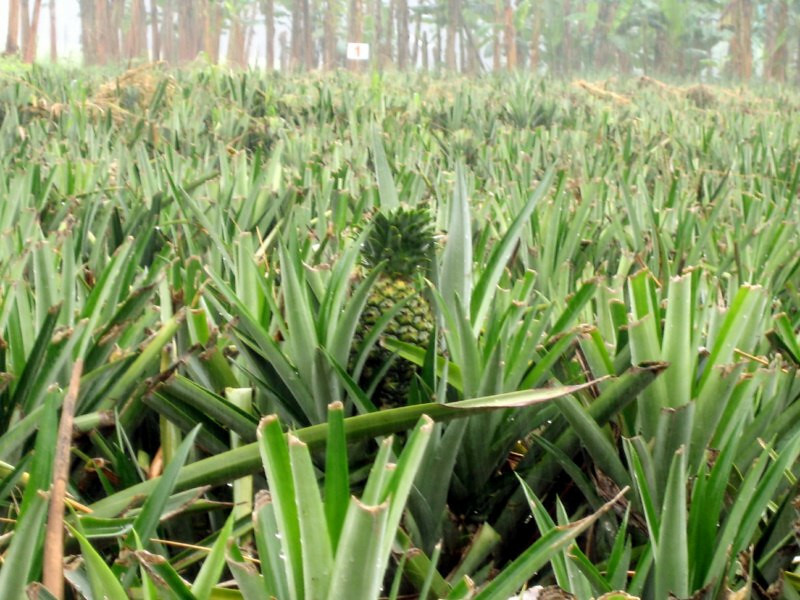 They grow up to 60 meters (200 ft) tall. Having some hot chocolate, which is different from hot chocolate in the States. It tastes watered down. 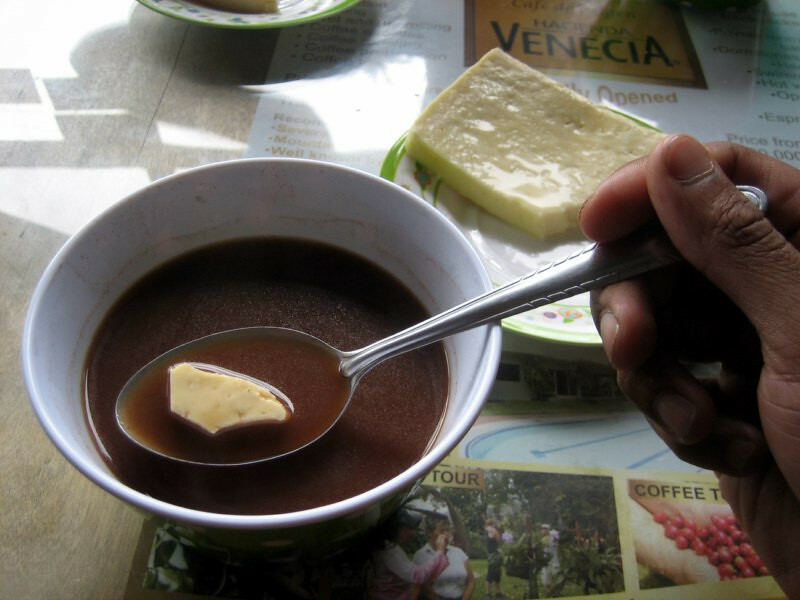 In Colombia, a slice of cheese (very tasty on its own) is usually served with hot chocolate and the crazy thing is you’re supposed to put the cheese in the drink so that it becomes soft and stretchy. I don’t know, but it didn’t seem to go well together. But she was making it look so tasty. 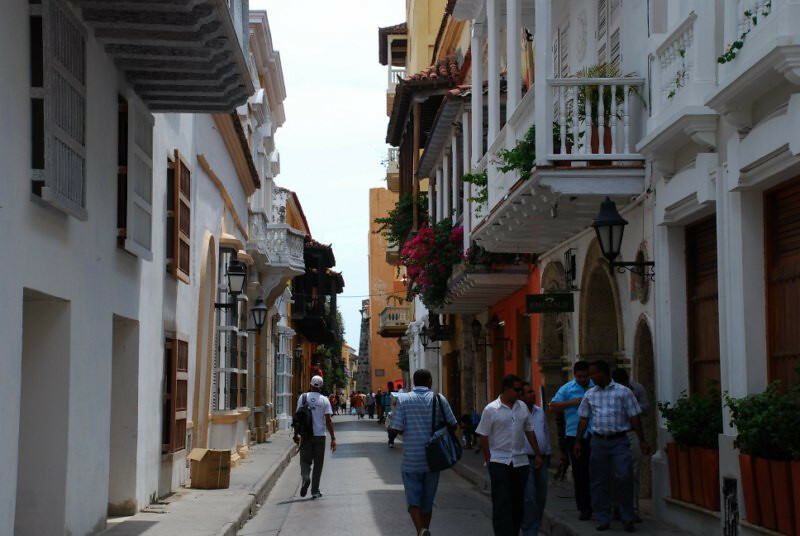 The women in Colombia are definitely very beautiful and a lot of emphasis is placed on beauty, encouraging a booming plastic surgery market, sometimes even for teenagers. 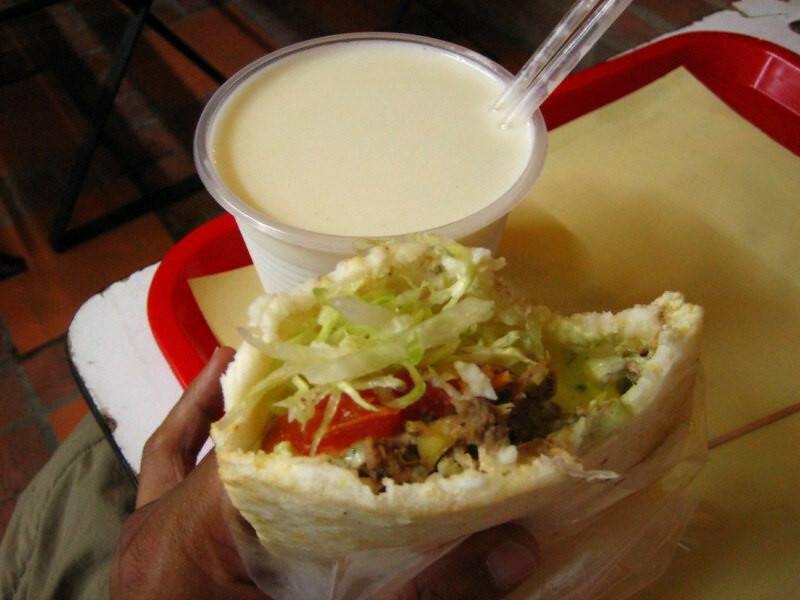 A freshly made Arepa con Queso (corn pancake with cheese). Getting a clear view of the peak as the clouds cleared. I was told there’s a dirt road leading along the valley to even more spectacular sights. 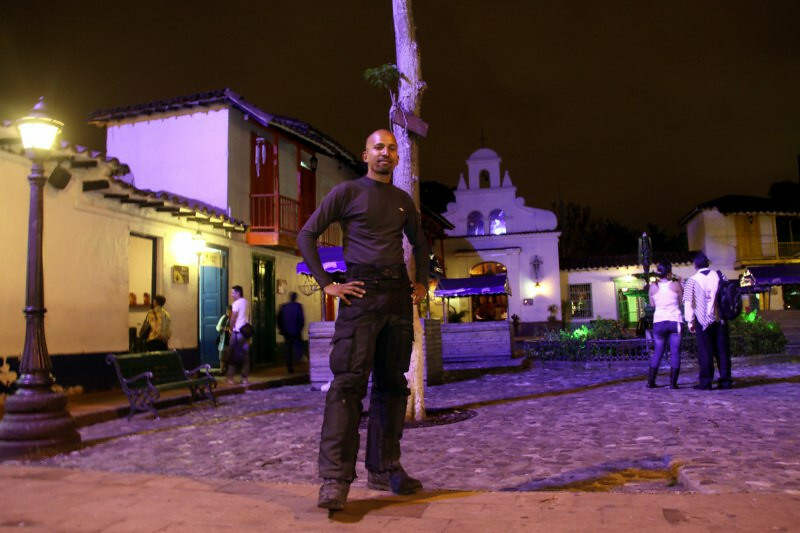 I need to come back and spend more time exploring Colombia. 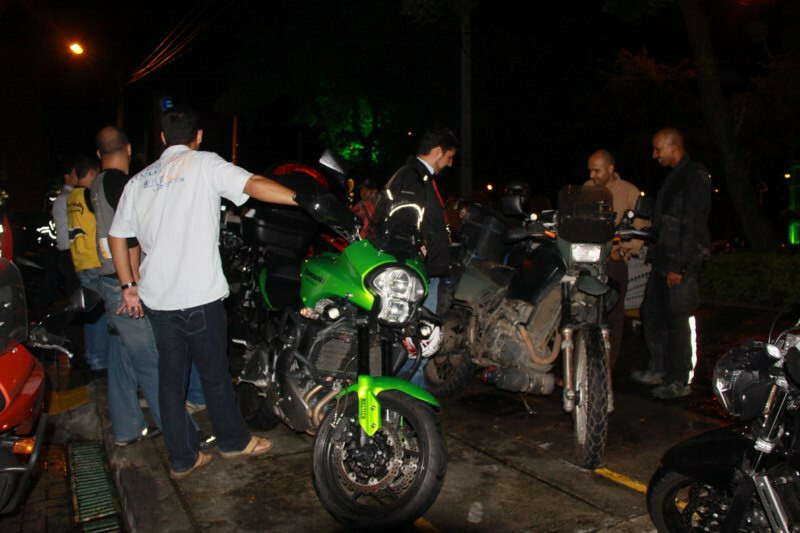 It was Thursday night again, so bike night in Armenia. One of the riders had this beautiful 2009 Suzuki GSX-R600 (I had a 2004 model) and he let me take it for a spin. 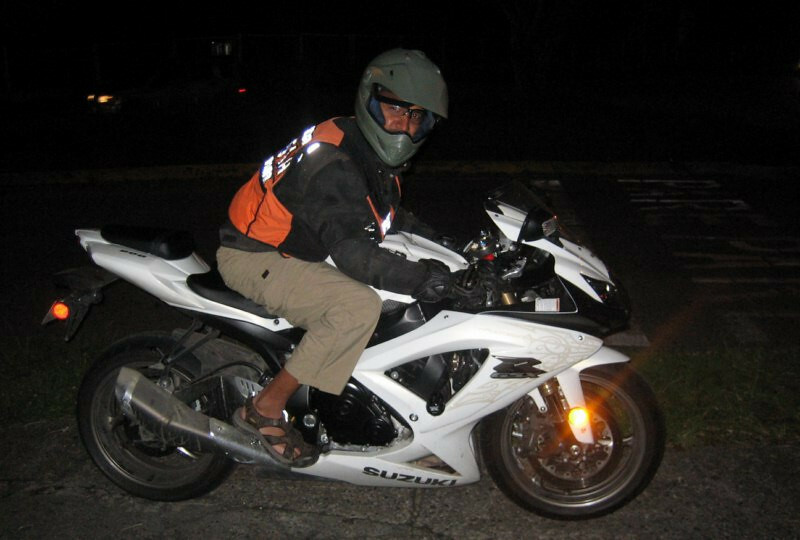 I’m such a squid, riding in sandals but the thrill of hearing 15,000 rpm again threw ATGATT (all the gear, all the time) out the window. With high import taxes, this bike cost $17,000 here, compared to about $9,000 in the US. 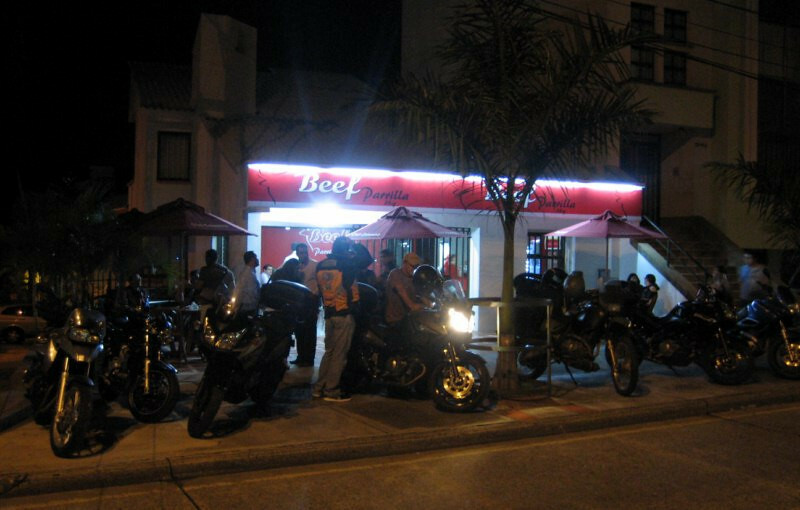 The bike night then moved to Jorge Peto’s new Beef Parilla (BBQ). V-Stroms again were very popular with a few sport bikes, a KTM and a 2 BMW GS’s. A rider on a Yamaha R6 owned a motorcycle shop in town and said I could use his shop and mechanics for the day if I needed anything done on the bike. Two Suzukis, built for different purposes but both thrilling in their element. 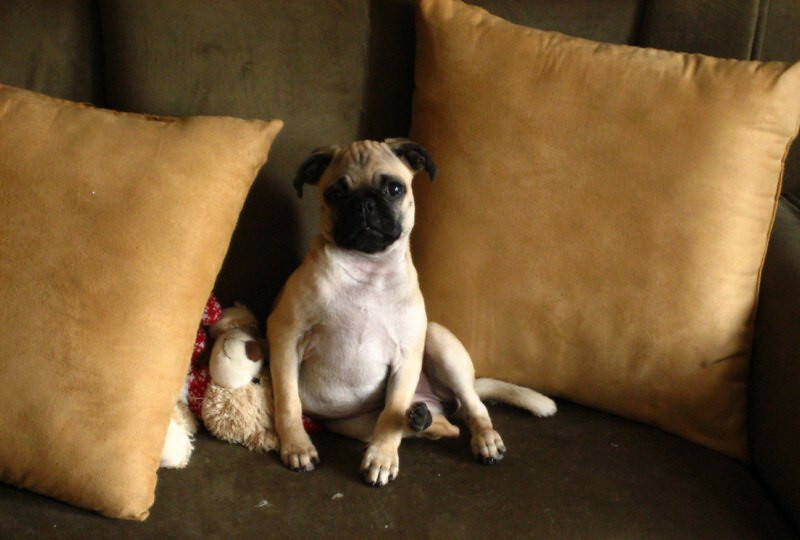 Barba’s cute little two month old Chinese Pug. A lot of character in a small compact body. The way it was hoping around all over made it look like a robotic toy. Spending a day at Otto’s motorcycle shop. I had a few small tasks to do on the bike. Here, Roberto is helping me figure out why my Solstice LED lights keep on blowing a fuse. He pointed out that the metal tab on the seat was making contact with the frame and the exposed part of the fuse from my Centech fuse panel and shorting out the lights. Easy fix. Doing my first valve check of the trip from San Francisco and everything was in spec. The bike has been running great with no problems. 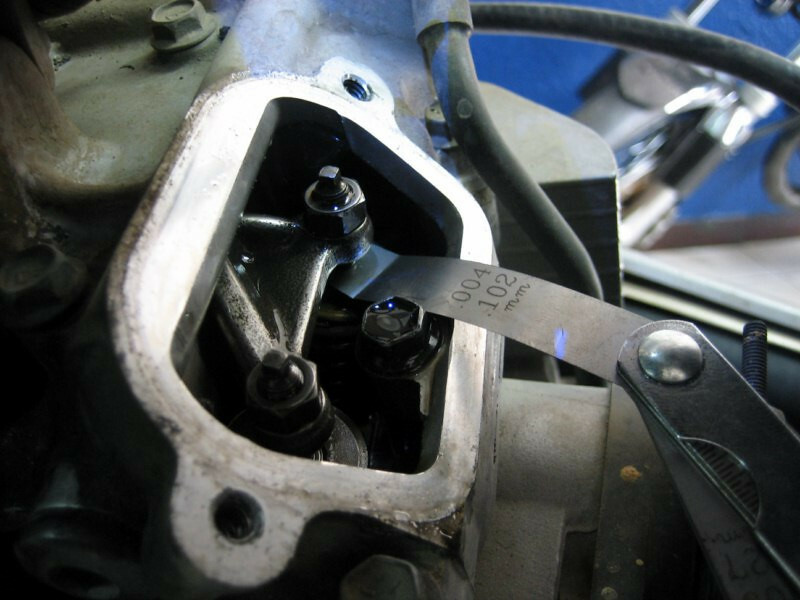 I also inspected and cleaned the spark plugs, washed and re-oiled the air filter and installed new in-line fuel filters in anticipation of dirty gasoline further south. 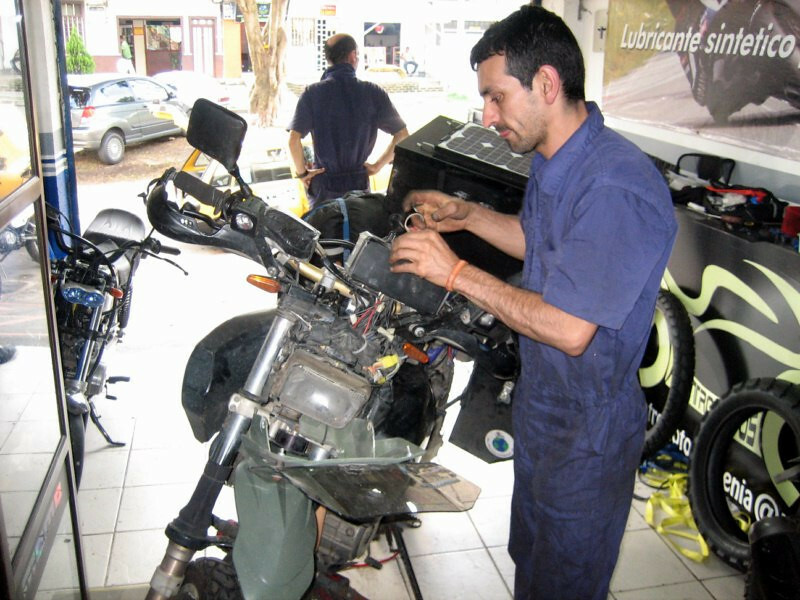 Barba and the others were impressed that I was doing my own maintenance, a must in my view on a trip like this, to make sure you’re aware of all aspects of the bike. 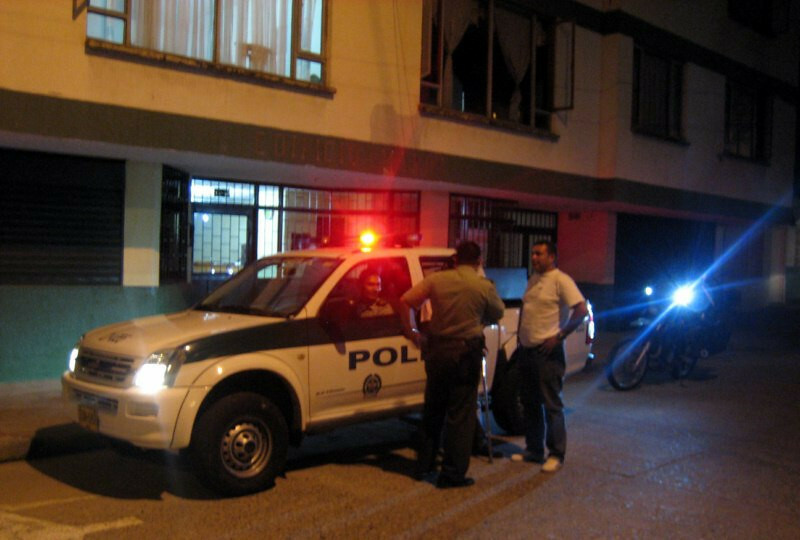 Being escorted by the local police back to Barba’s house after a late dinner. They were friends of Peto’s and were glad to oblige. They liked the bright Solstice LED lights. Meeting up with Andreas, El Paton who lives in nearby Calarca and has traveled the world on a Honda Africa Twin. He’s been around South America, up to Alaska, spent more than a year in India, then did South-East Asia and Mongolia to the Stans and Iran. 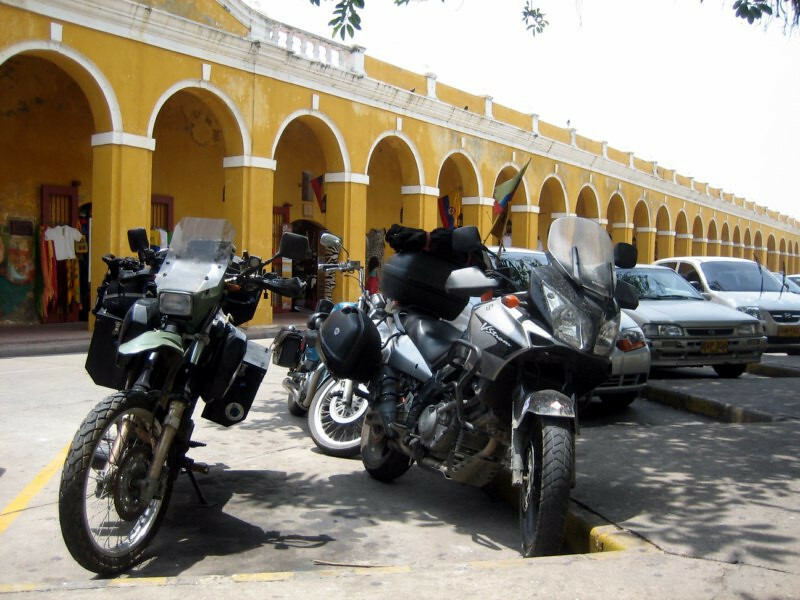 He’s planning to ride the Transamazônica highway through the Amazon in Brazil this August and has bought a DR650 for the trip, saying the Africa Twin is too heavy. Right on. 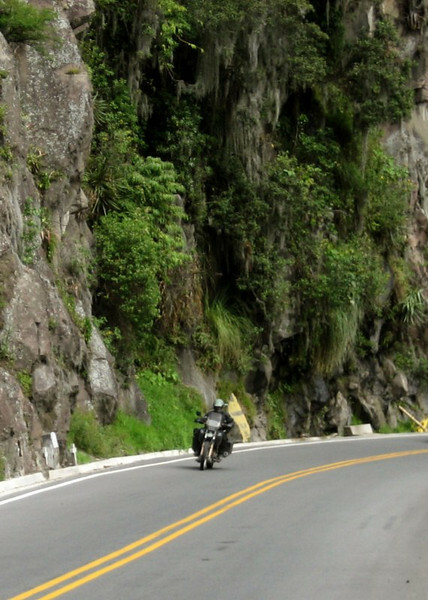 Since I’m planning to ride through there at the same time, we’re hooked up and plan to meet in Porto Velho. He’ll be coming down the river from Colombia to Manaus. 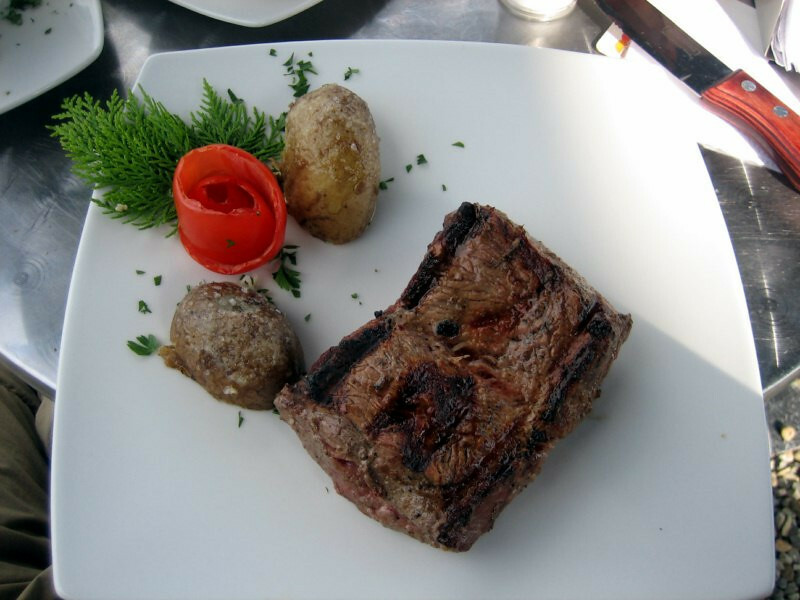 Having a tasty steak with a great view. That night, we were invited to Andreas’ friend’s farm house near Armenia. 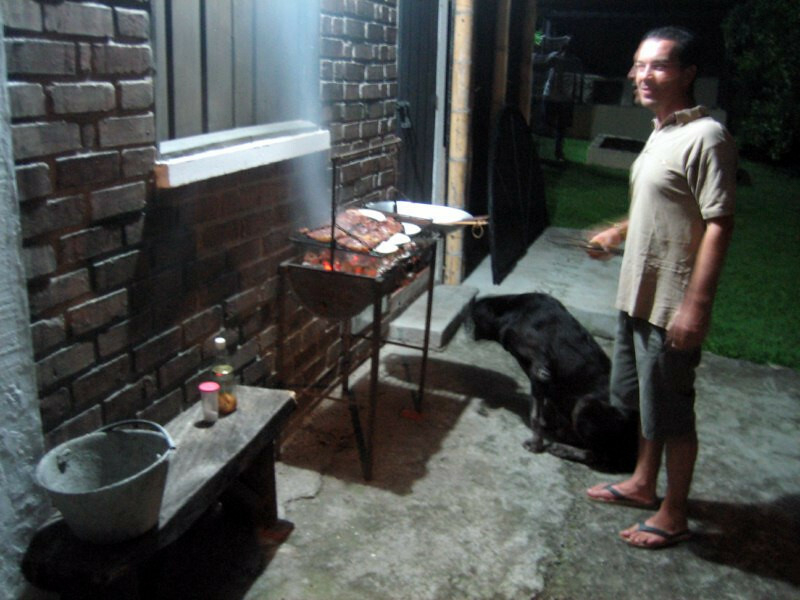 Our host grilling some steaks under the watchful eye of his aging great dane, 11 years old and showing it. 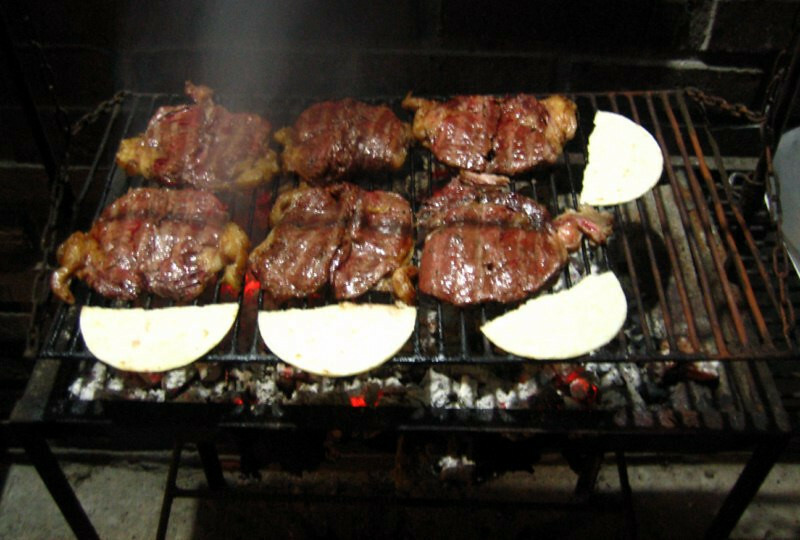 Steaks and arepas. I was having a bit too much red meat for my liking by this point, but hey, who’s complaining. 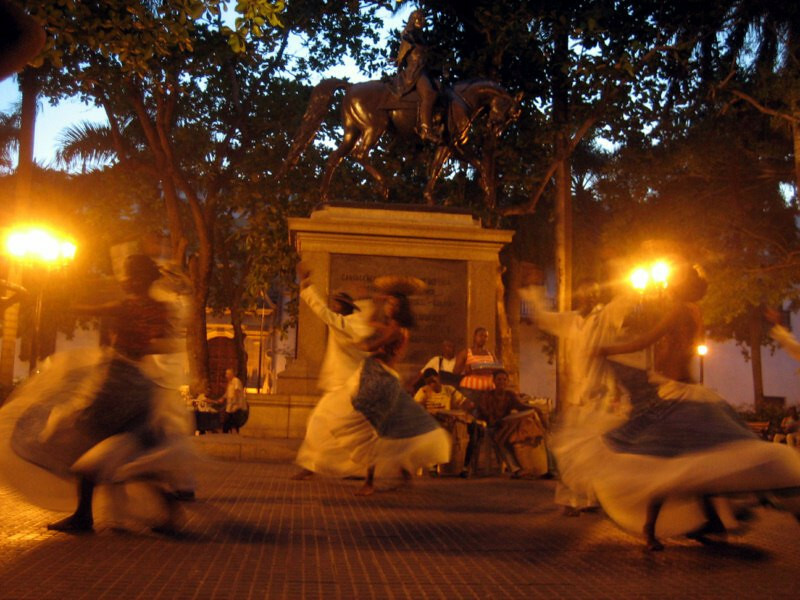 Can’t wait for Argentina. 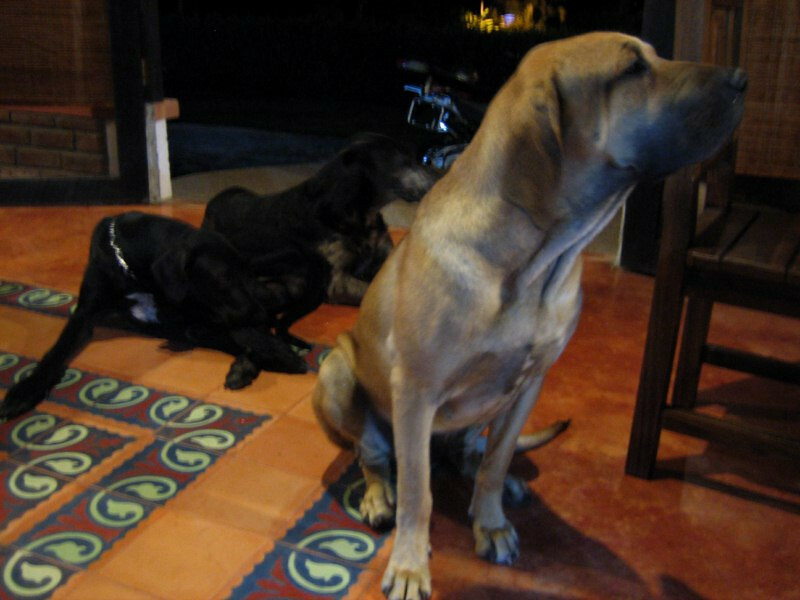 They had three great danes and even though they weren’t allowed in the house, they all gathered near the door and Dorris here is staring at the dining table. 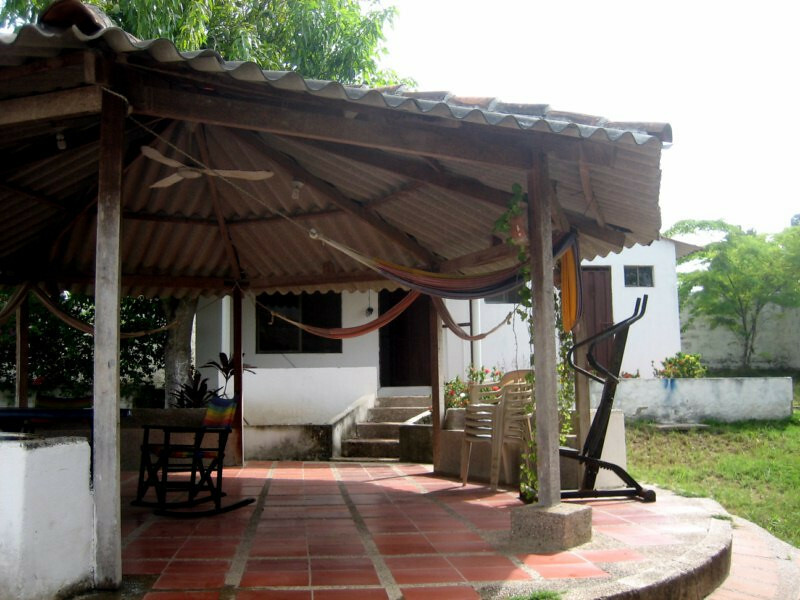 We spent the night there after finishing off a few bottles of aguardiente, splashed with good conversation. Nice view. Outdoor hot tub and lovely farm house. 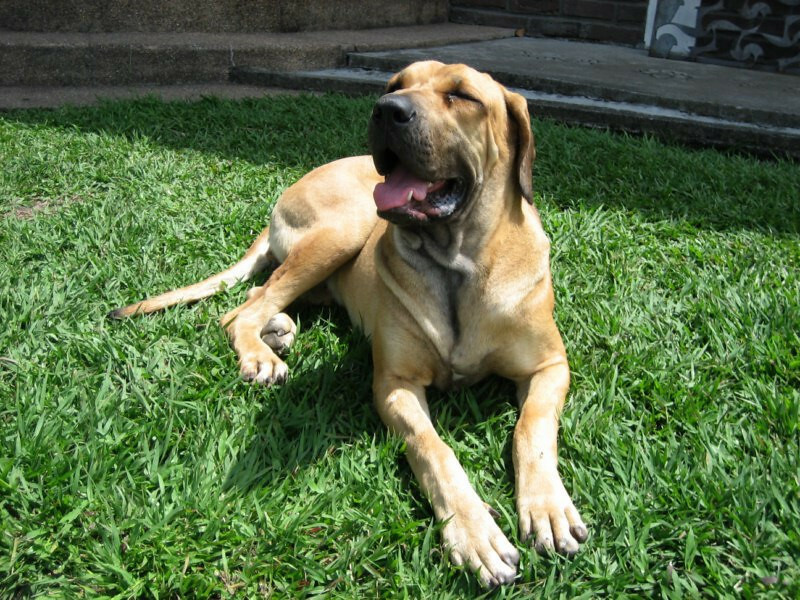 Dorris looking so cute. Awww. Having Sunday lunch with Andreas and his parents at the newly opened Bakkah restaurant in Calarca. 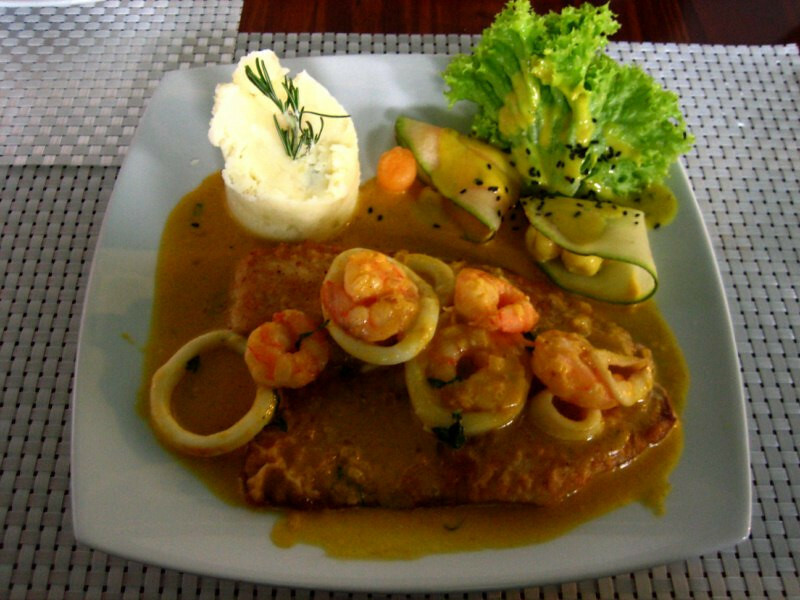 Having some fried fish with shrimps and calamari in a yellow sauce with mashed potatoes. Spending the afternoon at Bakkah with Andreas going over maps of Brazil, Chile, Peru and Venezuela. He’s an interesting guy and we had a lot to talk about. 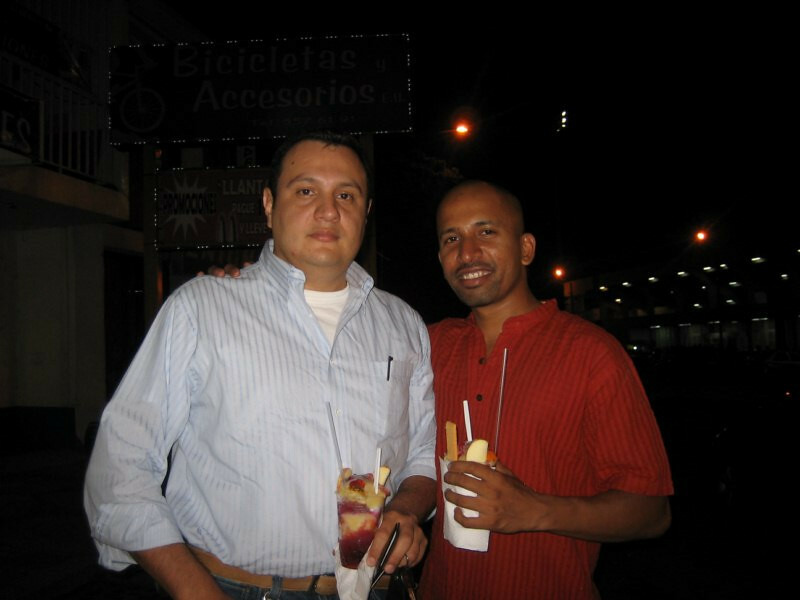 Plus, he was the first and only English speaker I came across in Colombia. My Spanish is pretty decent by now, as I’m spending time with only Spanish speakers and can hold a decent conversation, but need to learn more vocabulary. 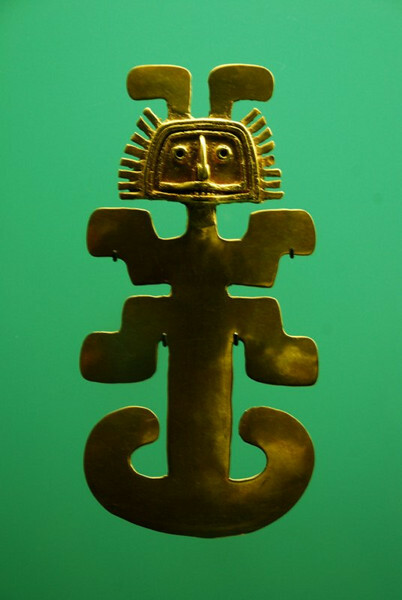 Looking forward to our trip on the Transamazônica. 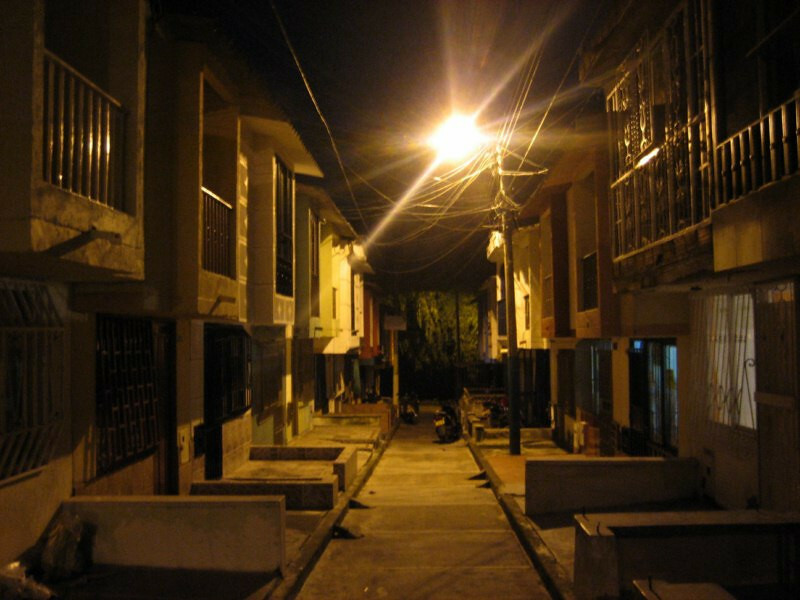 Spending the night at Andreas’ apartment in nearby Pereira. 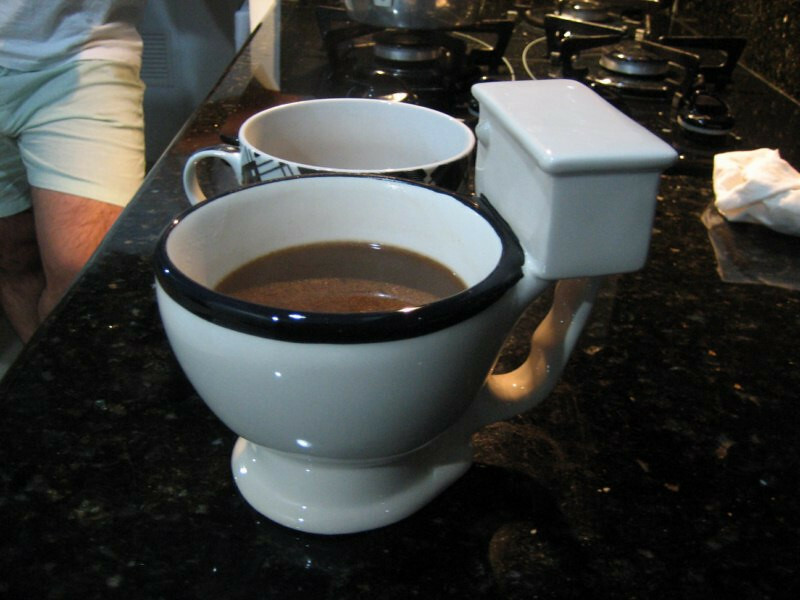 He got a real kick out of serving me hot chocolate in this toilet bowl of a cup, haha. The crazy things you can buy in America. 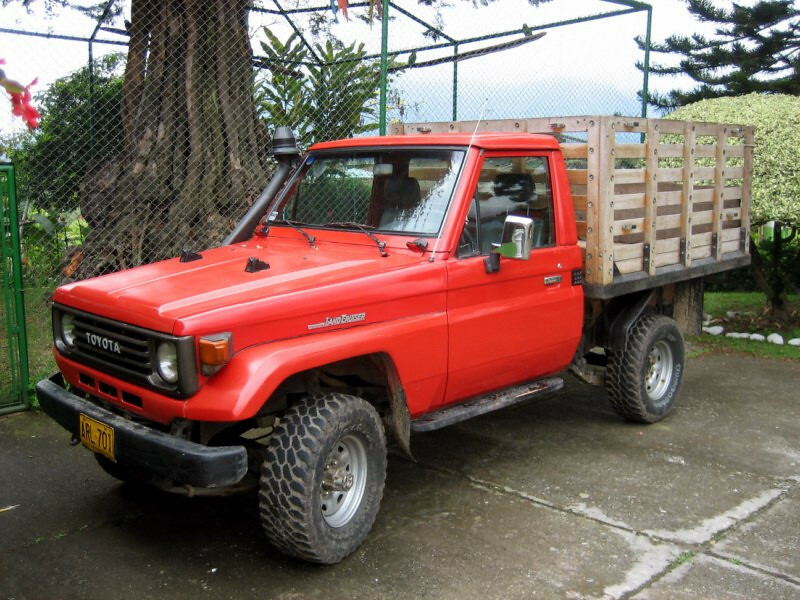 A hardy Toyota Land Cruiser truck at Andreas’ farm in Calarca. I’m enjoying seeing proper Land Cruisers, Land Rovers, Nissan Patrols and Mitsubishi Pajeros being used as they were intended down here, compared to all the soft, luxury versions in the US plying the Interstate. I grew up with Land Cruisers in Zambia and nice to see the design hasn’t changed much. I bet these models wont be suffering from Toyota’s recent poor quality and faulty brake computers. Keep it simple. 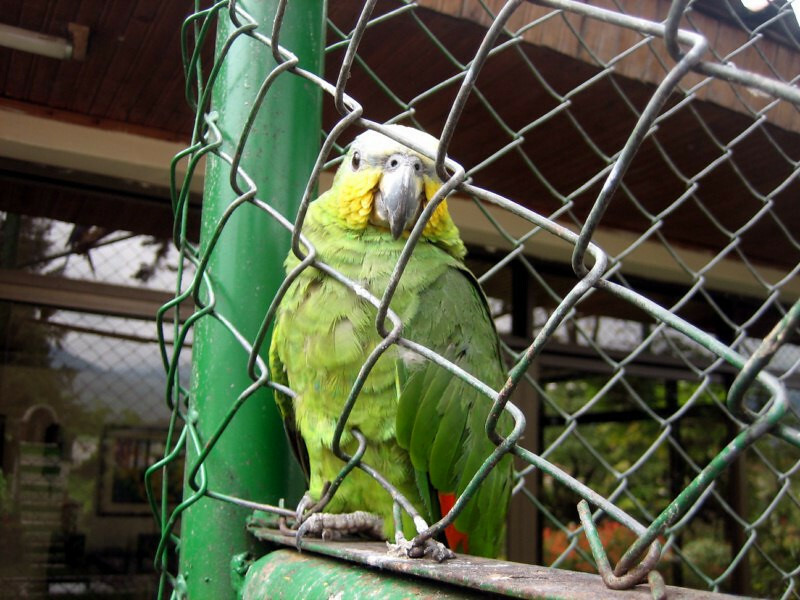 Andreas is into birds and has collected various parrots from around Colombia. 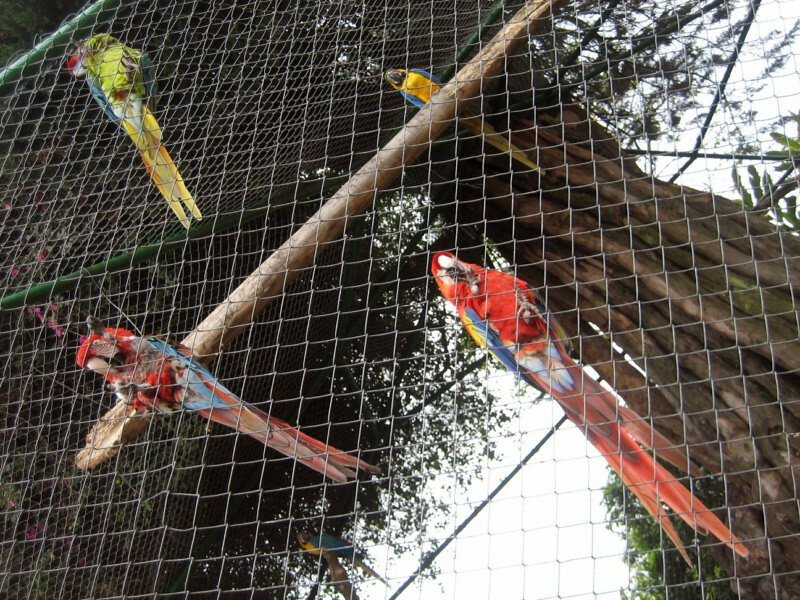 Colorful, noisy parrots in their huge tree cage. 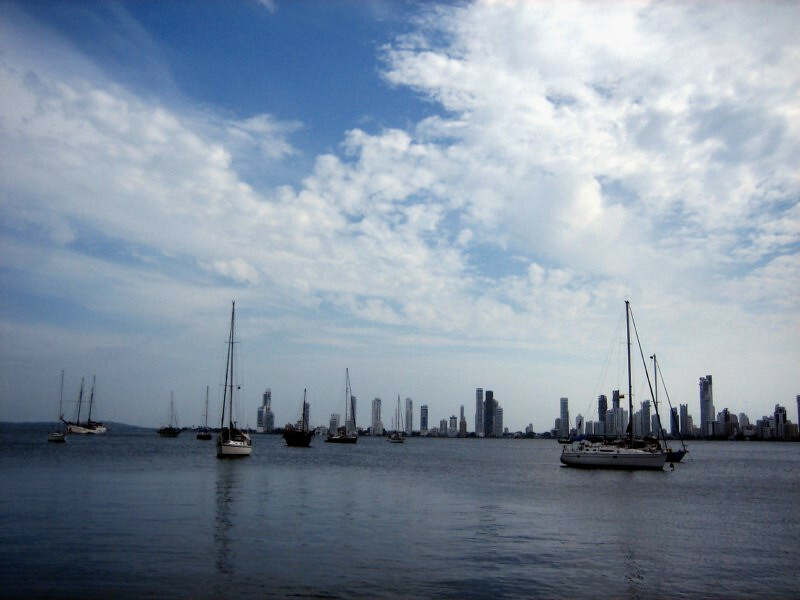 From Cartagena, I headed south to Medellin, about 700 kms (440 miles) away. 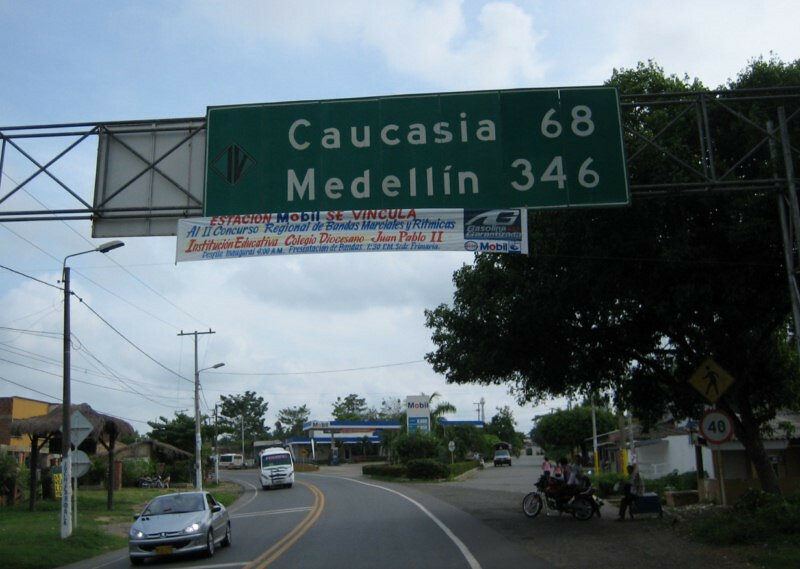 I broke up the trip, spending a night in Caucasia, about halfway there. 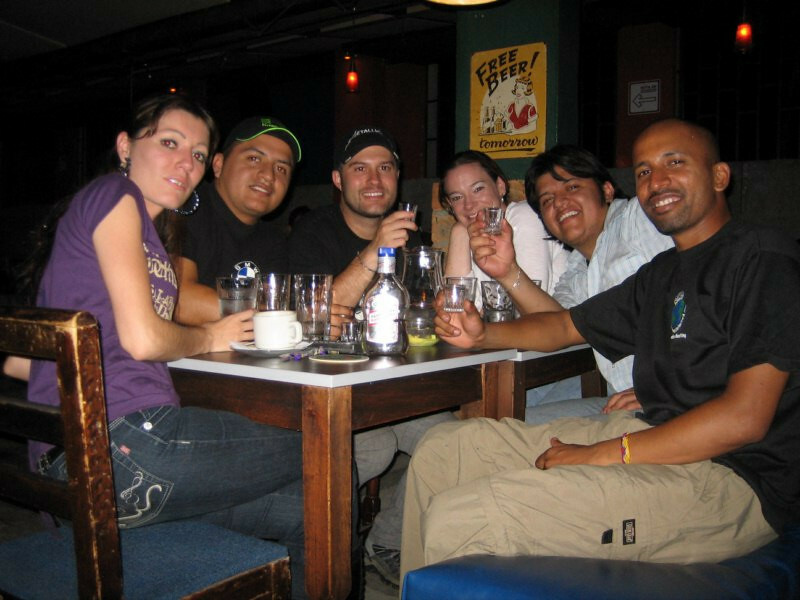 In Medellin, I met up with friends of Fernando Morales and Sargento who are also on TouringColombia.com, Jaime Andres and Dario Fernando. 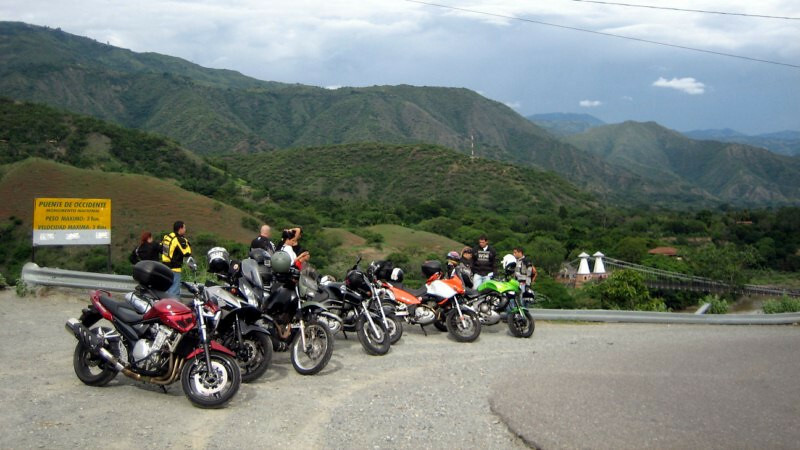 I planned to buy tires in Medellin as the choices and prices would be best, being the motorcycle capital of Colombia. Jaime was a great host and took me on day trips during the weekend to sights around the city. 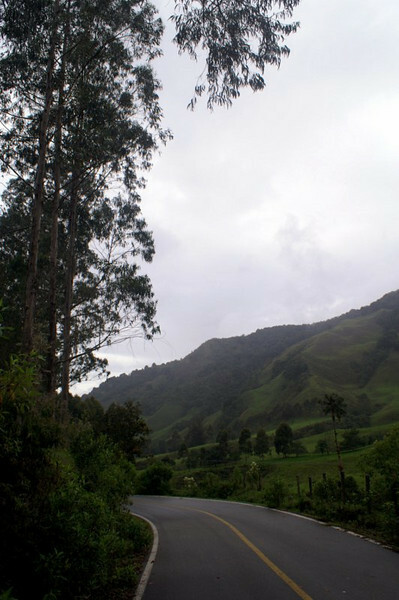 On Route 25, heading south to Medellin. 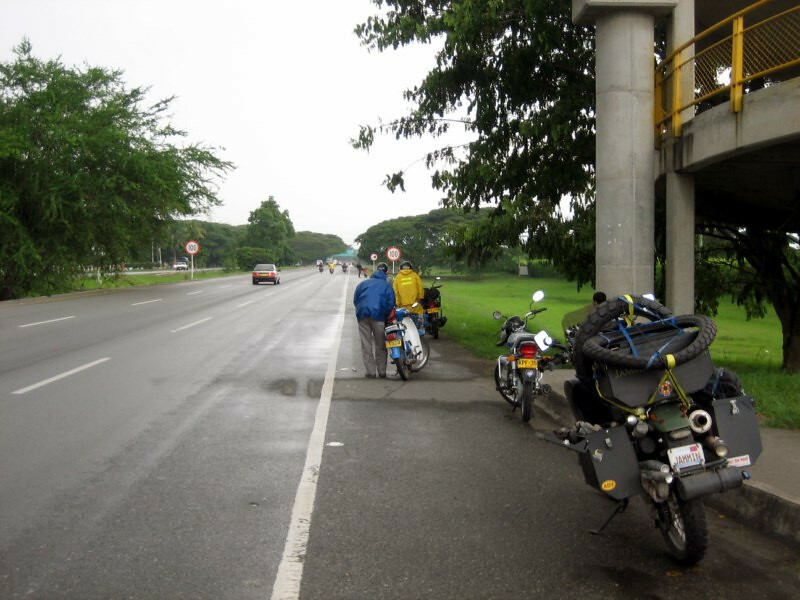 Most of the highways in Colombia are tolled, but it’s free for motorcycles. 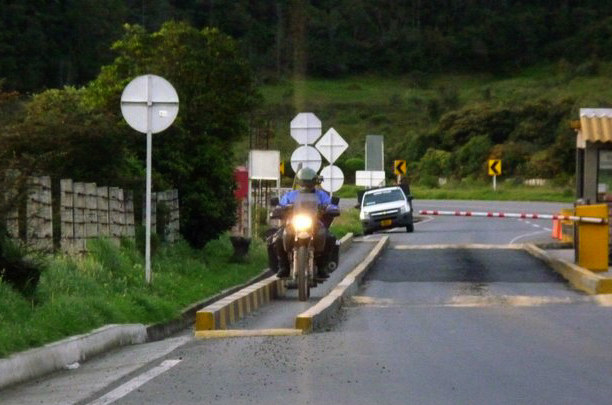 There’s a special lane on the far right for two-wheelers. Wish all countries would follow this example. 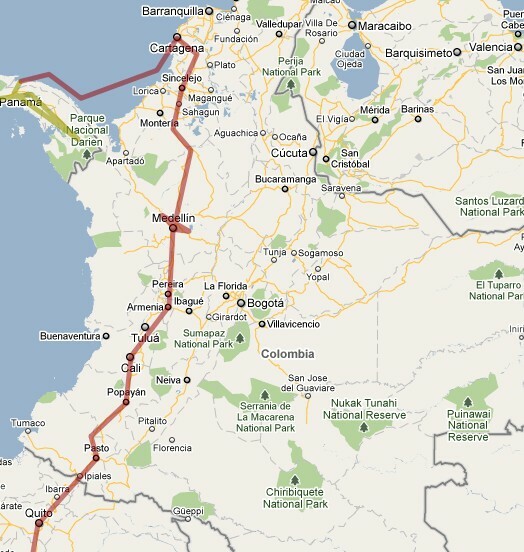 My route through Colombia. Click on it to go to the interactive version in Google Maps. 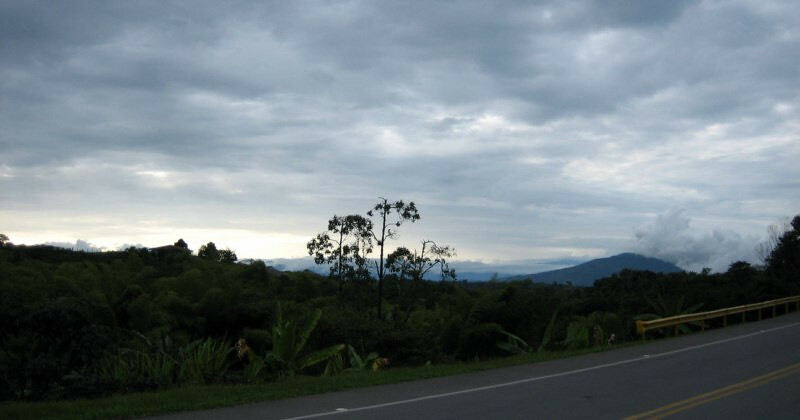 The route was generally flat until past Caucasia, but the scenery was still pleasing. 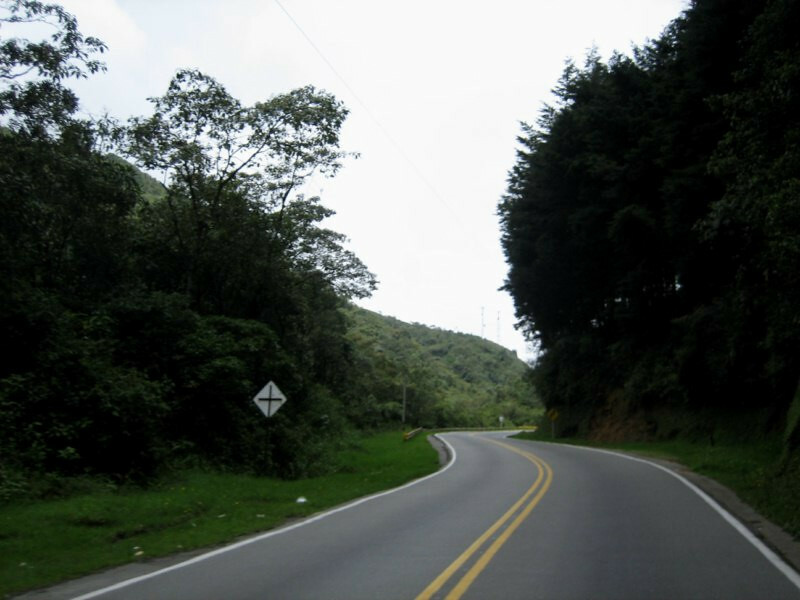 The roads were well-signed all through Colombia. 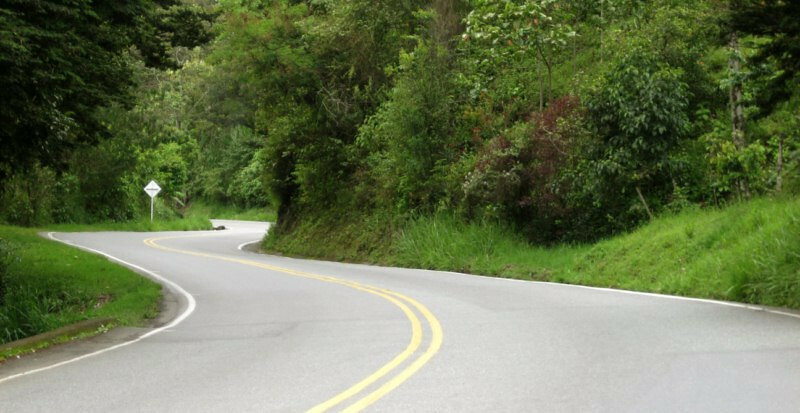 Good quality roads and shaded routes made for pleasant riding. 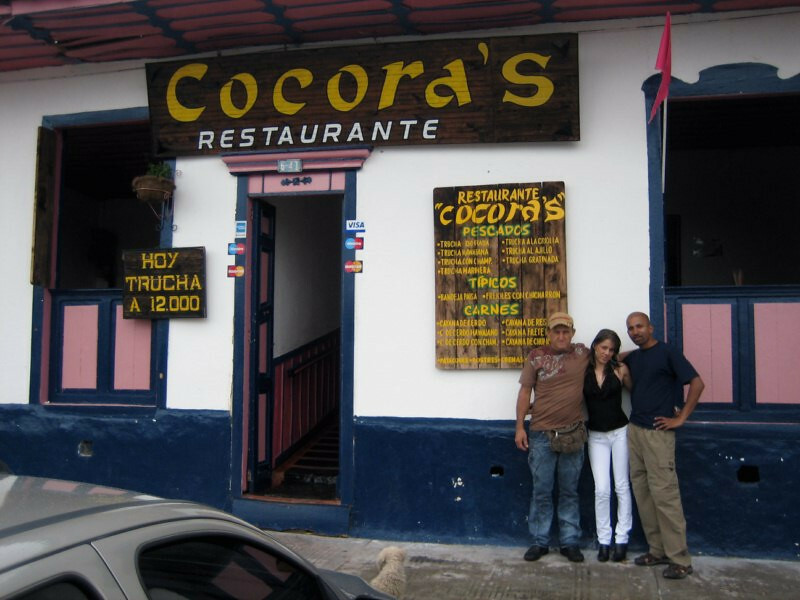 Dinner in Caucasia for COP 4,000 (Colombian Peso, COP 2000 = USD $1). 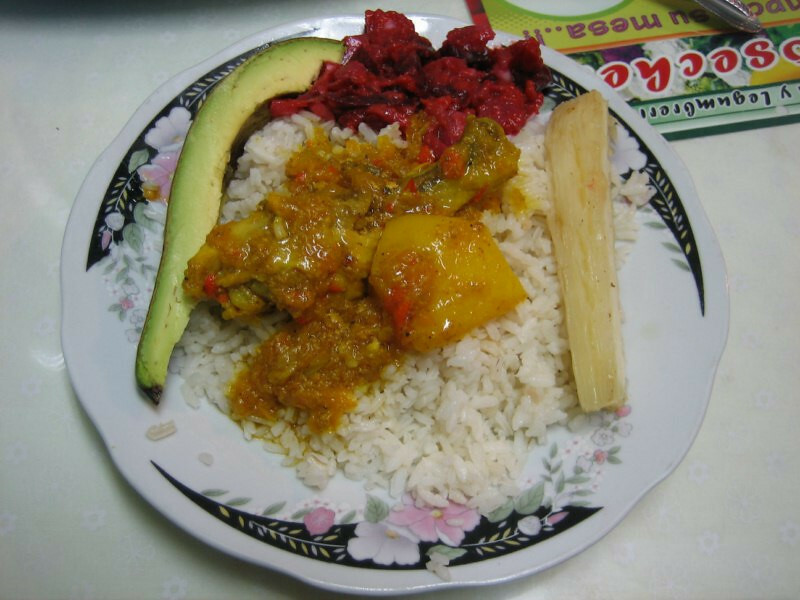 Rice with chicken and potato in sauce with a slice of avocado and yuca and a radish/onion salad. 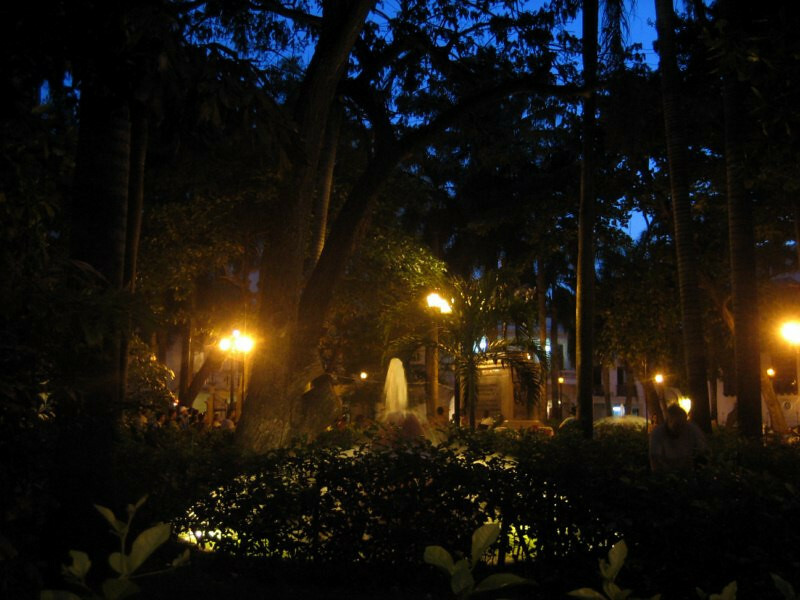 I stayed in Hotel Genesis for COP 18,000 plus another 1,000 for secure parking. …from where the road starts climbing up and over a ridge. Lots of slow trucks on the ascent leading to unwise overtaking maneuvers. I know, I’m guilty too. 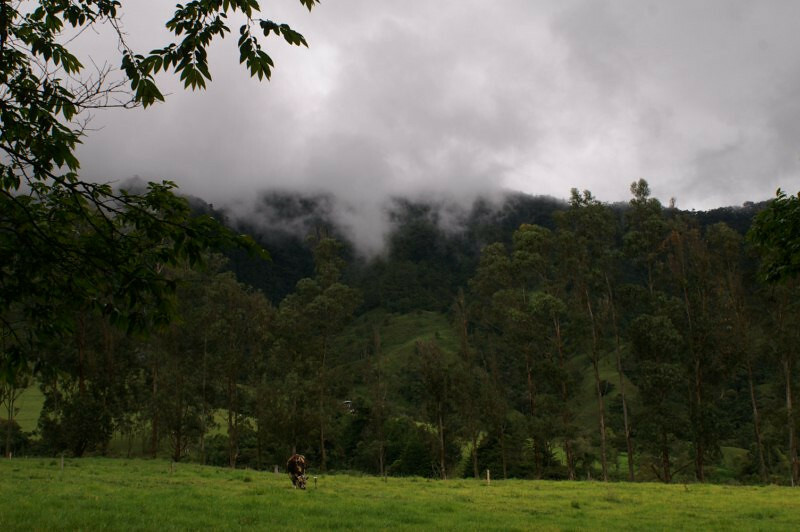 Eucalyptus trees on the top of the ridge before descending down to Medellin. Nice views from the road. 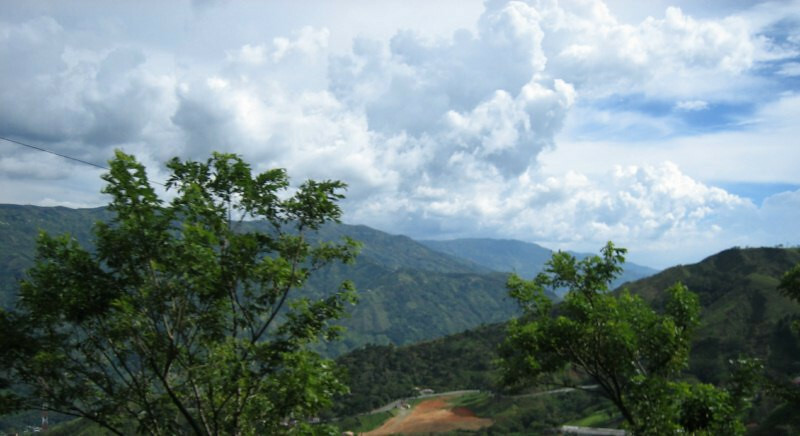 Elevation was about 2,100 meters (7,000 ft) and Medellin is down in a valley at 1,500 meters (5,000 ft). Meeting up with Jaime Andres (pronounced “hy-mee”) at a gas station in the north of city. 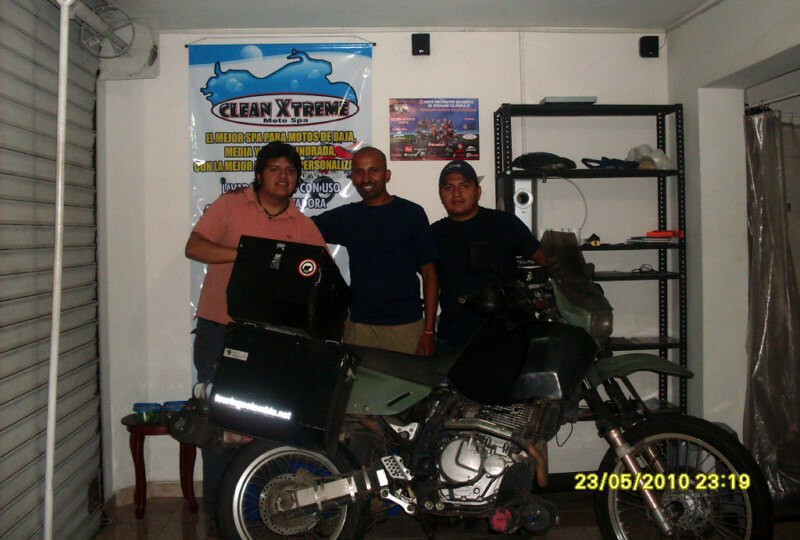 Jaime is a friend of Fernando in Cartagena through the national Colombian motorcycle forum of TouringColombia.com. Jaime’s riding a bright green Kawasaki Versys. 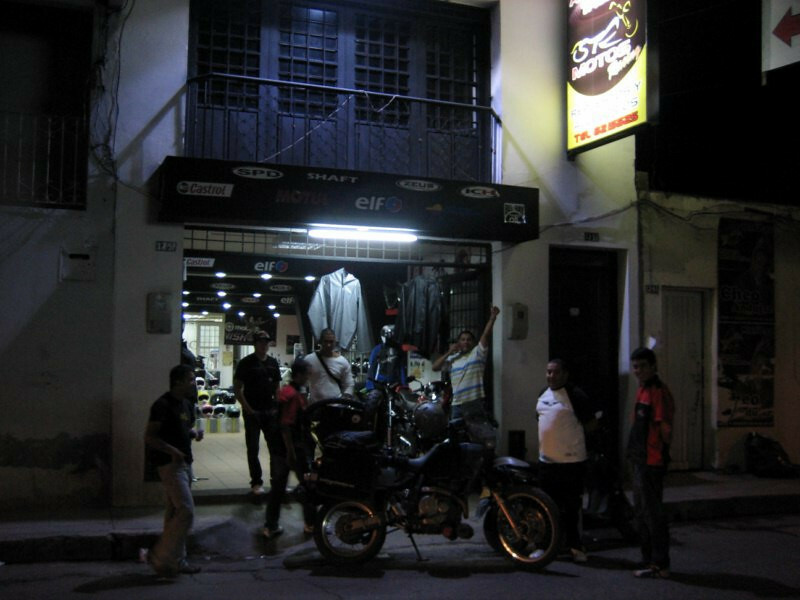 Thursday nights all over Colombia is bike night and Jaime took me to the local hangout to meet all the other bikers in town. After meeting up with everyone, we took a ride around the city. 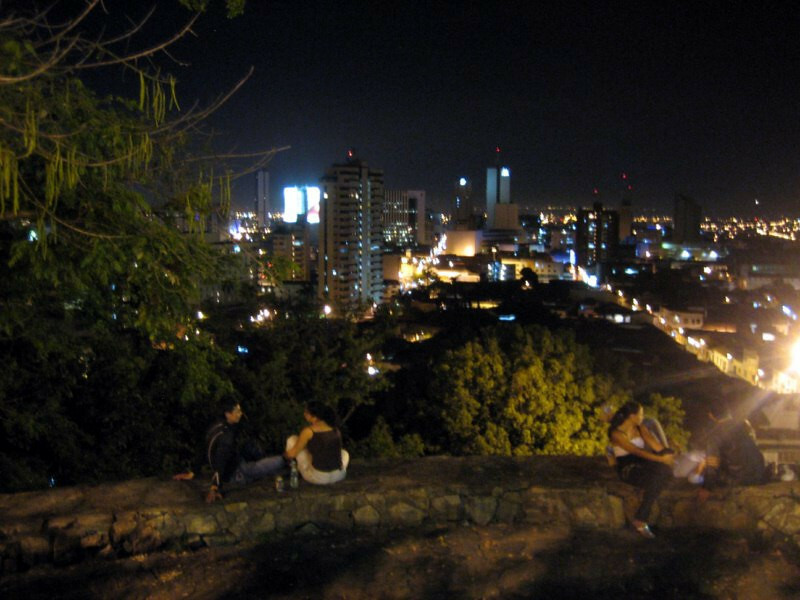 First stop was this lookout with a fantastic view of the city at night. 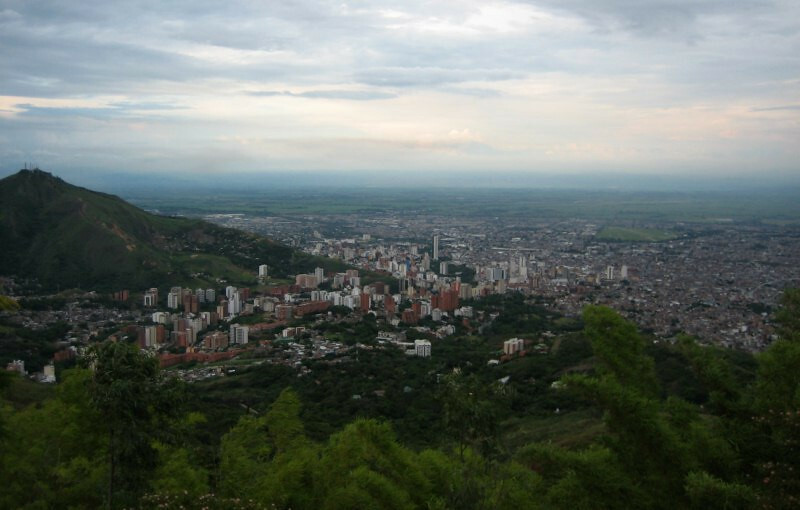 Medellin is in the narrow north-south Aburrá valley. 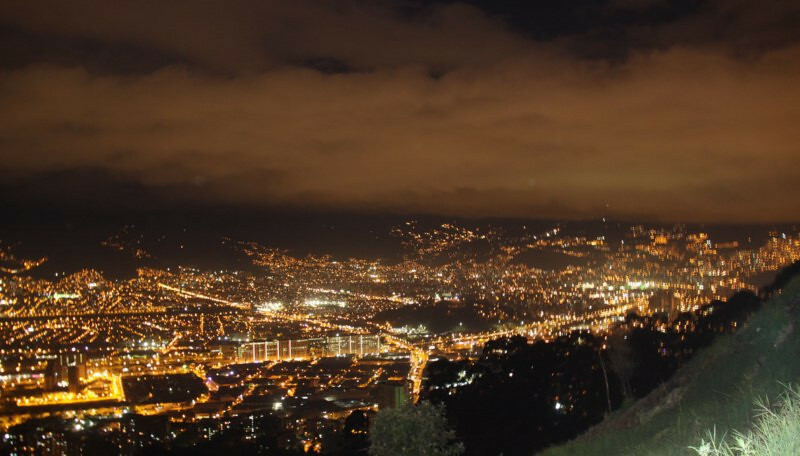 It’s the second largest city in Colombia, under the capital Bogota, with a population of 2.4 million. 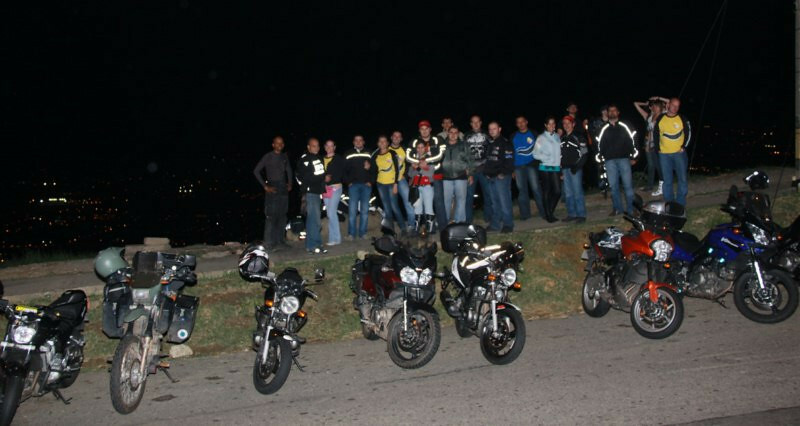 The Medellin TouringColombia crew at the lookout. Heading back down the fun twisties. Having huge mountains nearby provides lots of fun riding. 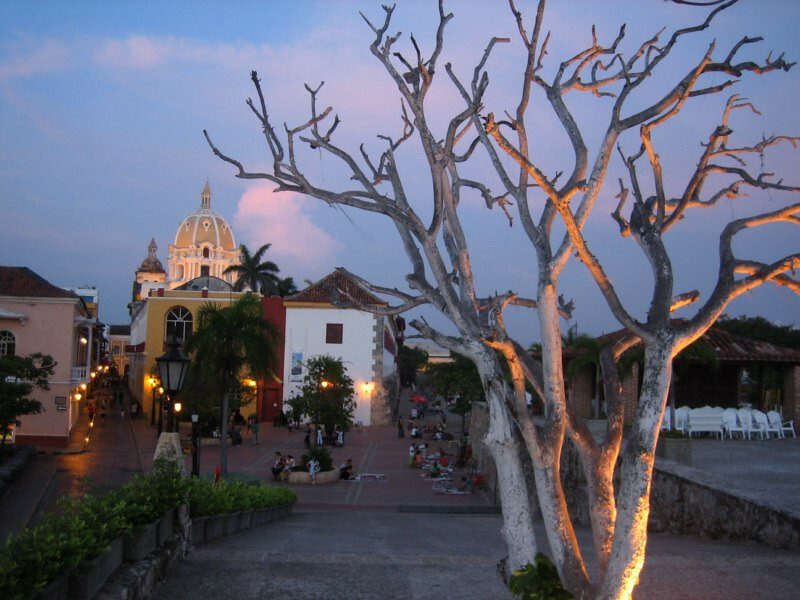 Next stop was Pueblito Paisa, a representation of small towns typical of the region. 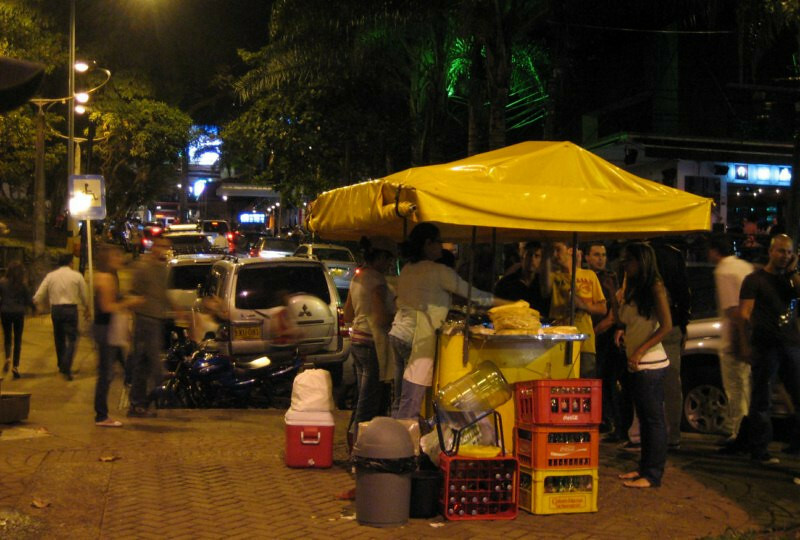 People from Medellin and surrounding areas are referred to as Paisas. 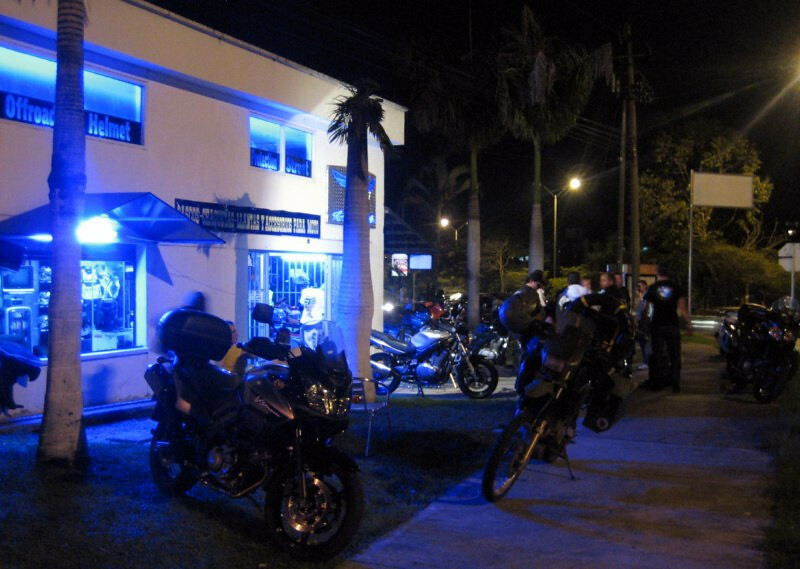 Around 10 at night we pull into the traditional biker restaurant for some grub. 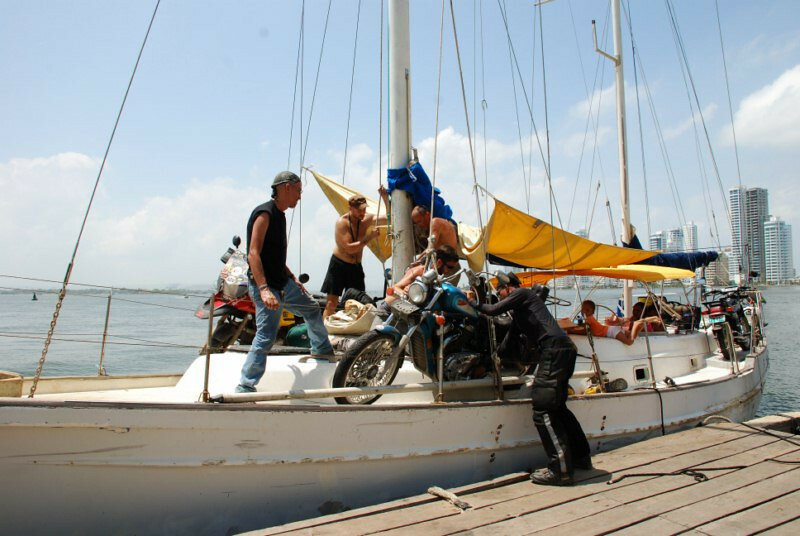 They have a very active crew and get together for rides and other events quite frequently. Reminded me of bike nights at Strats in Chicago with ChicagolandSportBikes.com. 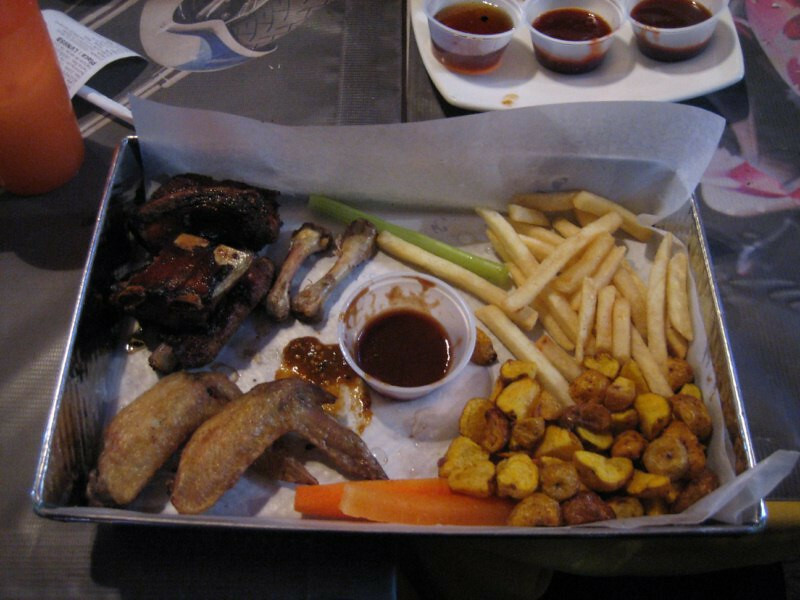 A welcoming change from all the rice and chicken; ribs and wings with fries. 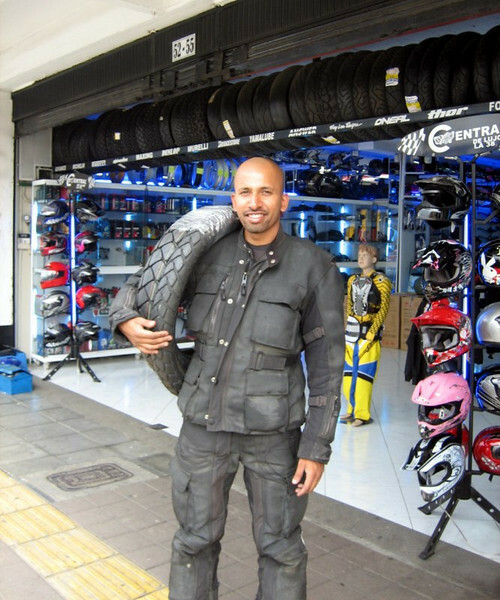 The next day, Jaime took me around to shop for tires. 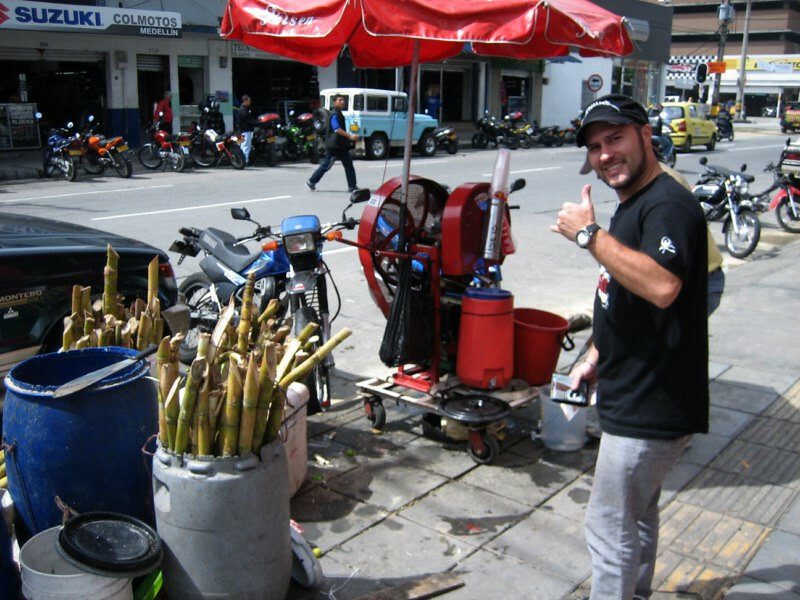 Getting some fresh sugarcane juice. My bike was at Jaime’s girlfriend, Ana Marie’s Suzuki shop for a complimentary service and we were scooting about the city on Jaime’s fetching blue/white Vespa. Also note the Bajaj shop there. 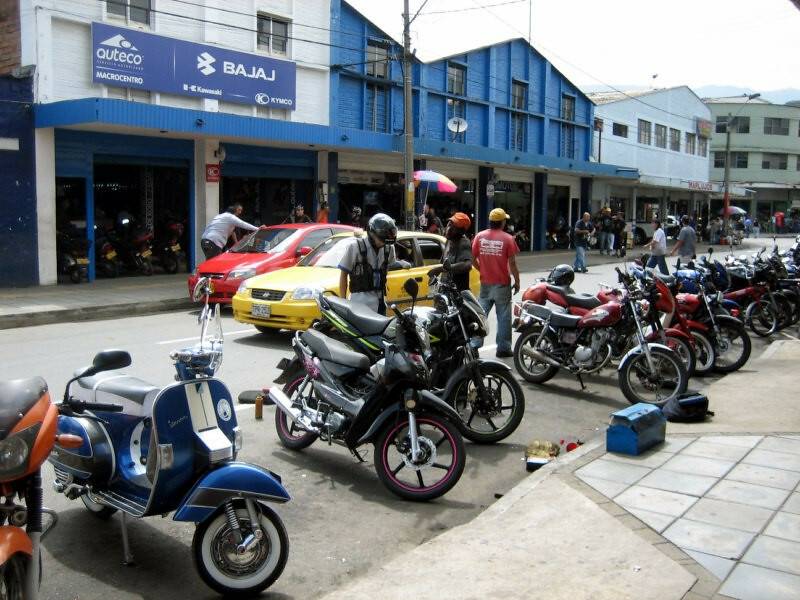 Bajaj is an Indian motorcycle company and is the most successful motorcycle company in Colombia in the sub-250cc category. It made me proud to see so many bikes from the homeland doing so well abroad. The 180cc and 200cc Pulsar have their own following and are well respected. 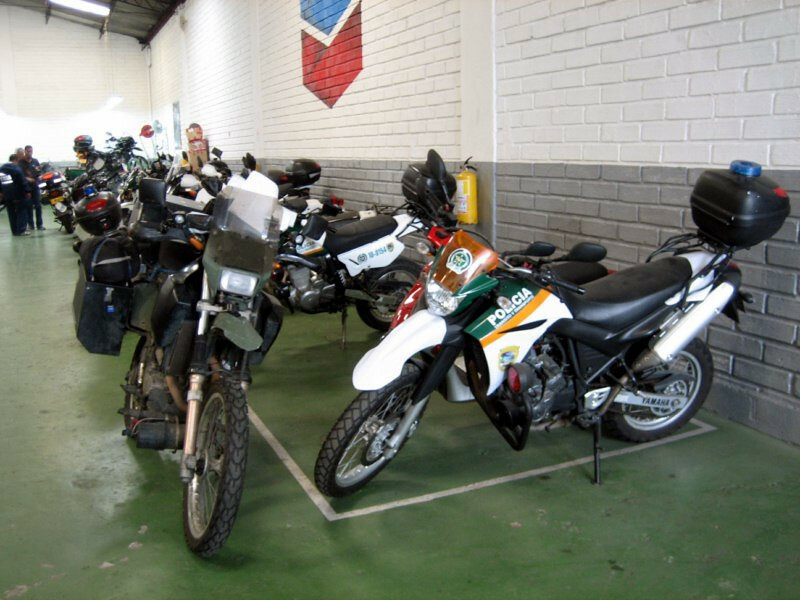 The Bajaj’s are assembled in Colombia by Auteco, thus skipping the high import tariffs and making them affordable to the masses. Had to get a picture with the cute Vespa. Note the spare wheel in the back. 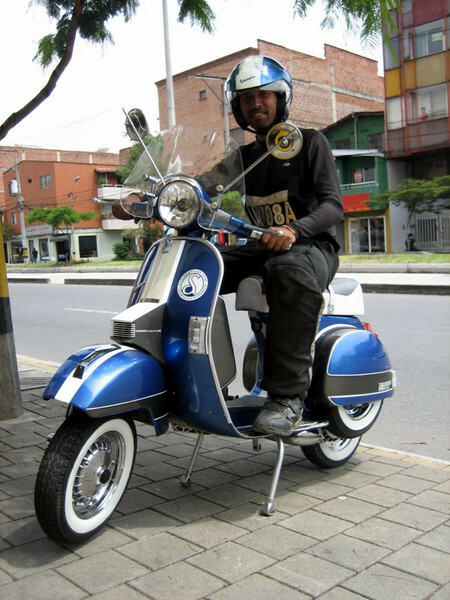 And the vest I’m wearing with the license plate of the two-wheeler is required in Colombia for safety reasons. 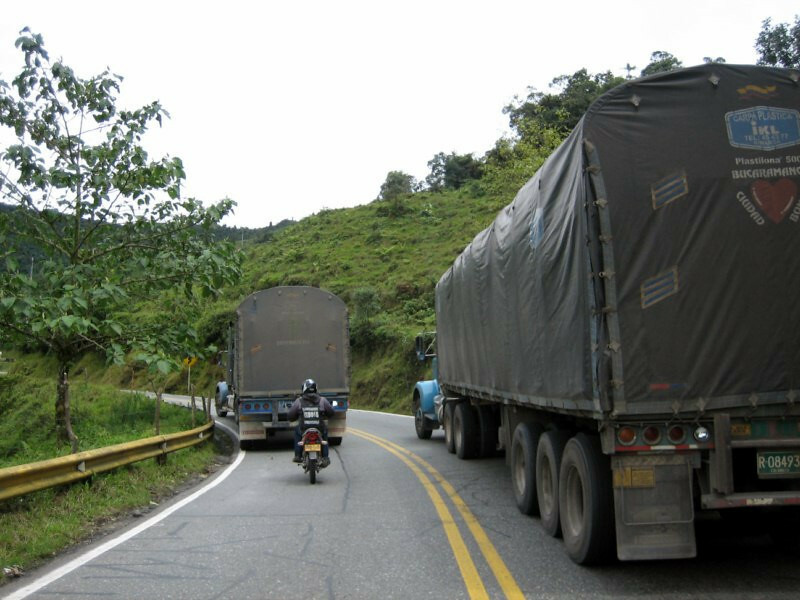 One reason is for quick theft identity as the helmet also has to have the license plate number on it and the other safety reason is that the reflectivity of the vest provides additional visibility for truckers, who’ve run into numerous riders. 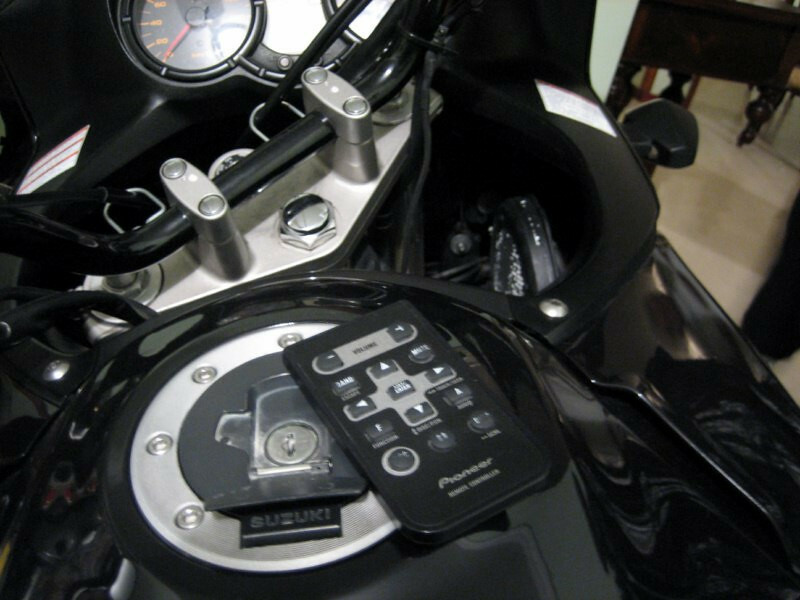 However, this is not required for foreign riders and I wasn’t given any trouble by the police when I was on my bike. Picking up sanDRina from Ana Marie’s Suzuki service shop. She said all passing travelers get a free servicing. Since nothing really needed servicing, I had them just lubricate my clutch cable and properly set the tire pressures. Lubricated clutch cable was much needed; so much clutching in city driving. 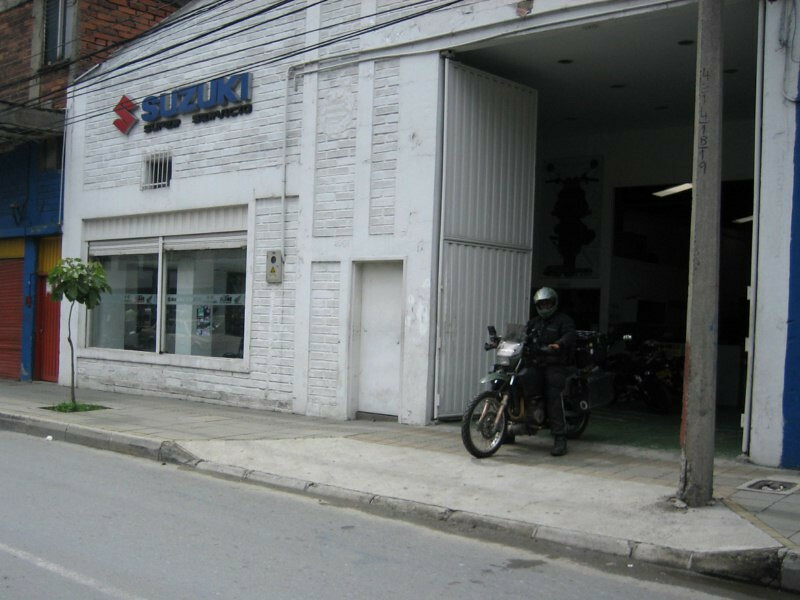 Leaving the Suzuki shop. 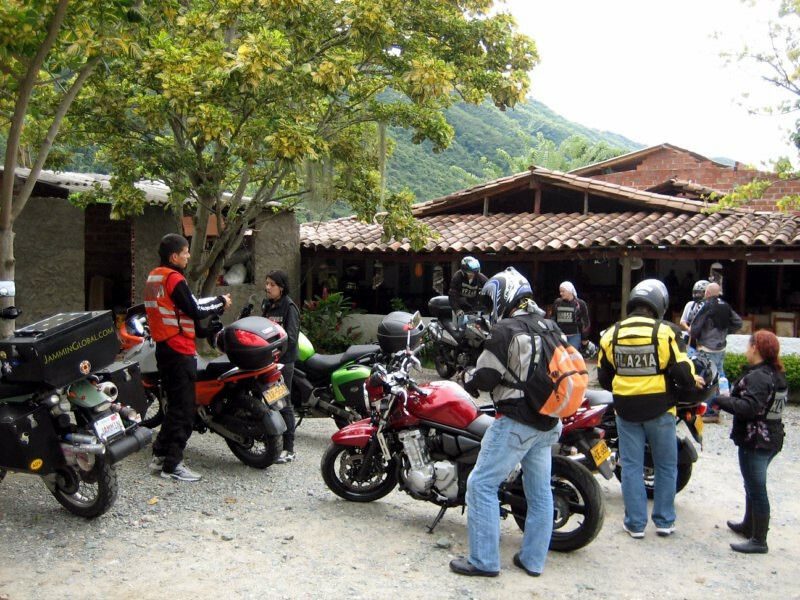 Suzuki is by far the most popular and well represented big name Japanese brand, probably partly due to the fact that they have a factory in Colombia near Pereira and assemble a lot of the bikes there, making them cheaper than the imported competition. Picking up some new tires for the road ahead. I got a set of Metzeler Tourances (non-radial) for $107, a really good deal. 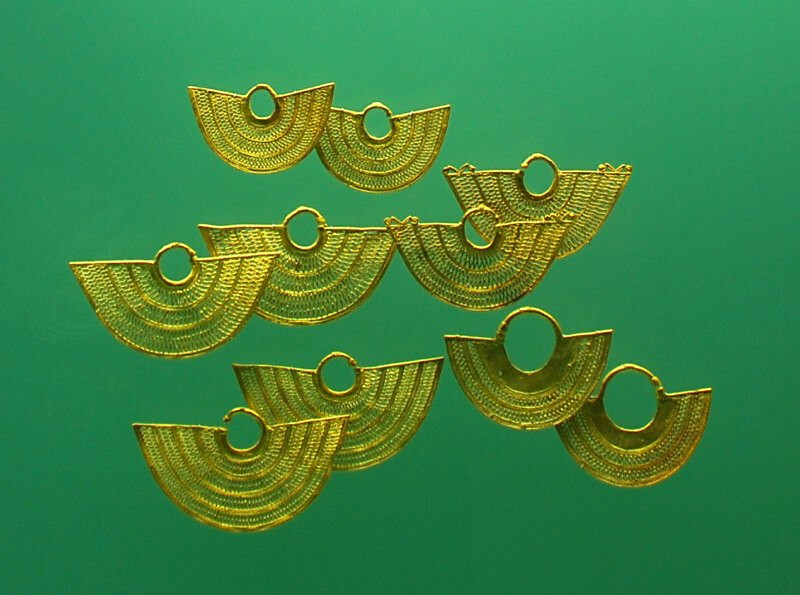 My Kenda’s still have some live left in them, so I’ll carry these and mount them when needed. Strapping the tires to the bike. The bike shop alley had lots of tire and spare part shops, but I couldn’t find a spare 525 Master Link for my chain. I have one spare, but was looking to see if another one was available. I picked up some heavy duty PVC rain pants for $10 since my rain liners require removing my pants to put them in; not convenient for afternoon rain showers. 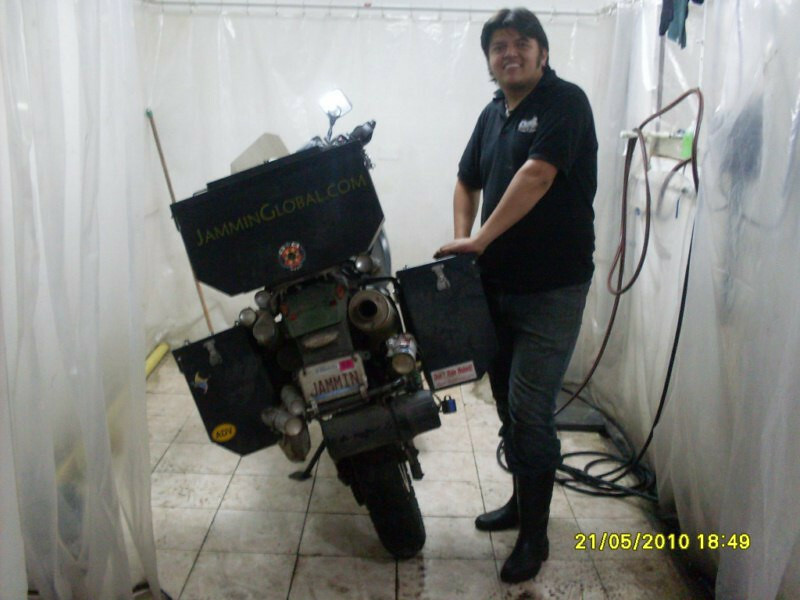 I stayed with Dario Fernando in his new motorcycle spa business. 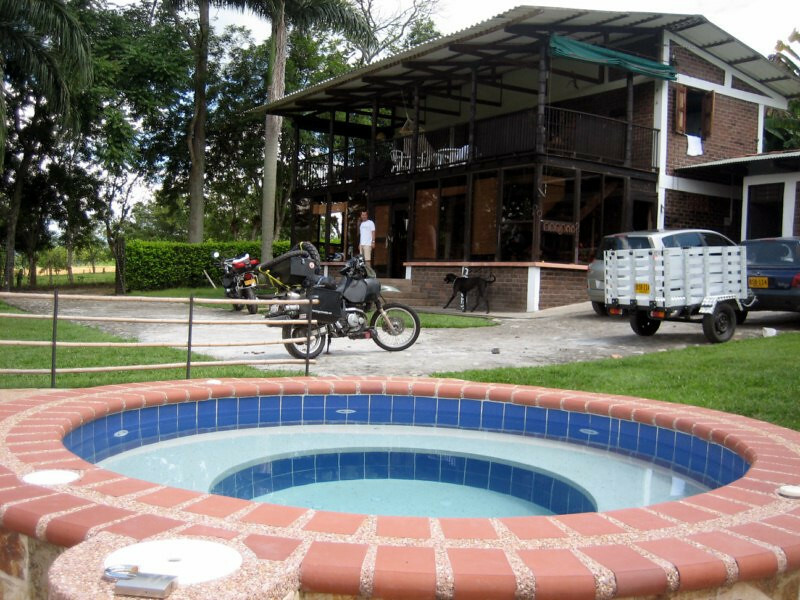 He recently moved from Pasto to seek better opportunities in the big city and having so many motorcycles here, a bike wash seems like a good idea (car and bike washes are all the rage in Colombia). 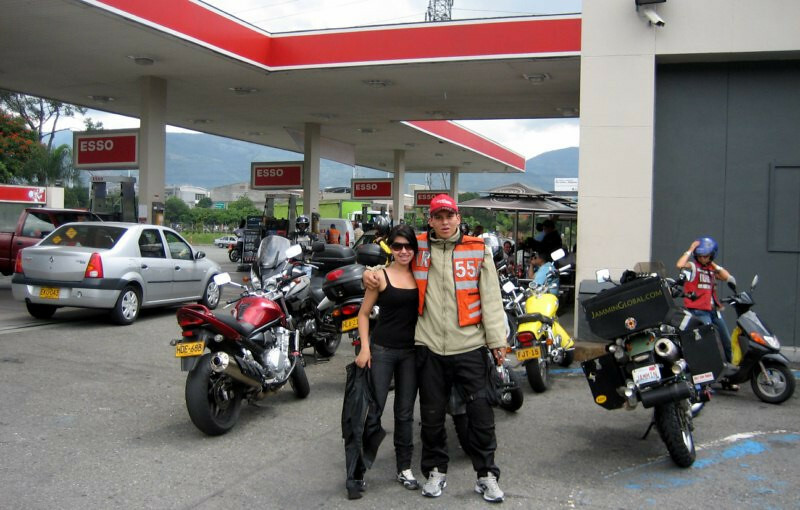 He’s riding a 180cc Bajaj Pulsar and has toured all over Colombia on it, that too with his girl friend on the back. He’s getting ready here to give sanDRina a good wash, the first since I bought her in 2008, haha. 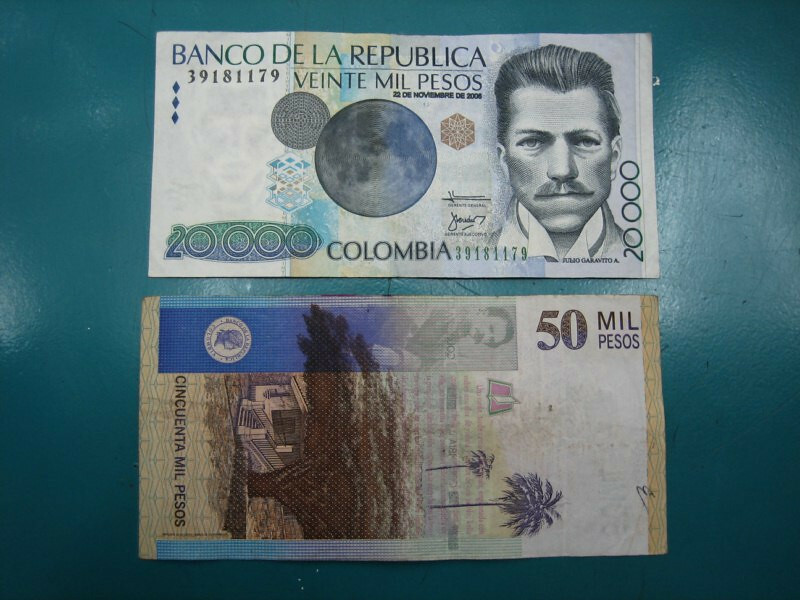 Colombian currency, the Peso. COP 2000 = USD $1. 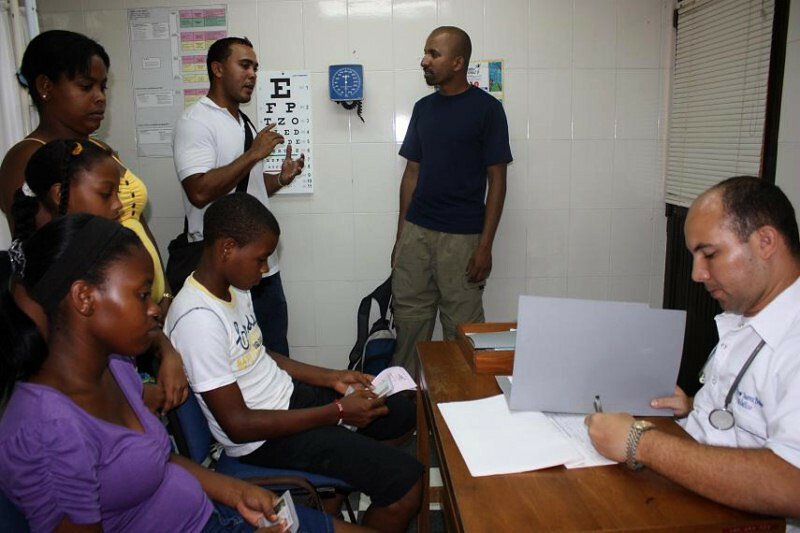 It’s easy to become a millionaire here but hard for those still learning Spanish since having to say big numbers is harder than small numbers, but I learned fast. 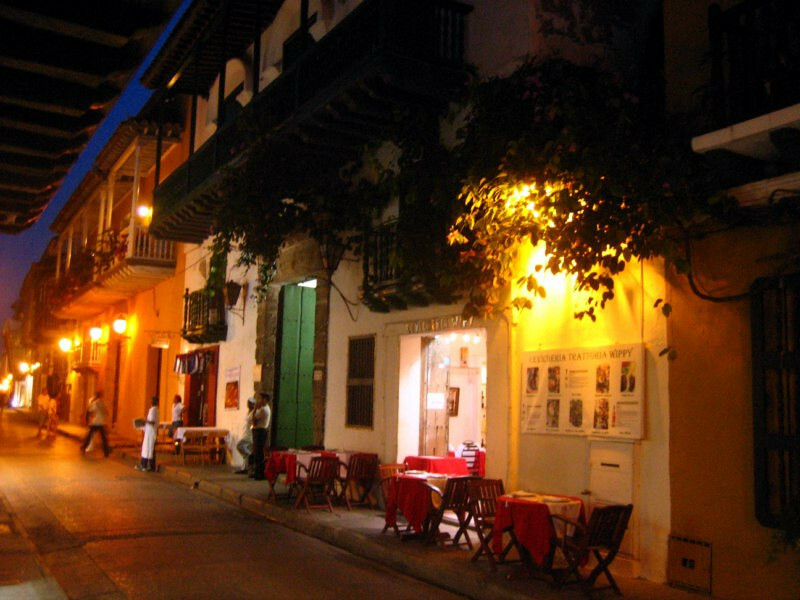 Hanging out in El Poblado, the central area with all the fine dining and bars and clubs. 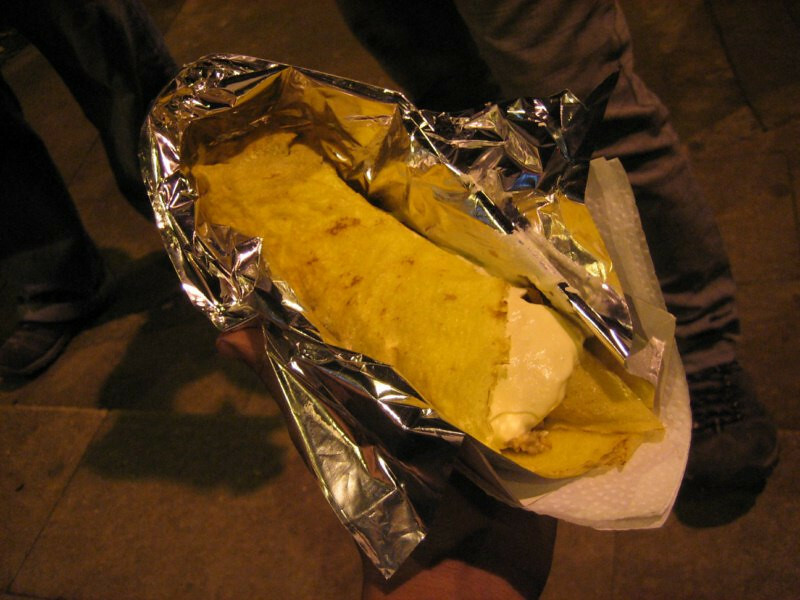 …filled with beef and cream cheese. 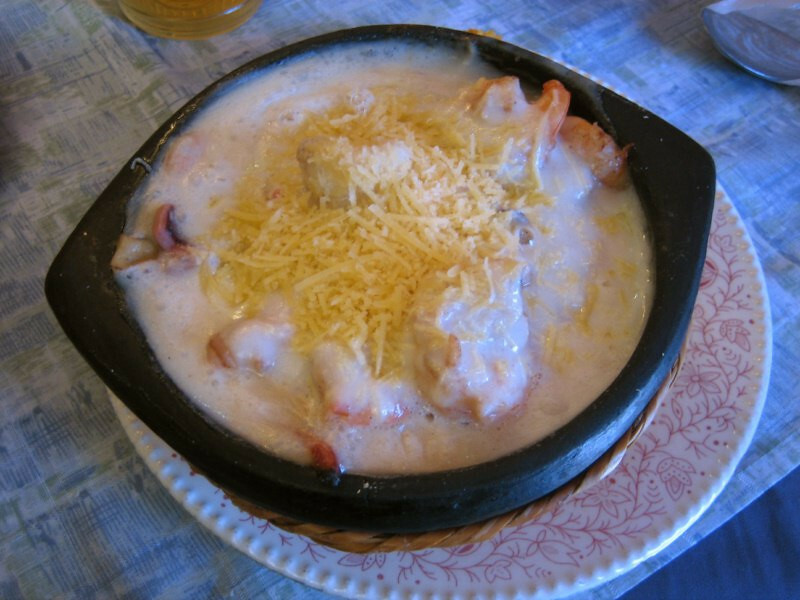 Very tasty and filling. 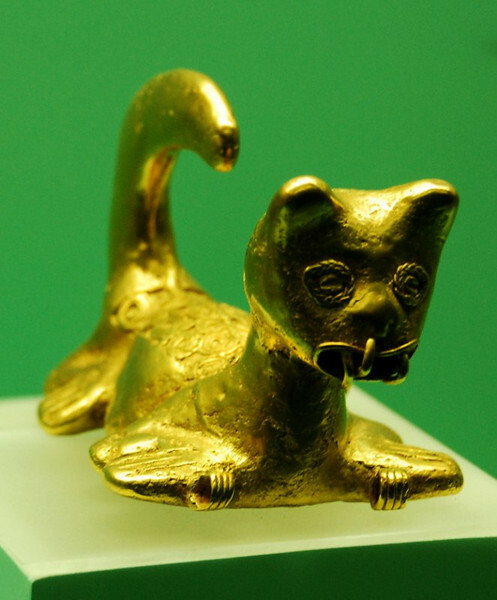 Cost about COP 8,000. Walking around and people watching. 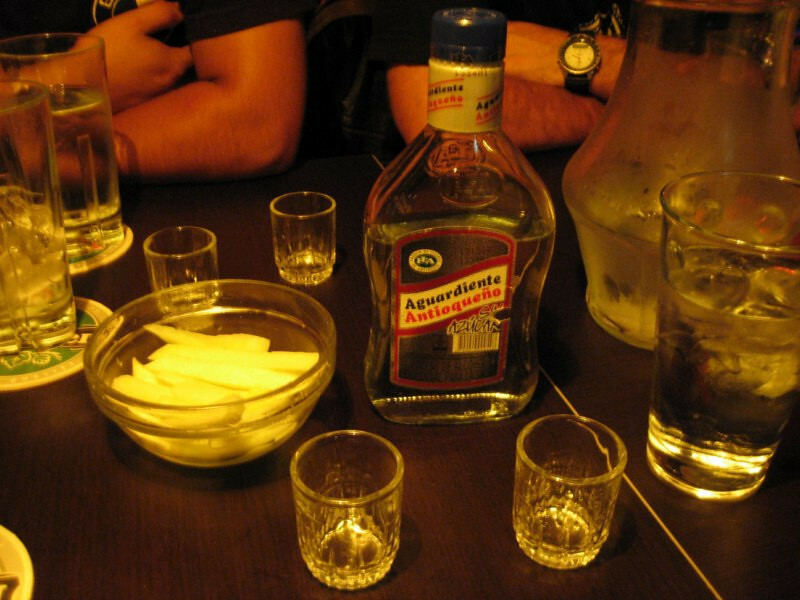 Having shots of Aguardiente (meaning burning water), the most popular liquor in Colombia. It’s an anise-flavored liquor derived from sugarcane, similar to Absinthe in taste, but was only 58 proof alcohol and not that strong. Even after a couple shots, I wasn’t feeling any effects. It came with some raw mango that went well with it. My hosts in Medellin. L-R: John David’s girlfriend, John David (Dario’s brother), Jaime Andres, Ana Marie, Dario Fernando and me. 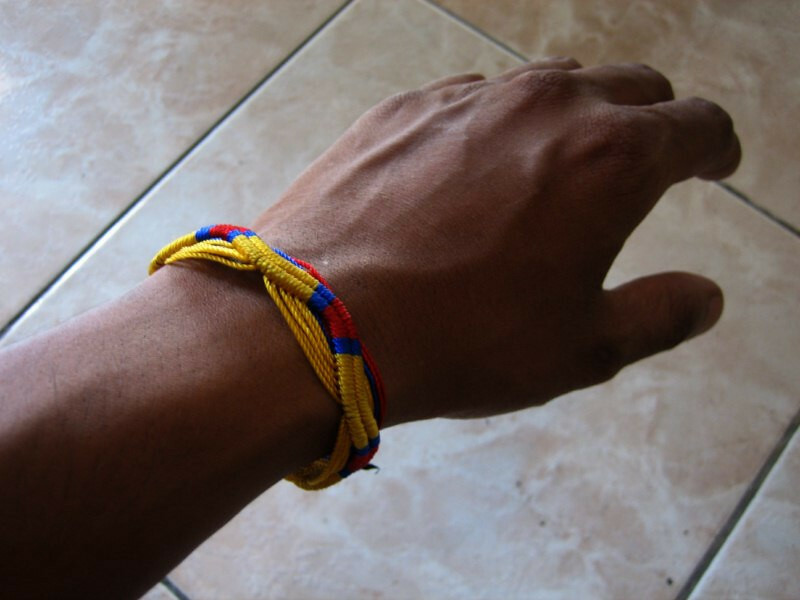 Being presented with a Colombian friendship bracelet from Jaime. Taking off for a day ride with my newly washed sanDRina. She was sparkling thanks to the treatment at Clean Xtreme Moto Spa. 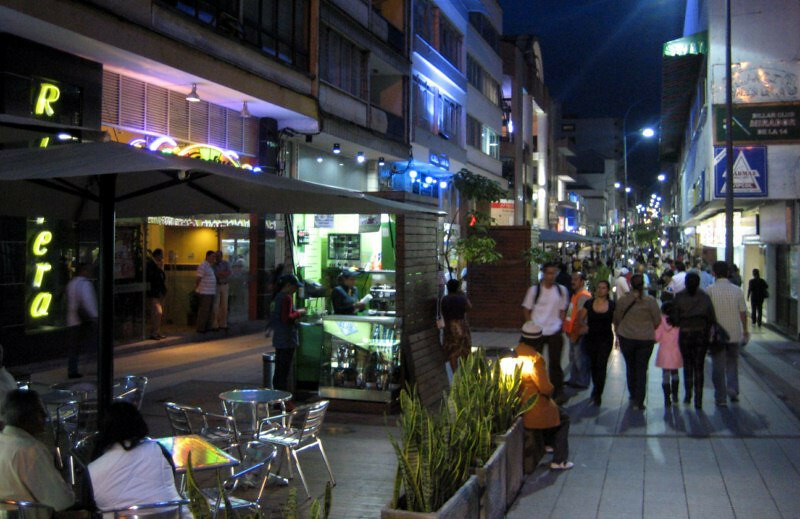 Following Jaime and Ana Marie through the fun traffic of Medellin. 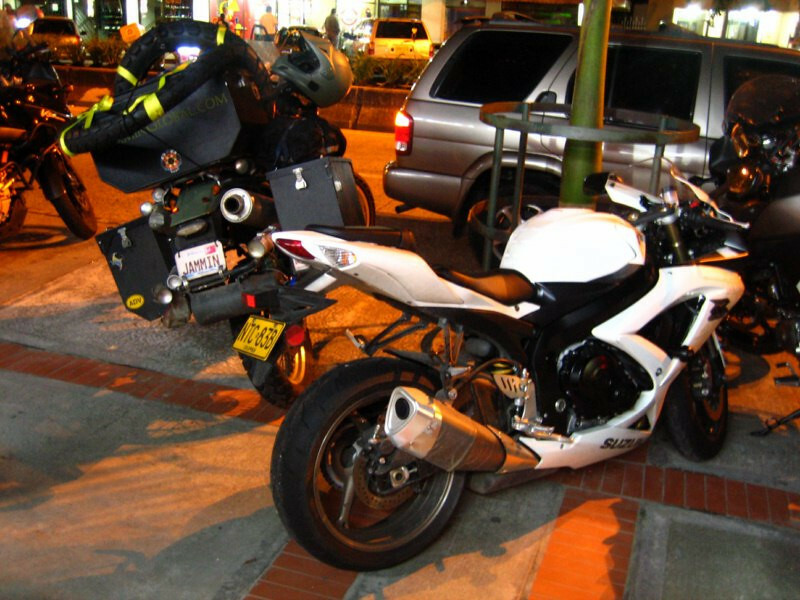 I had no problems lane-splitting and haven’t scraped a car yet. It helps that the panniers aren’t wider than my handle bars, just. 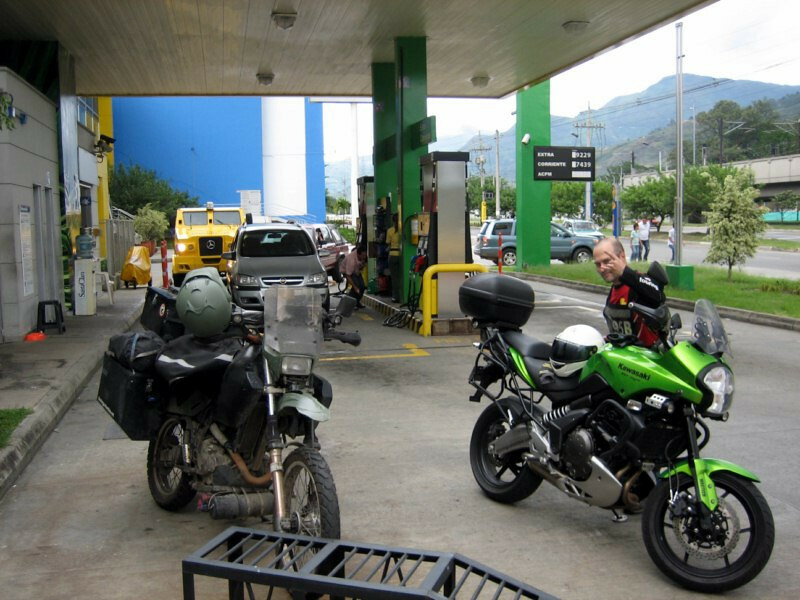 Meeting up with the crew at an Esso gas station, where the route for the day was discussed. 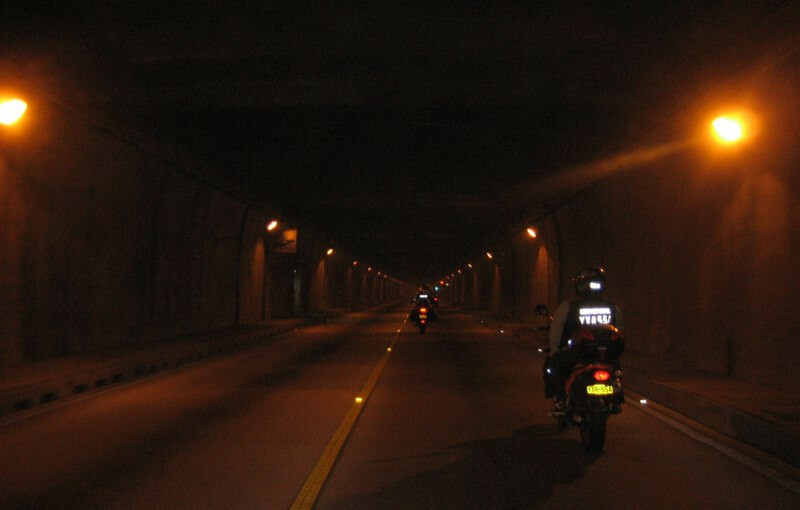 Taking the Fernando Gómez Martínez Tunnel (the longest in South America) at 7.4 kms (4.6 miles) through the mountains heading to Santa Fe de Antioquia. The ventilation wasn’t that good in the tunnel and the air was heavy with exhaust. 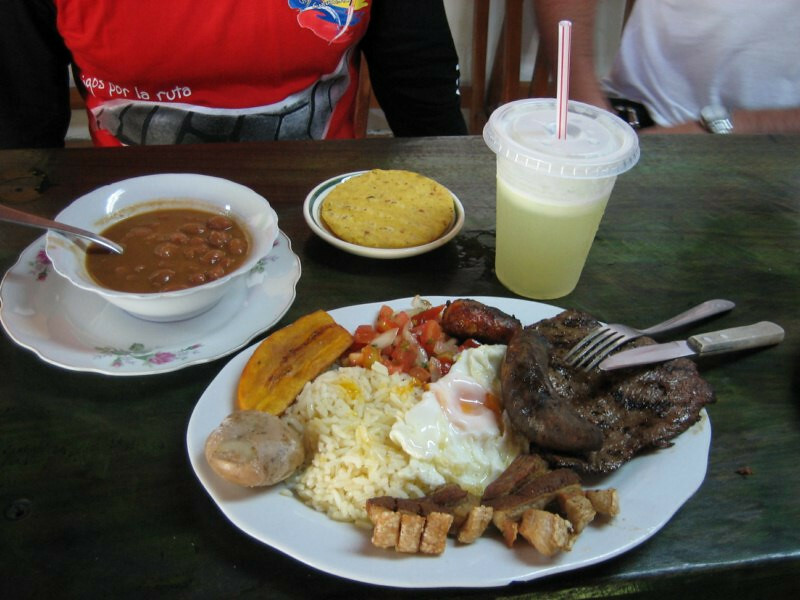 Having the typical meal of the region: Bandeja Paisa, a heart attack on a platter: rice with steak, chorizo (different from Mexican chorizo), pork blood sausage, chicharrón (crispy pork rind with some meat on it), a fried egg, a potato, fried plantain, a small salad of tomatoes and onions, bean soup and an arepa (typical Colombian corn bread, thicker than a tortilla) along with some fresh lemonade. What a meal to have while riding. And can you believe, this was the half portion! Cost about COP 16,000 ($8). Waiting it out for a bit before hitting the road. I can’t believe I ate all that. 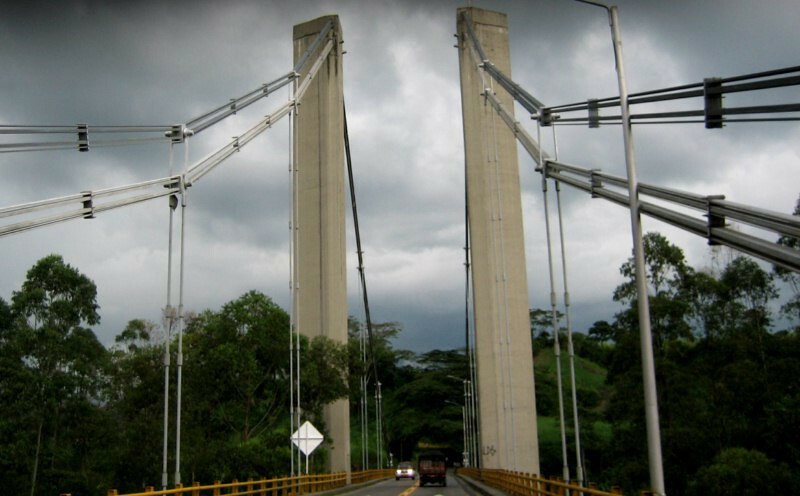 At the main attraction of the day, Puente de Occidente (Bridge of the West, so named as it lies in the west of Antioquia department). 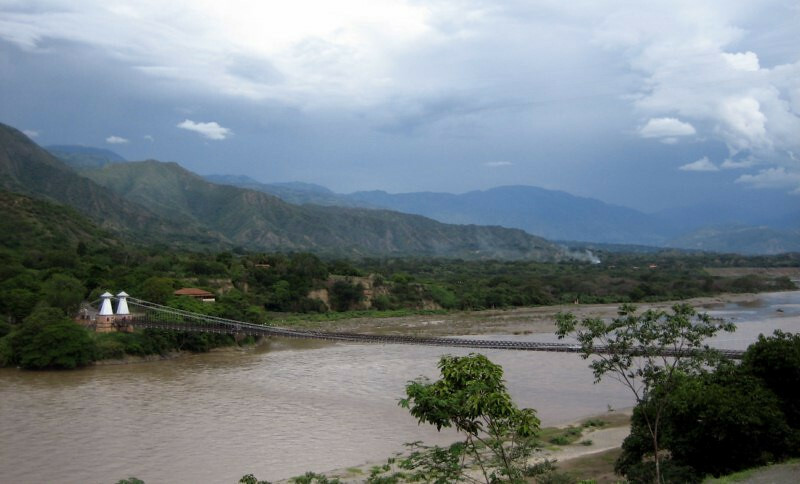 The handsome Puente de Occidente, constructed in 1895 connecting the towns of Olaya and Sante Fe de Antioquia across the muddy Cauca River. 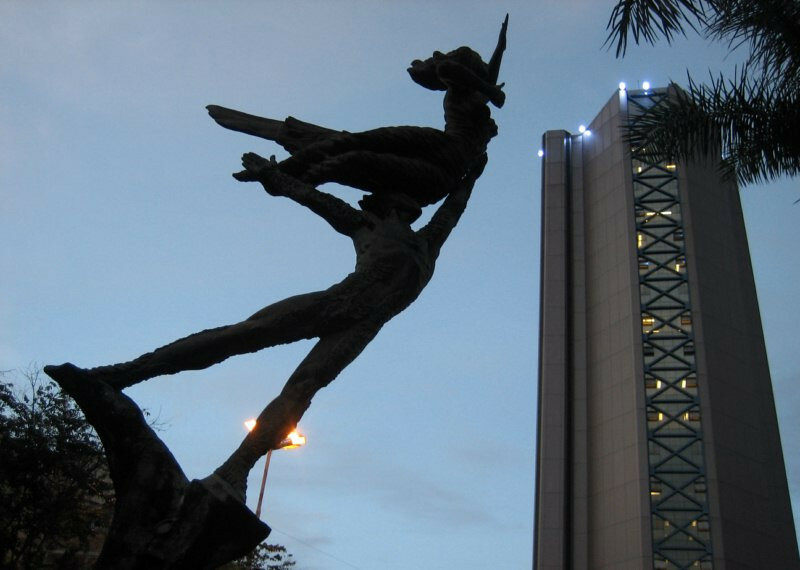 It was designed by José María Villa and when it was finished, it was the longest suspension bridge in South America with a span of 291 meters. 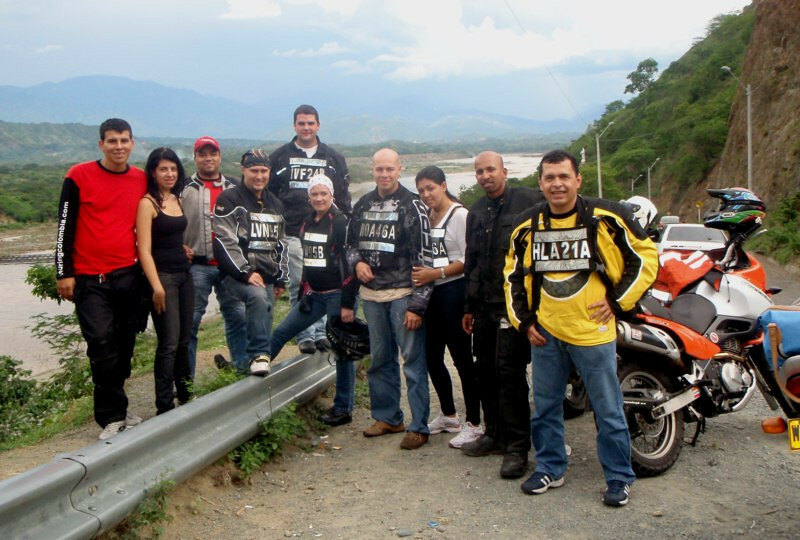 The riding crew from Medellin’s TouringColombia chapter. 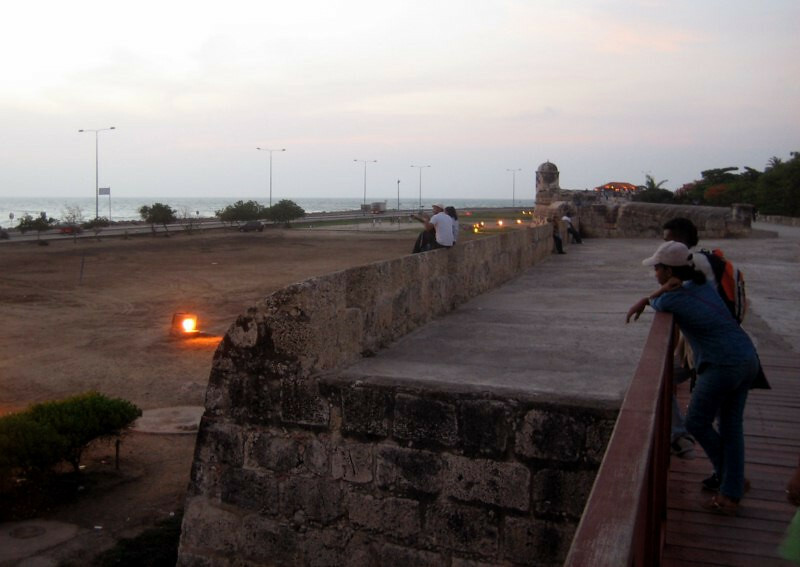 Riding across the Puente de Occidente. The wooden boards clatter as you ride across and the sound echoes in the valley. 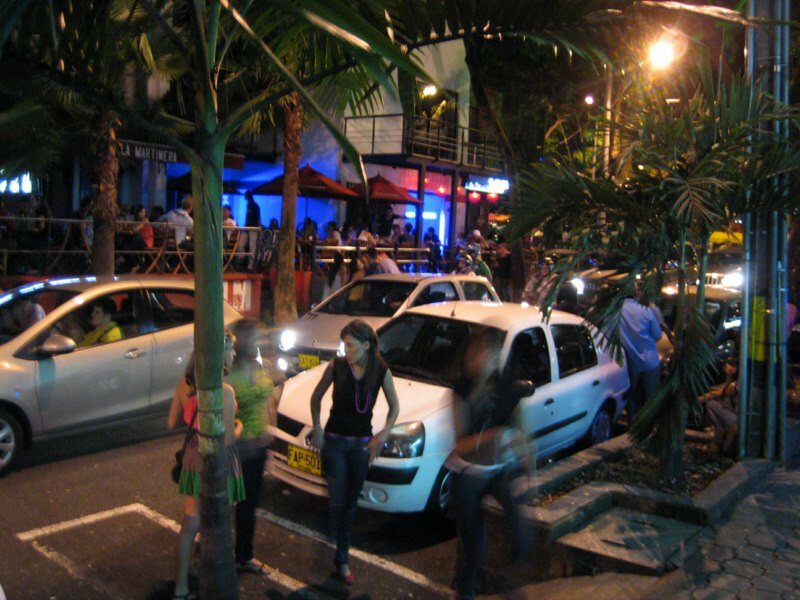 Initially, it was only meant for pedestrian traffic but later one-way vehicular traffic was allowed. 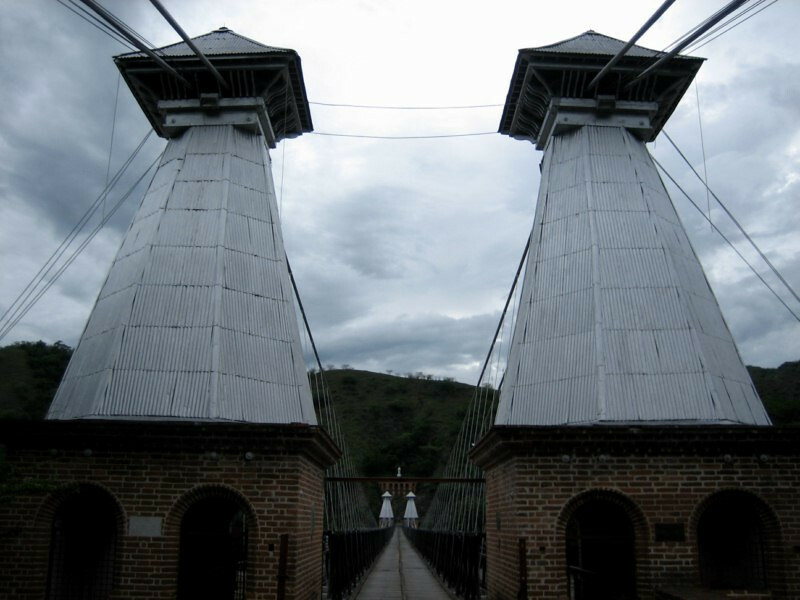 The towers of the Puente de Occidente covered in galvanized sheets to protect the underlying wood structure. 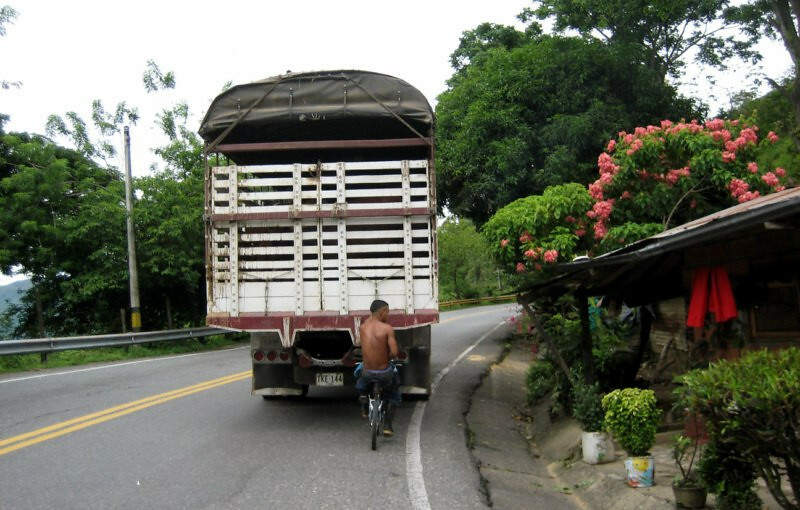 Riding 30 kms (18 miles) further along tight twisty roads to Olaya, a small remote town that was once a FARC stronghold. The church was riddled with bullet holes. 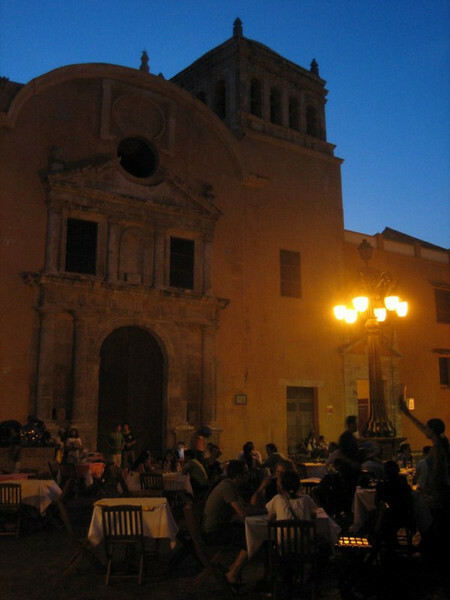 Relaxing in the square in Olaya. Good riding crew and nice to be on a group ride. 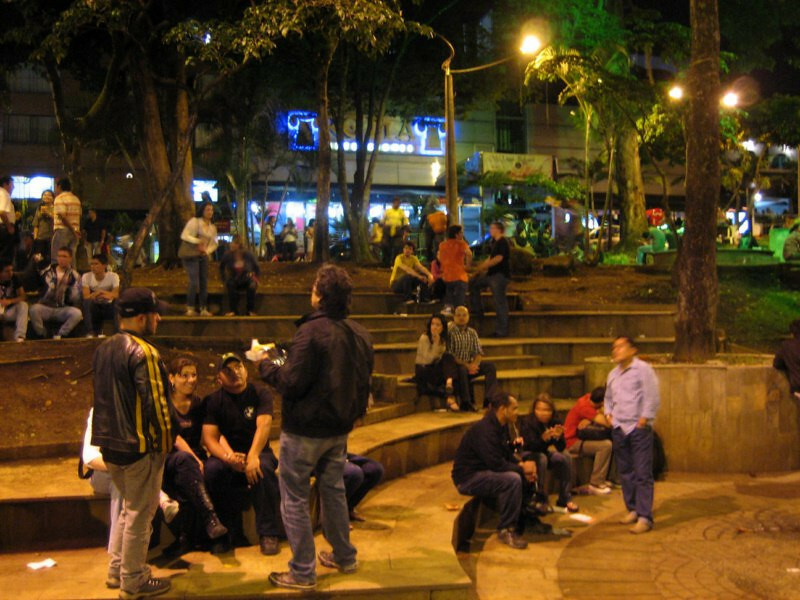 Having a few drinks and snacks in the central plaza of Sante Fe de Antioquia, the capital of the region before Medellin got the honors. 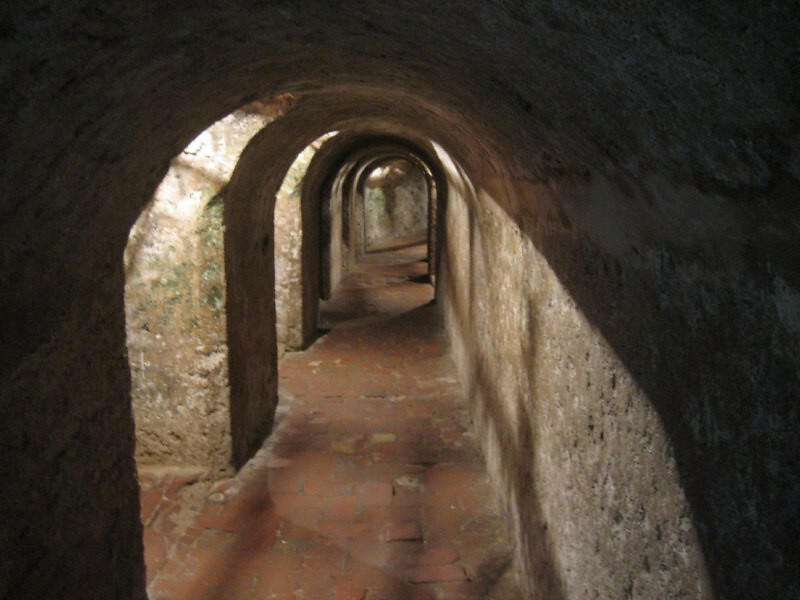 It was founded in 1541 to facilitate gold mining and the cathedral was completed in 1799. 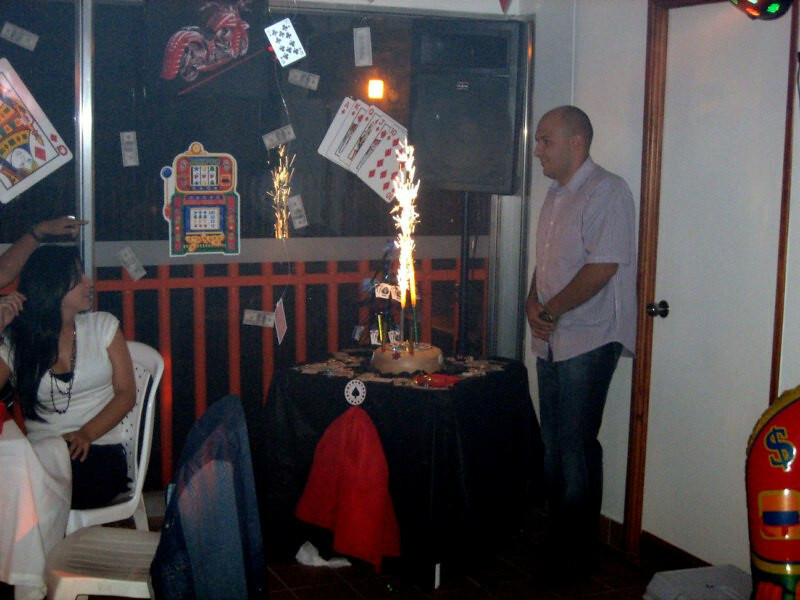 That evening was the birthday party of Cesar, one of the riders in the chapter and he invited all his TouringColombia friends for a celebration. Sparklers in the cake. 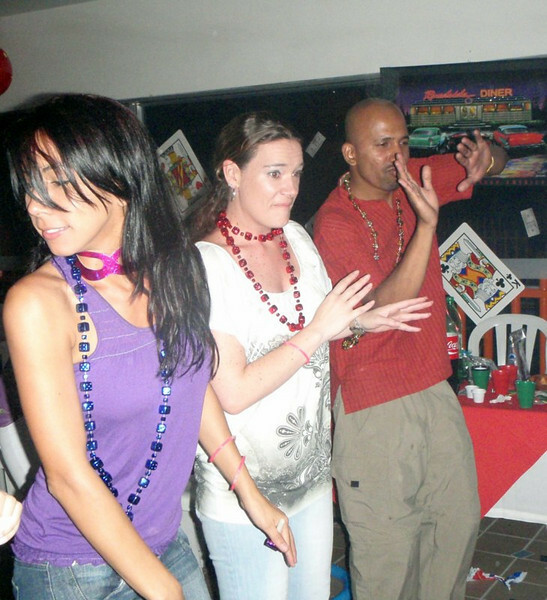 After dinner and a comedy show, the dancing began. It got a bit wild. 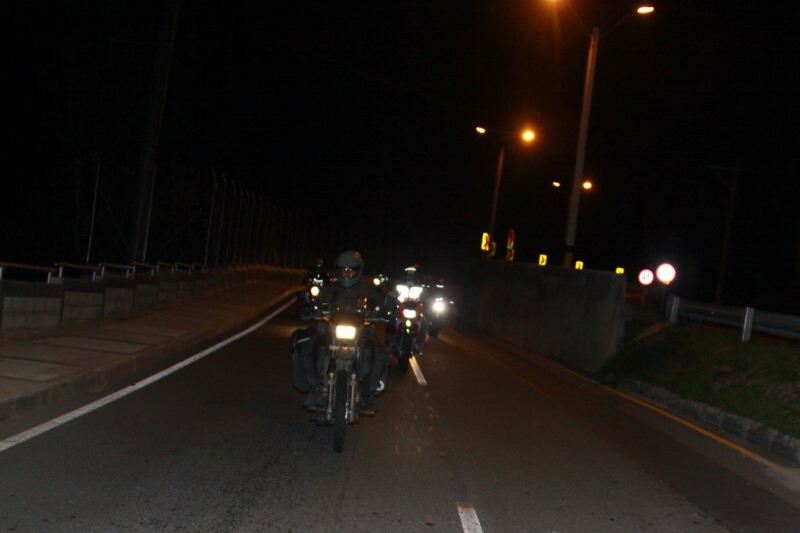 And since none of the other guys were dancing, all the girls were dancing with me 🙂 The party went on till about 3 in the morning and we had to be up for another day ride. 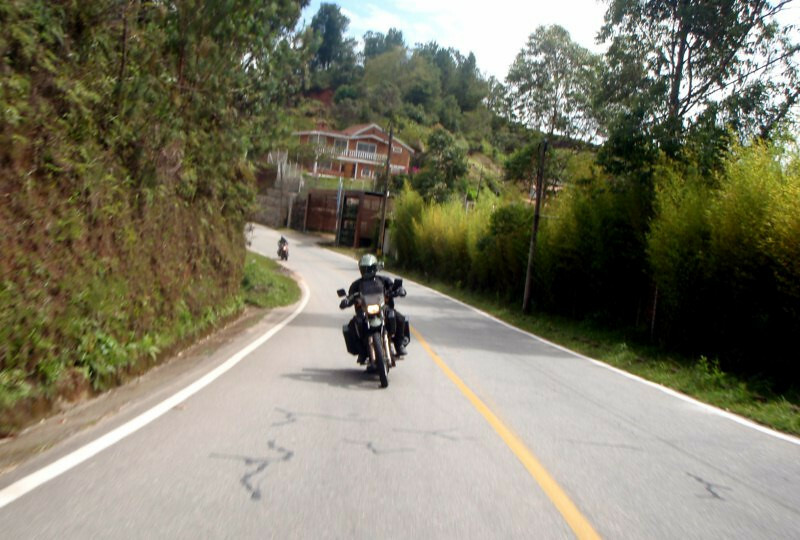 Day ride on Sunday to Guatapé with Radman on the Suzuki Bandit 600. 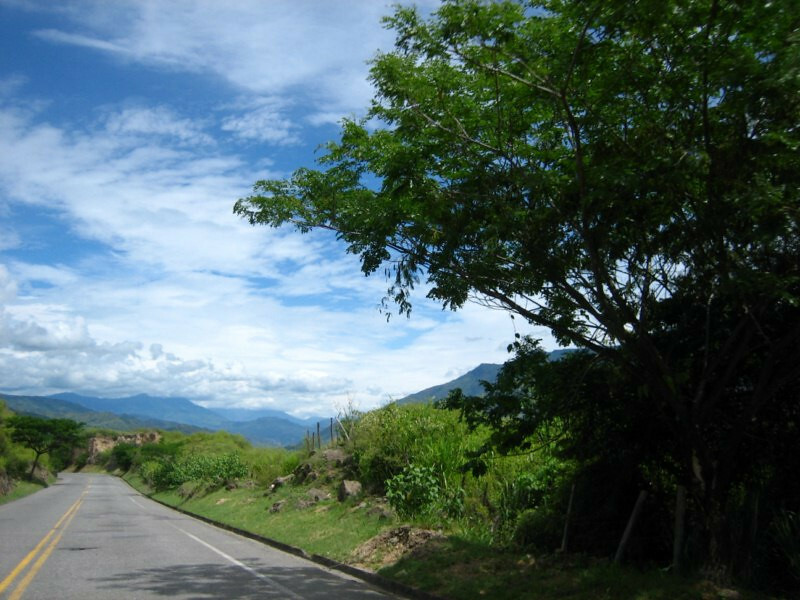 Good roads heading to Guatapé. 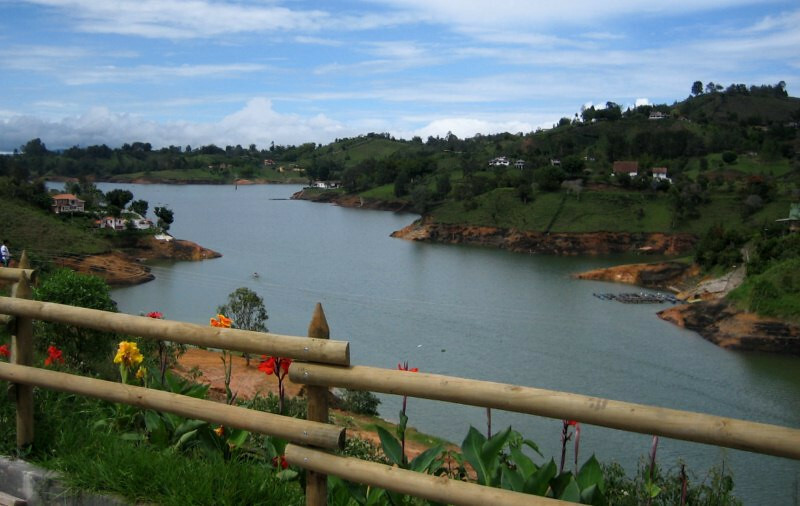 A small part of the flooded landscape that is part of the reservoir of the Peñol-Guatapé hydroelectric project. 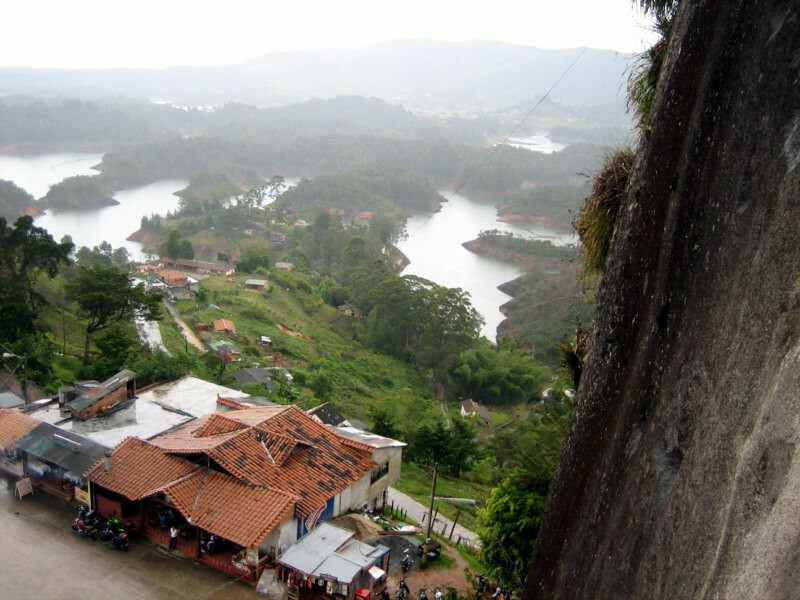 El Peñón de Guatapé, a large monolithic granite rock, rising 200 m (656 ft) above the ground. 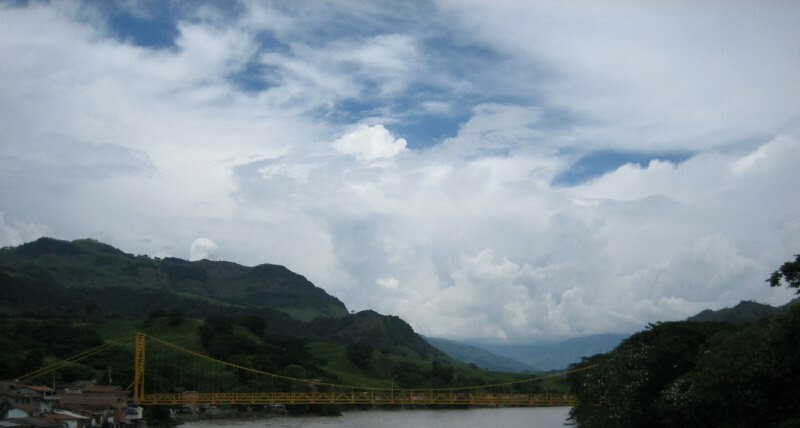 Panorama of the Embalse de Guatapé, the reservoir that was formed in 1970s. Click here to see the high resolution version. 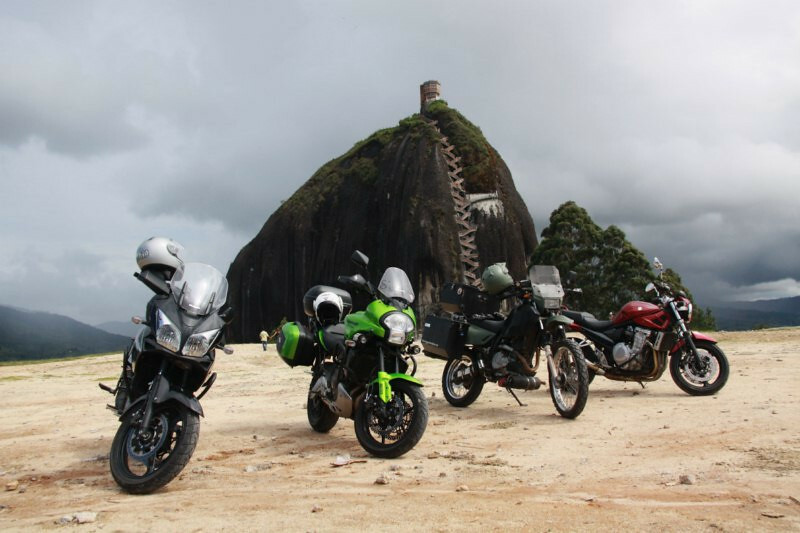 The four bikes of the day at El Peñón de Guatapé: Suzuki V-Strom (very popular all over Colombia, costing about $12,000 here), Kawasaki Versys, Suzuki DR650 and Suzuki Bandit 600. 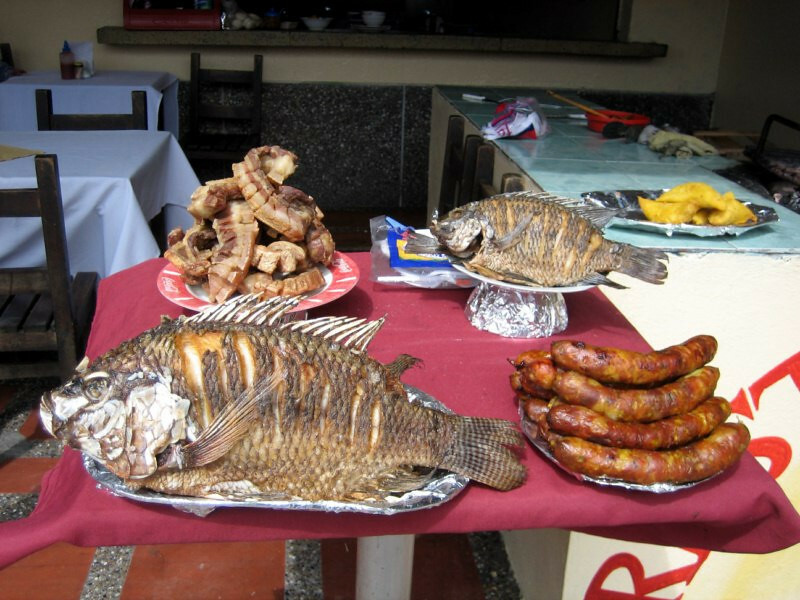 Typical food on display: fried fish, chicharrón and sausage. 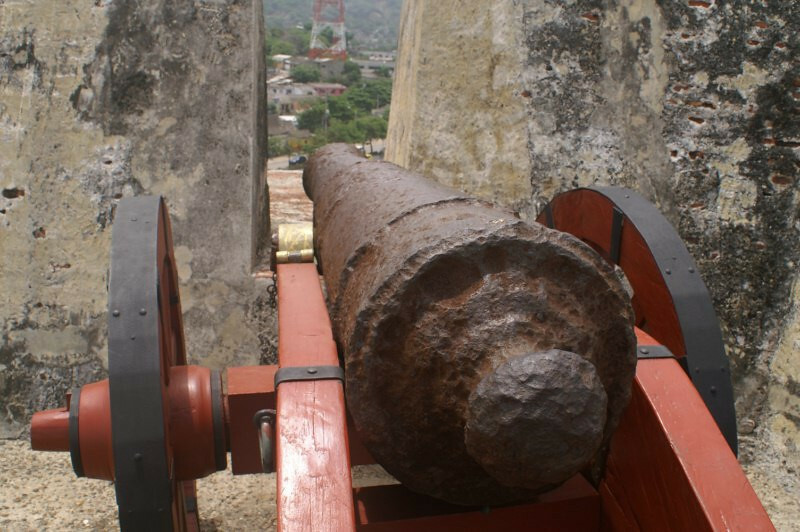 There are 649 steps leading to the top that were built into crack of the otherwise smooth and unbroken granite rock. Taking a break half way up. 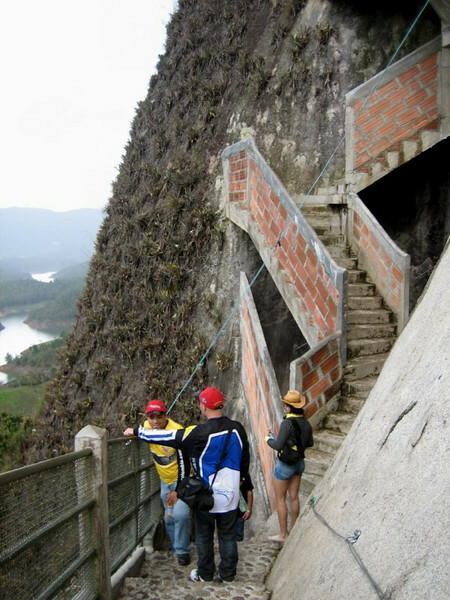 A dizzying look at the remaining steps leading to the top. It took about 20 minutes and was a bit dicey as it was raining and the steps were slippery and that too I was in my motocross boots. But the 360 degree panoramic view from the top was worth it. Click here to see the high resolution version. Rain clouds were moving in but the view was surreal. Islands dotted the landscape as far as the eye could see. The flooding for the reservoir began about 40 years ago and it looks a bit ill-conceived. Jaime said swimming is not advised since lots of trees and plants are just below the water surface. 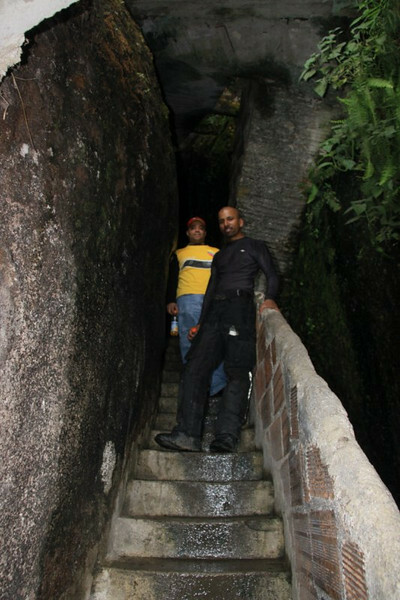 The climb back down the narrow, slippery steps. 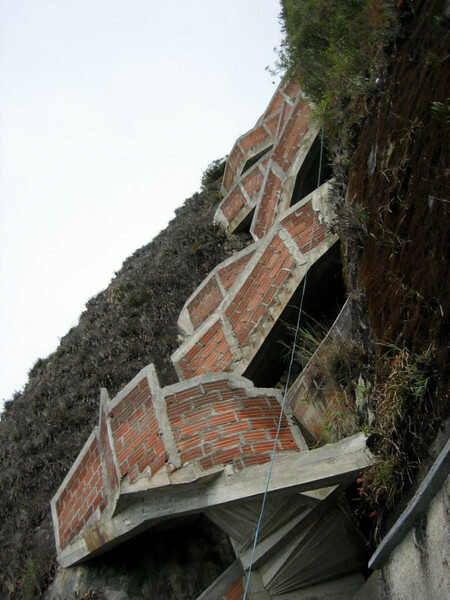 At least there were separate staircases for uphill and downhill traffic. View from about half way down. The bikes are in the lower left. 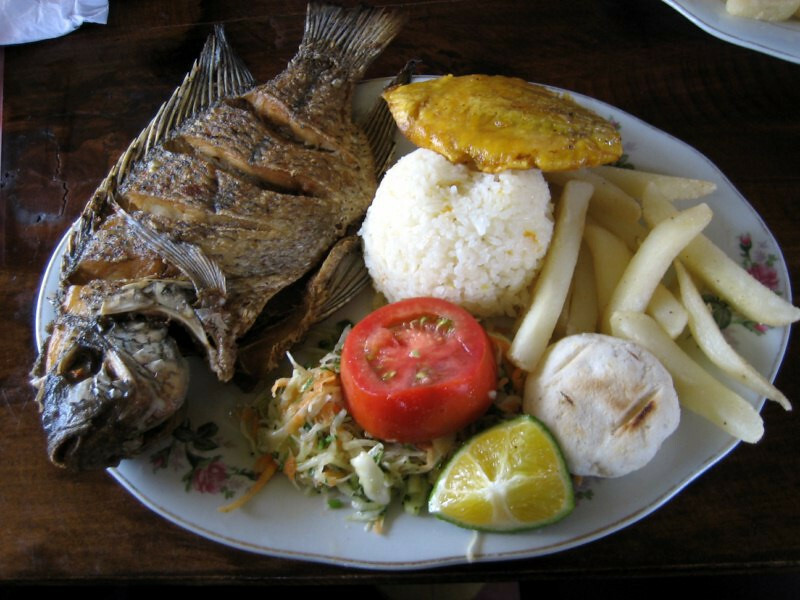 Lunch of fried fish, Corvina with rice, fries, patacone (plantain), a salad and a gorda arepa. I didn’t really like this kind of arepa as the center was uncooked and tasted of raw corn, but it was offered with most every meal. 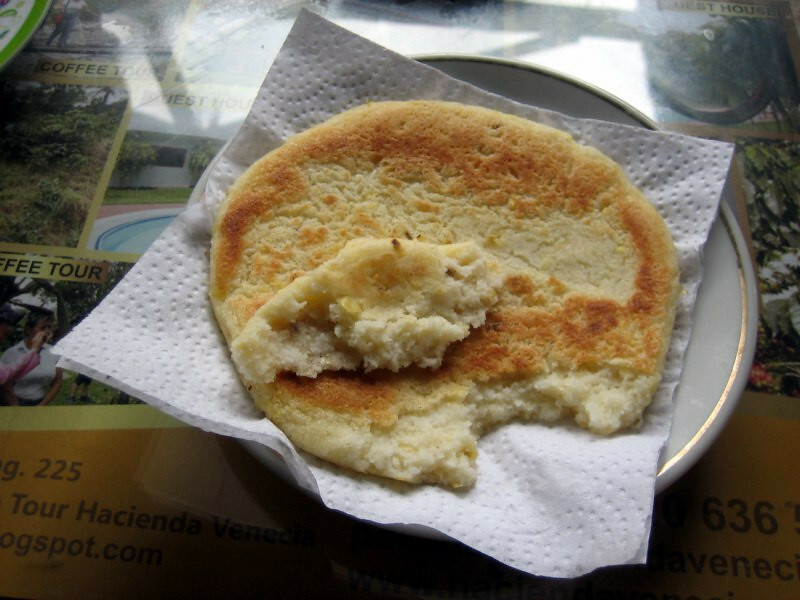 There are many different kinds of arepa and I liked most of them, especially the ones that were re-fried with an egg and some meat. 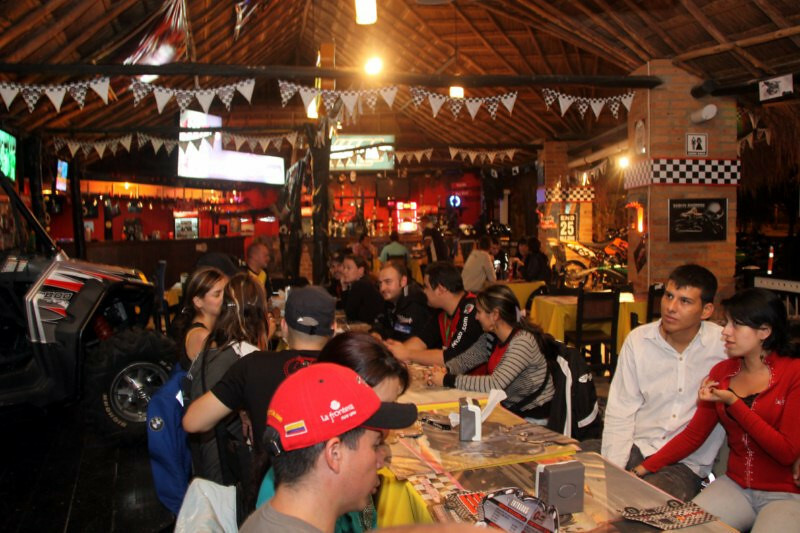 Last night in Medellin at Dario’s Moto Spa. 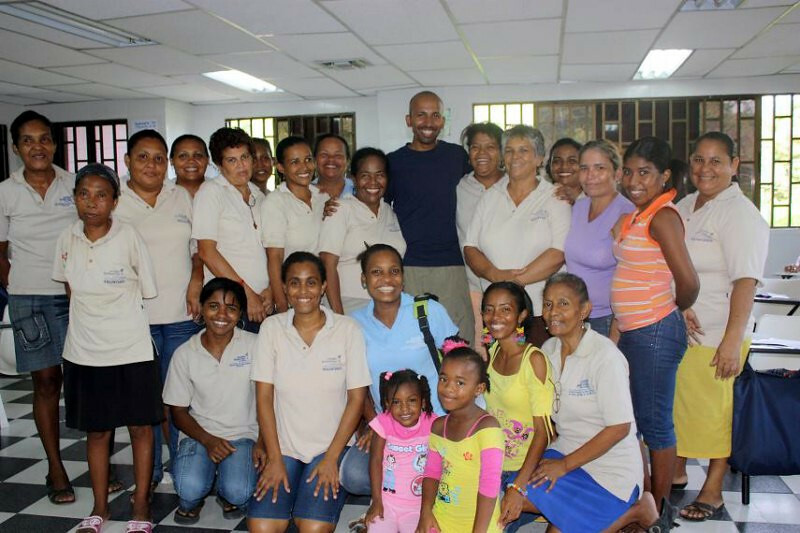 I had a wonderful time in Medellin and truly felt welcomed with the warm spirit of the Paisas. I finally started recording with my GoPro and here’s the first video. 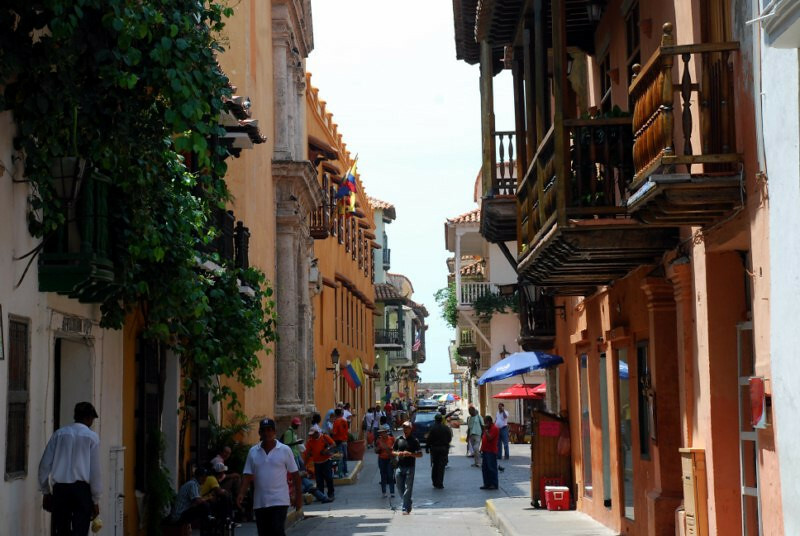 It’s heading up from the small town of Caucasia up the mountains to Medellin. 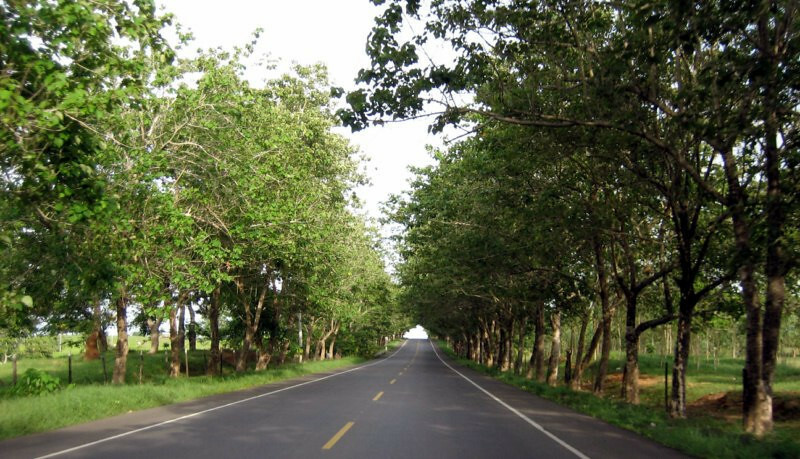 This is a main north-south highway, Route 25. Good quality roads but as expected, lots of trucks and overtaking on coming traffic.